This page is something that I’ve been meaning to do for some time but just don’t seem to be able to get around to. I suppose one of the reasons is that it’ll be a “live” and ongoing page and as such I will need to keep it fresh and relevant. 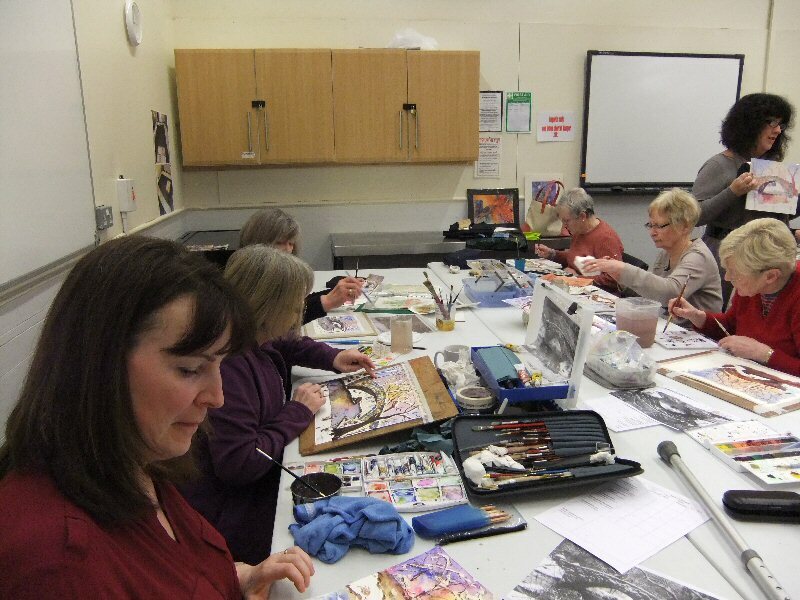 It’ll be a kind of time machine for the Art Group, showing what has happened recently and then increasingly into the past as you scroll down the page. Is it too soon to apologies for the content? 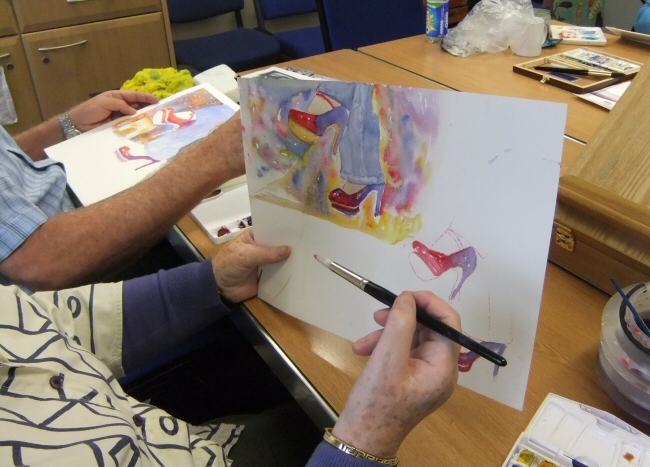 We welcomed Judith back for another loose watercolour session and had lots of fun completing paintings of shoes. I know…..shoes…… who would have thunk it……. well, Judith would and marvellous it was too. 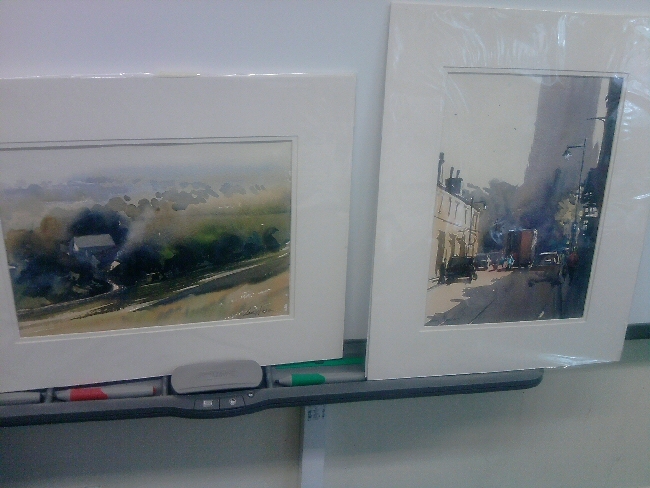 Below we can see the source photo……taken, if my memory serves me well, by a member of Judith’s own art club……. so credit to that person. 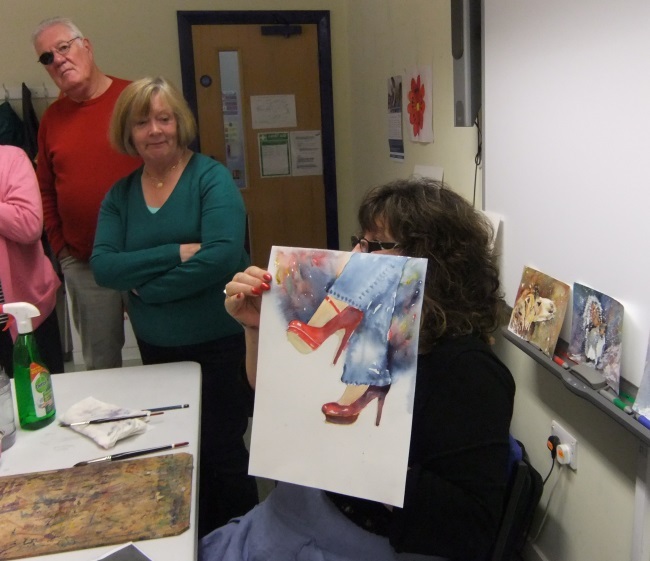 Judith had brought a number of her paintings with her, including “one I did earlier” of this subject (actually she’s done a number of paintings of this subject)…..below: You can see a small painting of Judith’s to the right of the shoes that is intended to be used as a Christmas card. 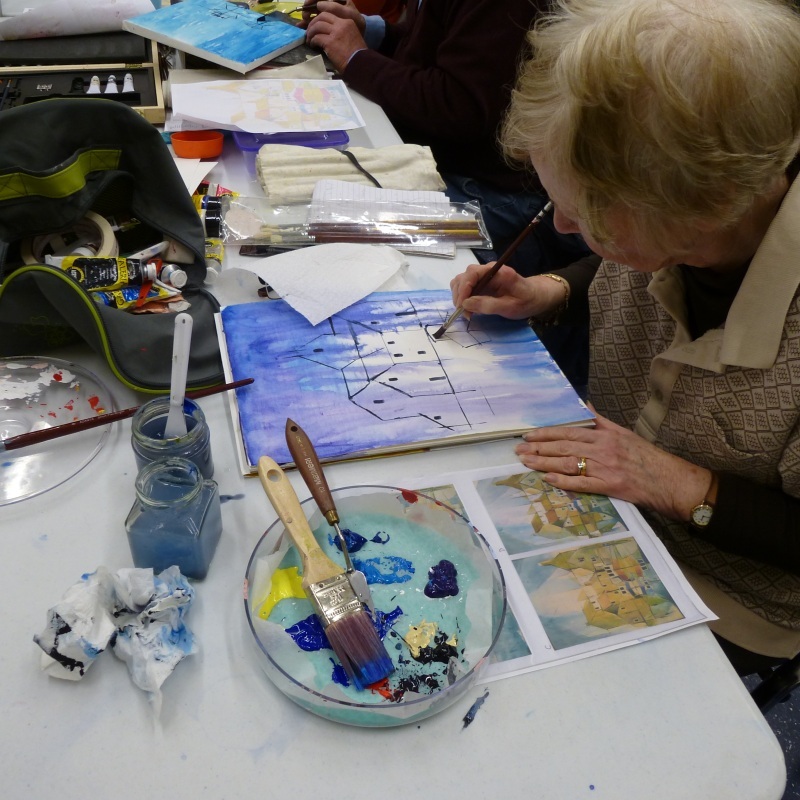 Judith is a fan of loose watercolour……and not fretting too much about painting….. be relaxed and just have a try and you might just surprise yourself with the results. 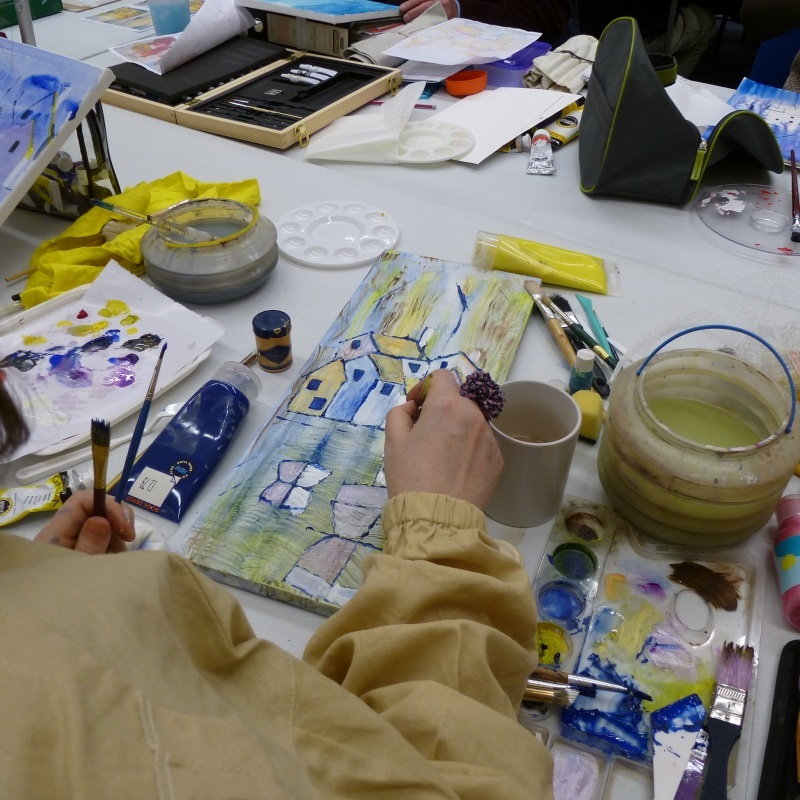 She does such a good job of engendering this ethos that everyone does just that…… gets the loose watercolour bug and they have a go at following Judith’s lead. As we can see above Judith has already created the red shoes (the dozy cameraman, ie me, didn’t get any photos of the earlier stage) You can see that she has left areas of white to represent glints of light. The main thing that I got from this was the background, a very loose and dramatic addition that can really make the subject stand out and gives extra interest. This background technique can be used on any subject and you’ll see it applied to great effect in other paintings (further in down in this blog) of Judith’s. Above we can see Judith (well, almost……she’s hiding behind her painting) showing the group how effective these techniques are and below we can see her while she’s going around the group helping individuals. Possibly Judith’s main skill is the ability to inspire others to believe in themselves and to have the confidence to have a try……..a talent that’s a lot rarer than one might imagine. There are lots of good artists but not that many who can make others feel that they can do it too. 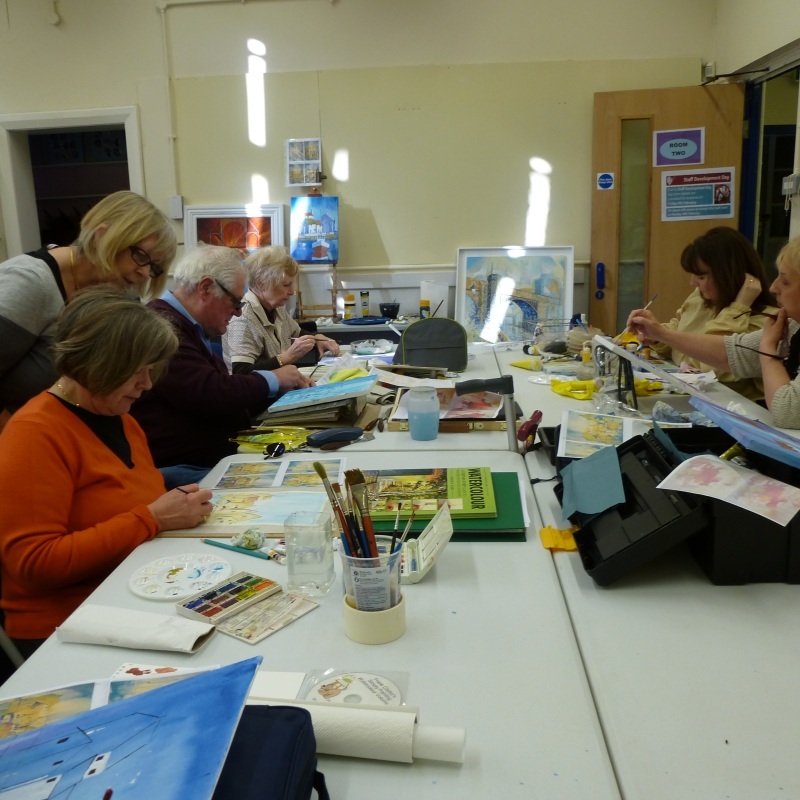 The following photos show a selection of the members doing just that, starting with Veronica who isn’t normally comfortable with loose watercolour….. but she’s creating a cracking painting. 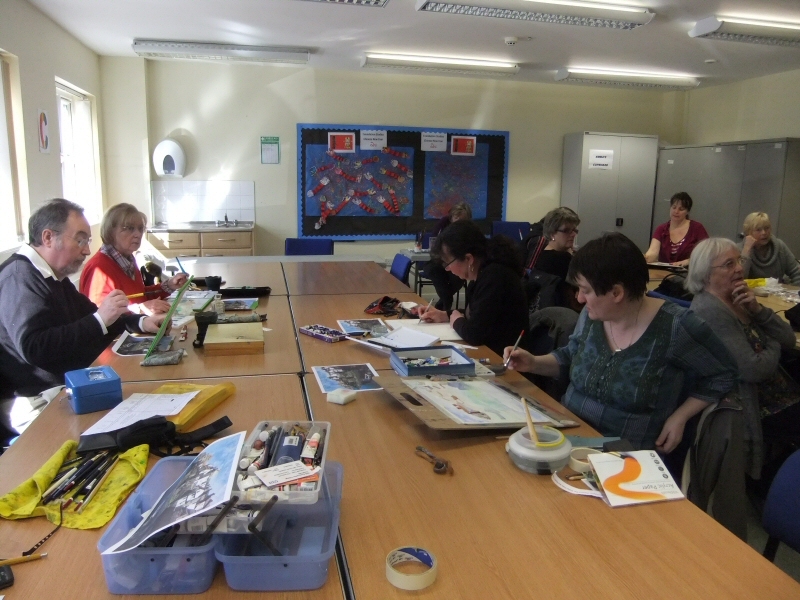 Above we can just about see Julie’s work in progress and below is Kathleen engrossed in her art. 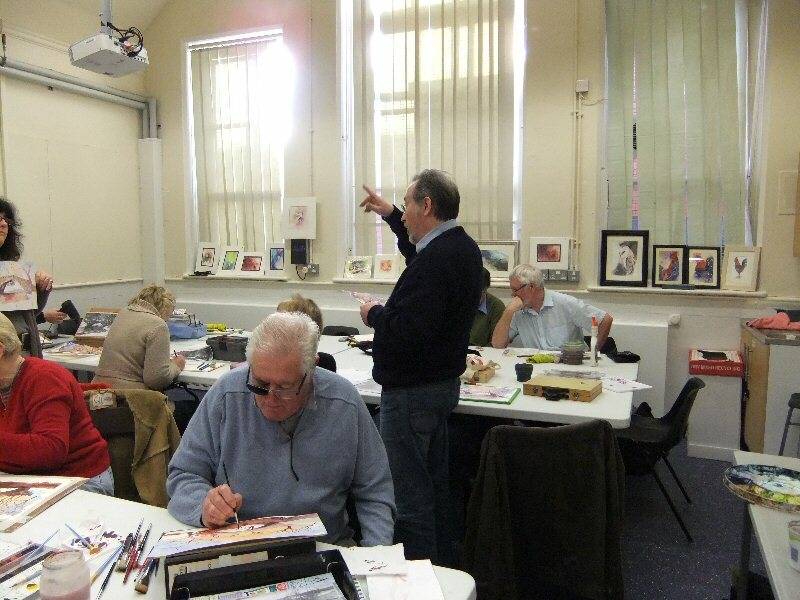 Above we can see Elise captured mid paint stroke (that cameraman has a lot to answer for you know)….and below is Bernard adding his won inimitable style to his painting. 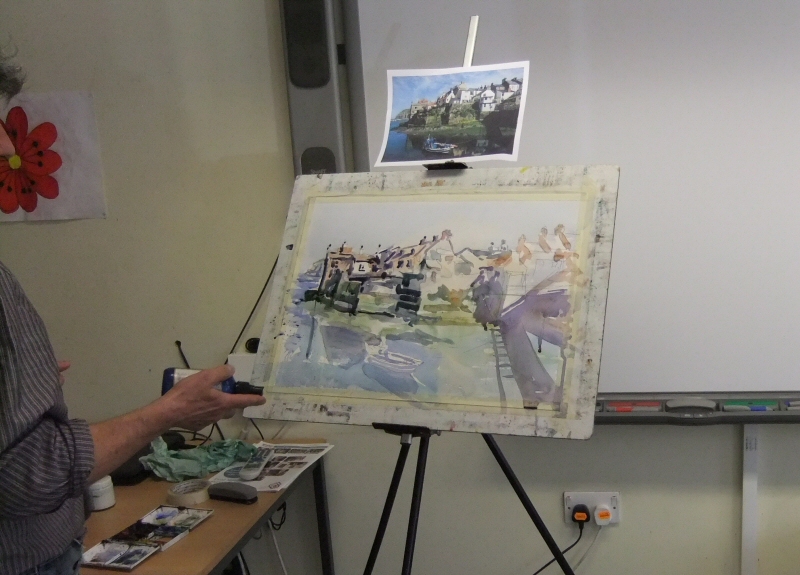 Above we can see Michaels painting progressing….and a smashing job he’s doing of it too. 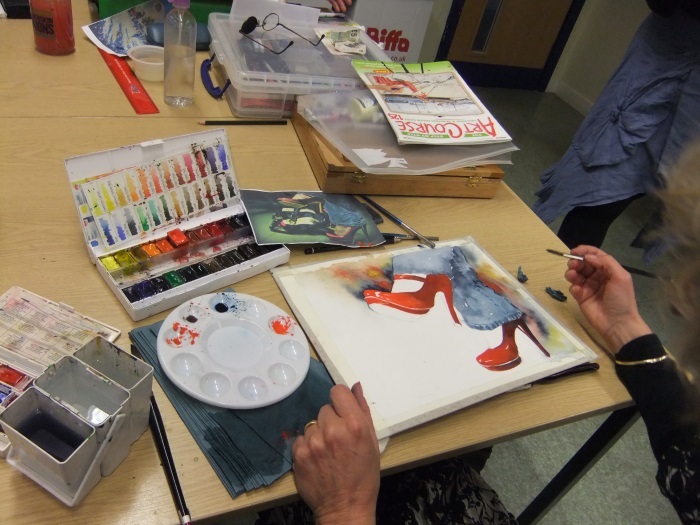 Below we can see Gwen busy with her painting of red shoes. 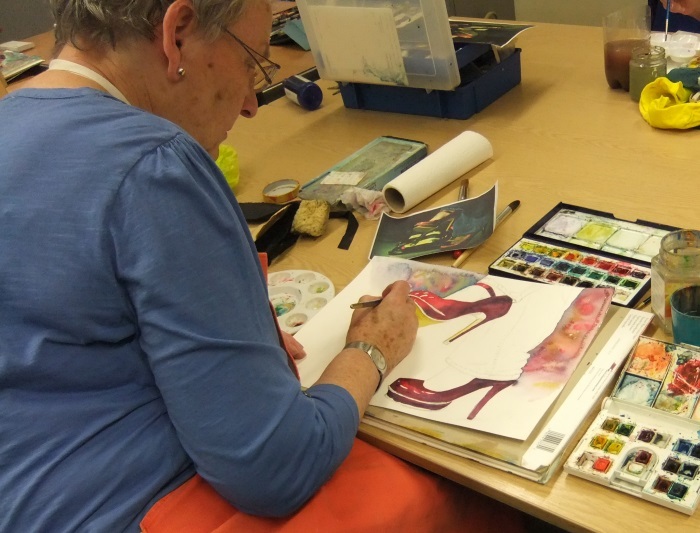 Above we can see Viv busy creating her version of the red shoes. 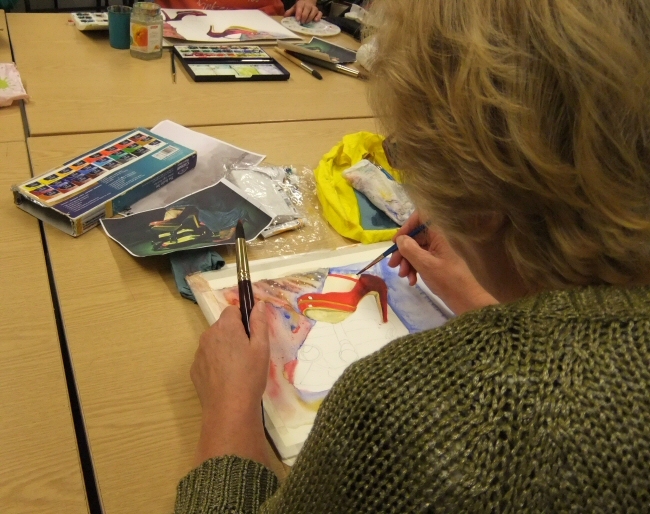 The glove is to protect her hand while she paints as she’d picked up an injury…….it’s not part of some secret watercolour process! Below is a photo of Barbara creating her own stylish version of the subject. It’s interesting to note the range of different versions of this one subject with particular reference to how each individual created the abstract background. 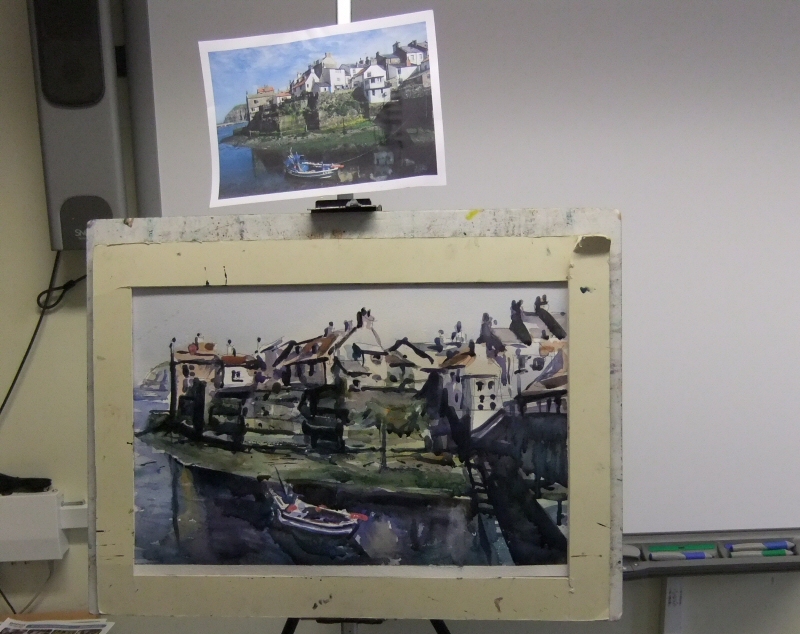 Below is Anne’s version of this painting and she’s taken the opportunity to paint a small practice study at one side. Judith’s session are always fun, informative, but above all fun. We look forward to her next session with us. 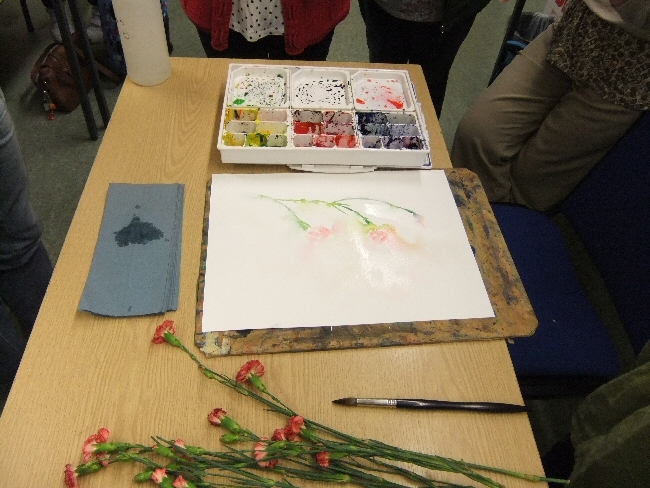 He also mentioned that rough watercolour paper (stretched) could be used but would require further preparation. This would be in the form of painting with white Gesso with a small amount of fine marble dust mixed in. 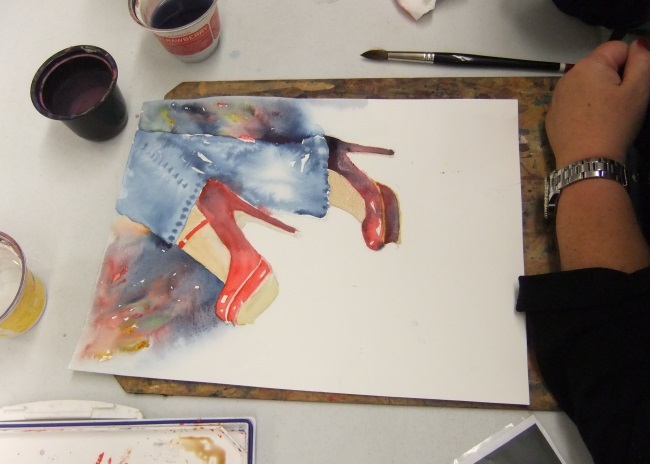 Other paint and colours could be used but the inclusion of the marble dust is to give the paper a “tooth” to take the pastels. 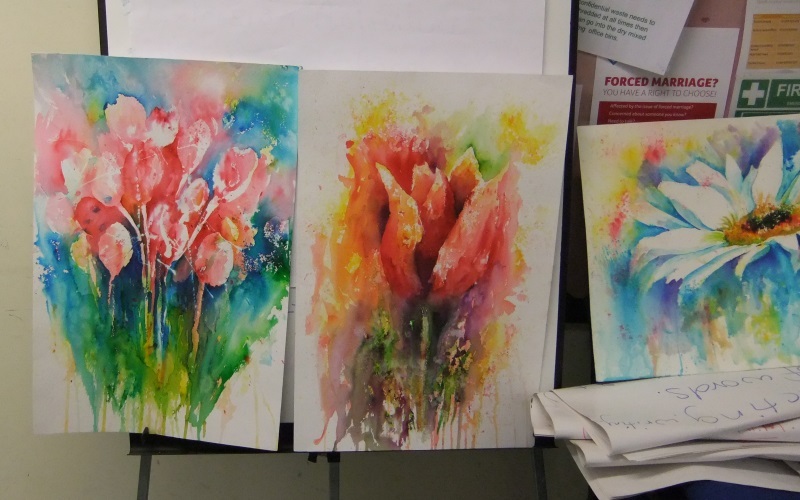 He also advised the use of paper towels, an old toothbrush or fan brush to remove excess dust while the art was progressing, not forgetting floor covering and fixative for when the work is finished. Having said that Duncan doesn’t tend to use fixatives, he puts his art behind glass when it’s finished and covers with with “Glassine” while he’s still working on it. All in all we had a thoroughly good, enlightening and informative session with Duncan and look forward to a return visit by him. ps Subsequent to this session I contacted the shop that Duncan had brought some of his supplies from ie Youdell’s of Kendal, and they very kindly sent me a range of samples for the group to try out. Click here to go to Youdell’s website. 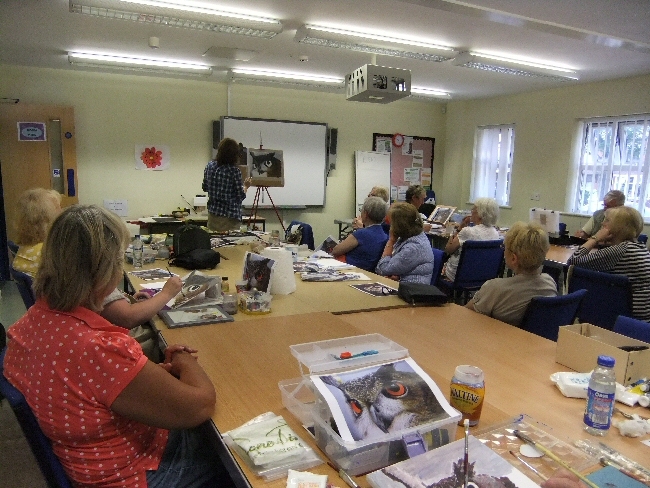 Robs session was unusual, possibly unique, in that he didn’t stand in front of the group with a brush in his hand at any time as most artists do. This wasn’t a bad thing…. it was very good because Rob talked us through his ideas using just a couple of handouts and explaining the “Design Process”…a process that encouraged the artist to use a “mind map” (little sketches and notes to capture thoughts and ideas), research, produce a preliminary sketch and consider the medium, refer back to the mind map to complete the work and finally apply a constructive critique to what had been produced. 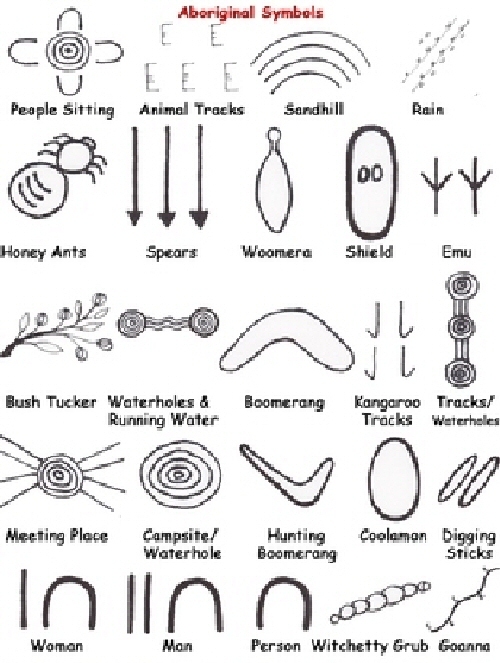 Rob also explained the use of symbols in aboriginal art and the two images below are a brief summary. We were encouraged to use these symbols and create a picture with reference to our mind map. 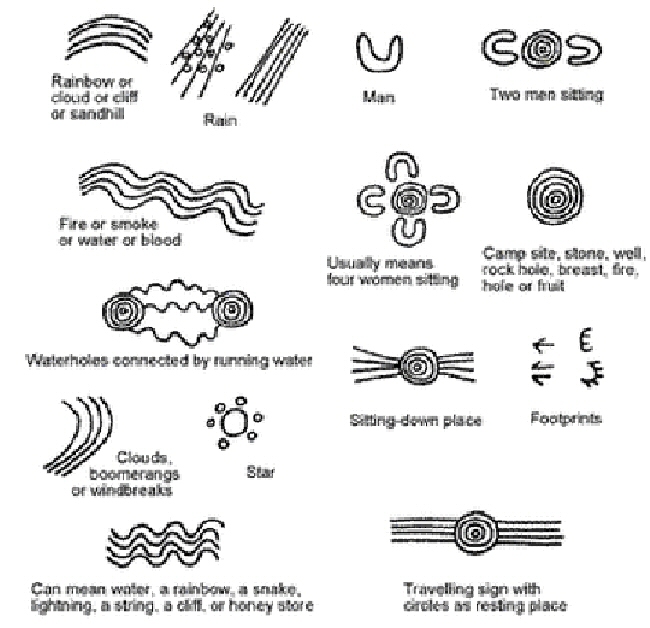 This enabled lots of the members to create a story using the same means as the aboriginal artists by the use of symbols or pictograms. 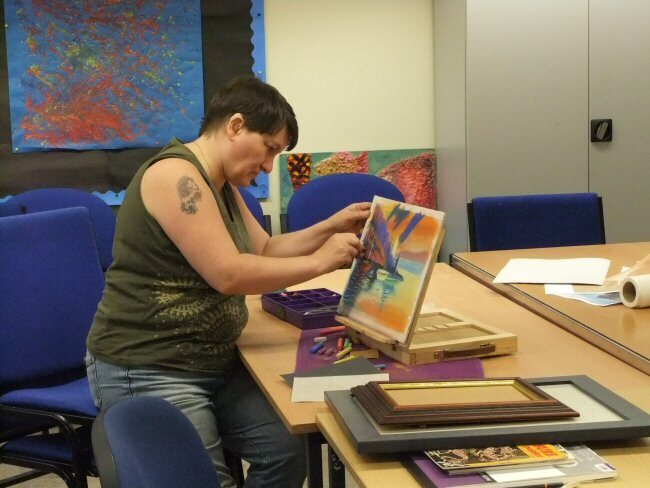 Below we can see Gwens art taking shape, full of symbols and vibrant colour. 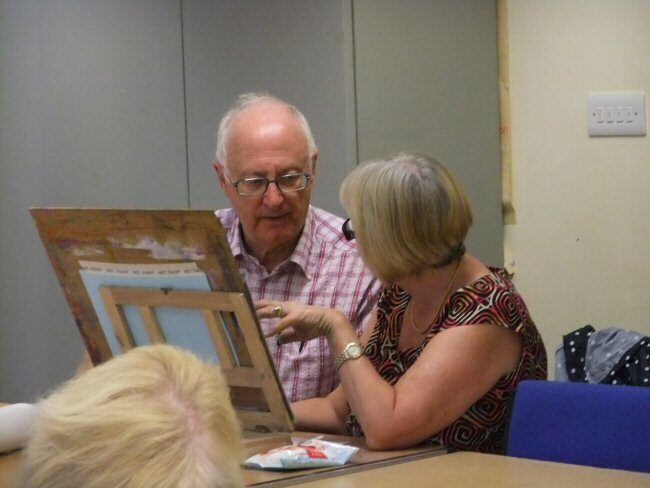 ….and here we can see Rob discussing the process with Barbara Hill. and Rob is giving Maureen his thoughts on her beautiful work. 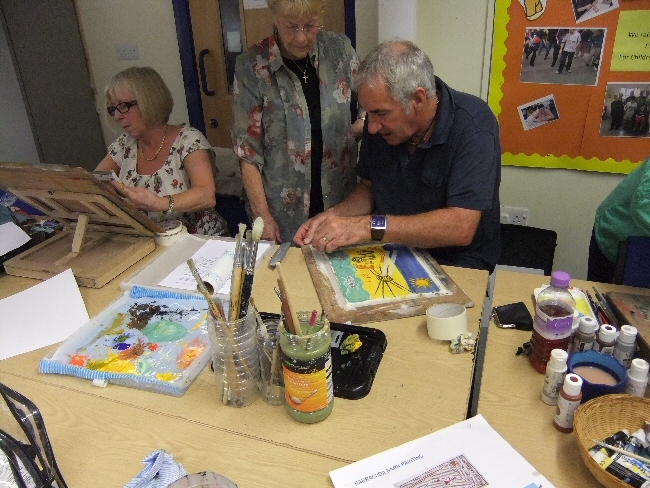 Below we can see Kathleen, Barbara and Bernard deeply involved with their experiments with aboriginal art. It was a slightly odd process really in that quite a few people couldn’t initially isolate what they wanted to do but with a little tutoring and a chat with Rob ideas seemed to flow in quantity. I know that I was like that until Rob & I spoke but then I latched onto the idea that this method could be used to tell any story and so I sketched something around my family, kids and their families…..and it’s surprising how a simple idea can grow. 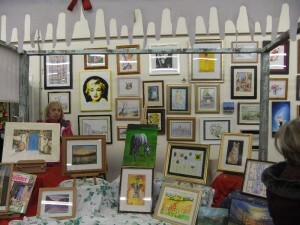 Below we can see Julie who, having quickly grasped this art philosophy, was soon producing lots of very imaginative art. 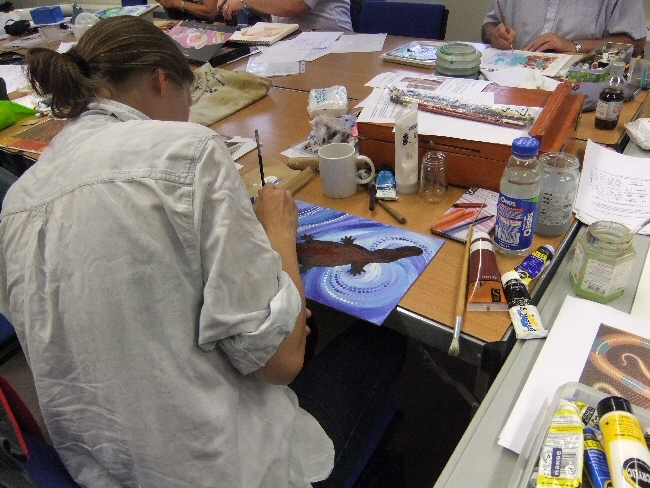 Below we can see Elise working on her painting of a Platypus. 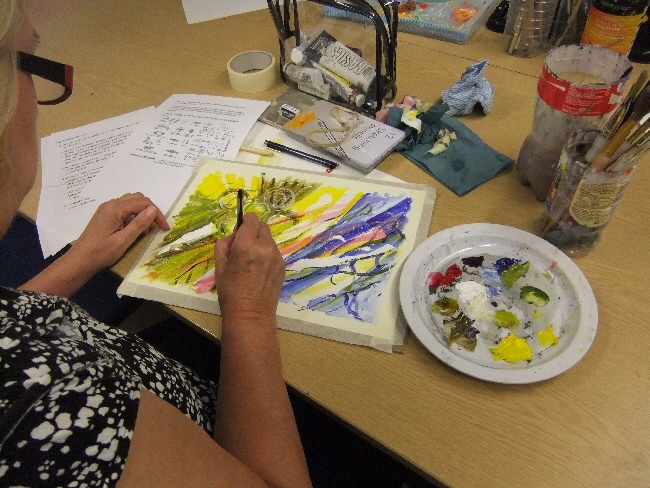 I watched her painting part of it and as per Robs suggestion that anything can be used to paint with, twig, card, stick etc; she used her fingers to create the swirl of colour. 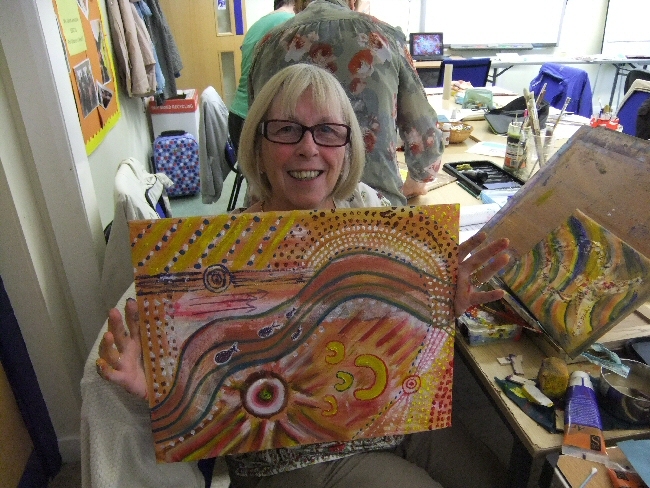 And below is the lovely Viv…..always enthusiastic and lively and gets on with creating lovely paintings like the one she is showing to the camera, while I’m still thinking about it. 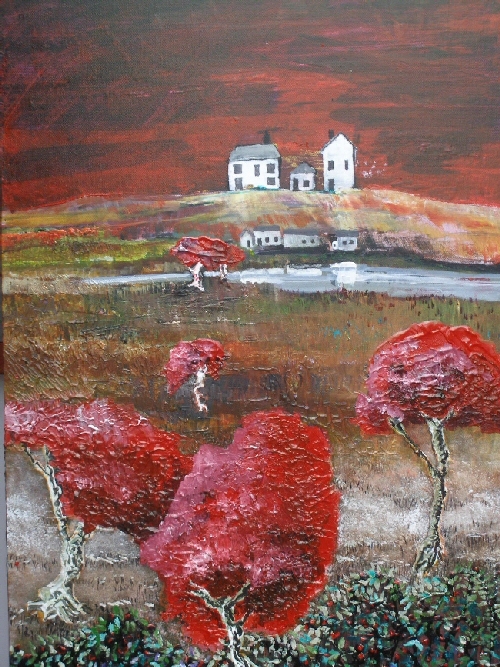 The next two images are examples of Robs own paintings and are taken from his website. Visit his page to see more by clicking here. 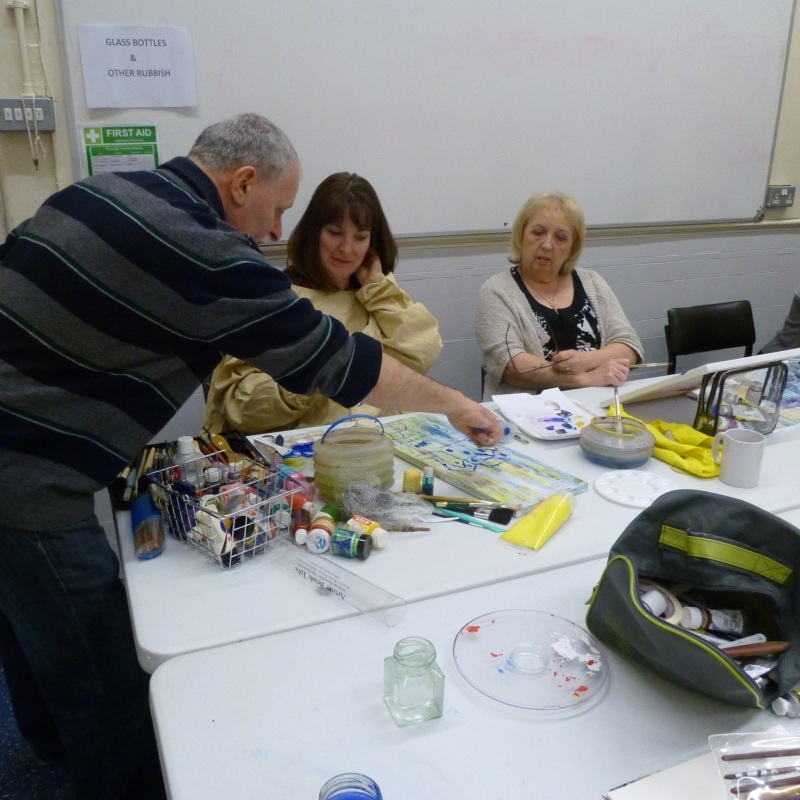 Rob certainly got the group thinking, sketching and painting during his session with us. There was a constant hubbub of activity during his time with us. I feel sure that we much to learn yet from Rob and look forward to a repeat visit. Lea was new to the group although at least one member had seen him at another venue and had suggested that we ask him to visit us. I’d booked him about 8 months previously (the man is in demand!) and it was worth the wait. Lea had one or two teaching traits that endeared him to the group. Perhaps the main one was that he is happy to say “Hmmm……. 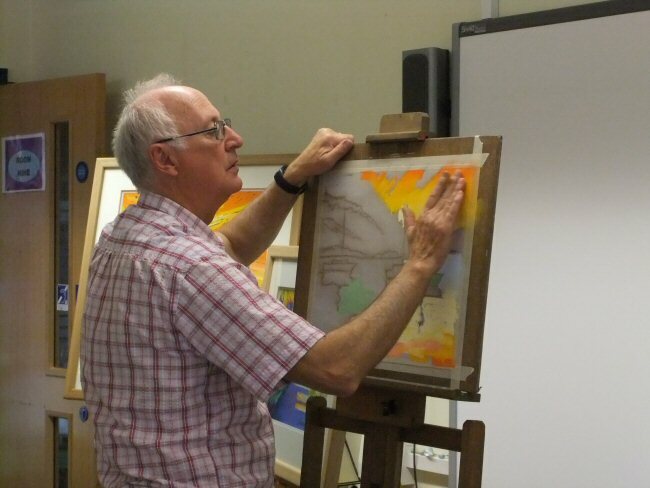 …I’m not happy with that one……I think I’ll have another go” This may not sound like a big thing to confident and very able artists but to those folk like me, who regularly make a “spanner” of a painting, it was like music to the ears. 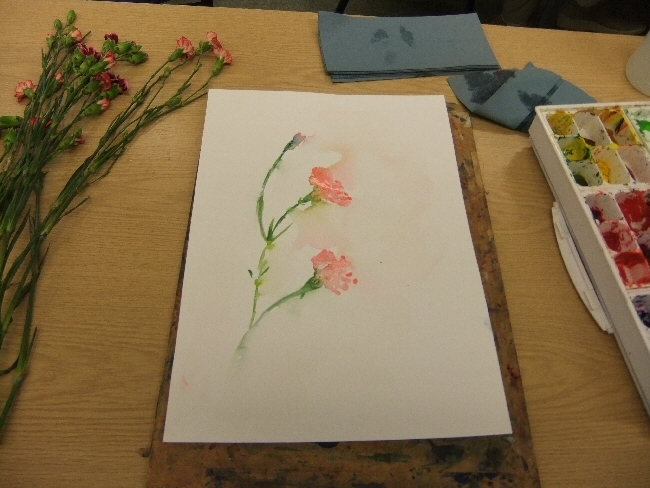 It’s ok to mess up….it’s just paper and a bit of paint….have another go. 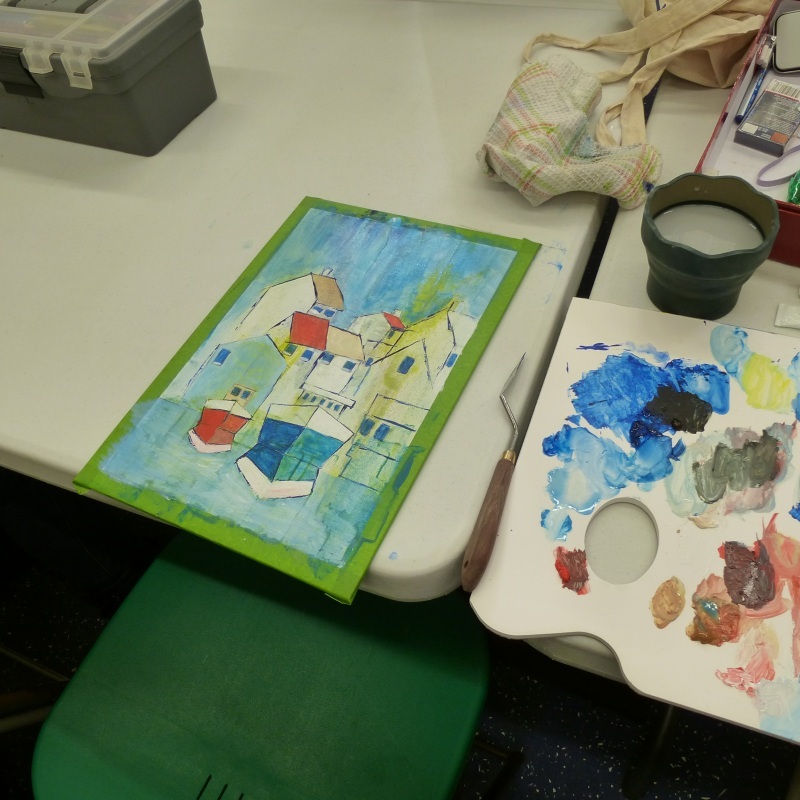 Another really good and enabling suggestion was to divide the paper into four areas and just do a small painting in each one. It’s surprising how much that eases the mind because it’s obvious that you’re not committed to this picture being the only chance of success because there 3 other little pictures to create. 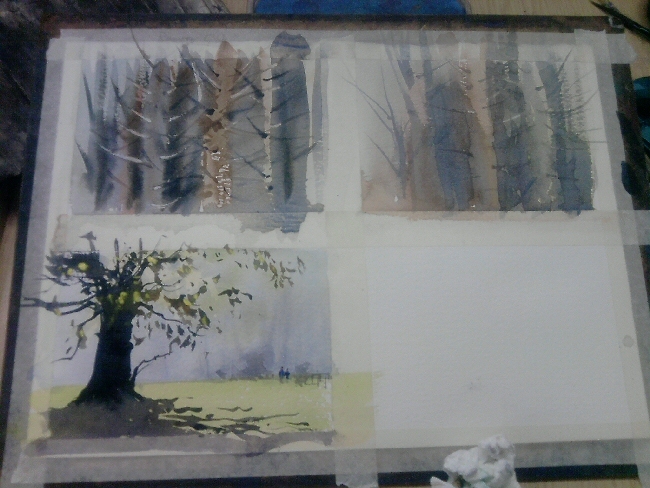 All you do, if it isn’t as good as you’d like, is to move onto the next panel and have another go. 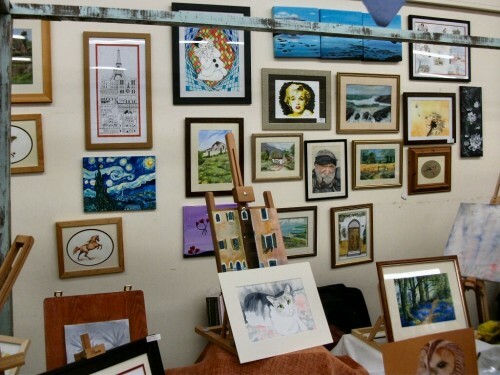 You can see that Lea himself did exactly that if you note the top two paintings shown above. They are of a wooded area showing tree trunks and after Lea had completed the one nearest the camera he declared himself not to be happy with his first effort and had another go. 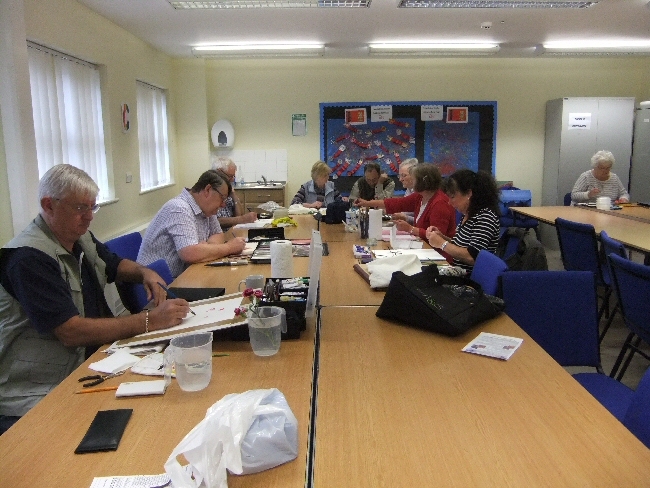 Lots of the group took great heart from that….. I know that I did! He went on to create the small picture of a landscape with a tree on the left (shown above). 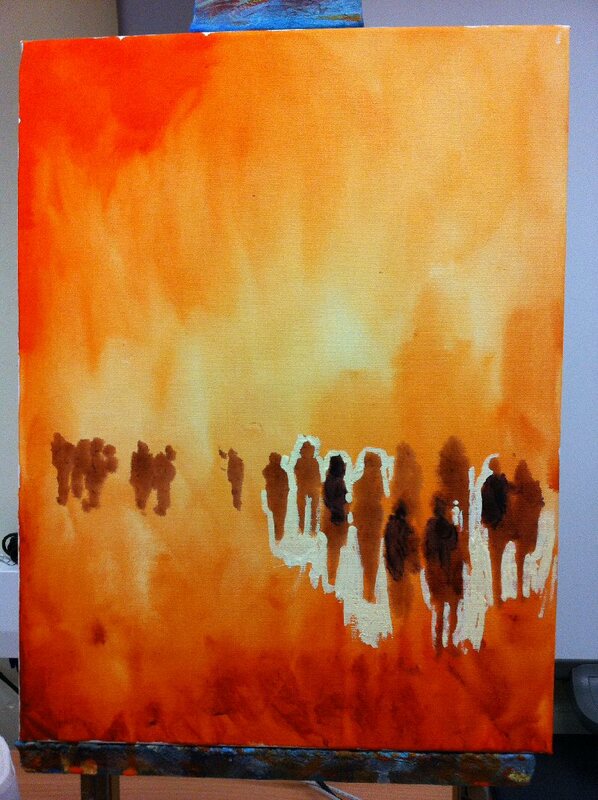 This small painting demonstrates the real value of being brave when using dark tone in your paintings. 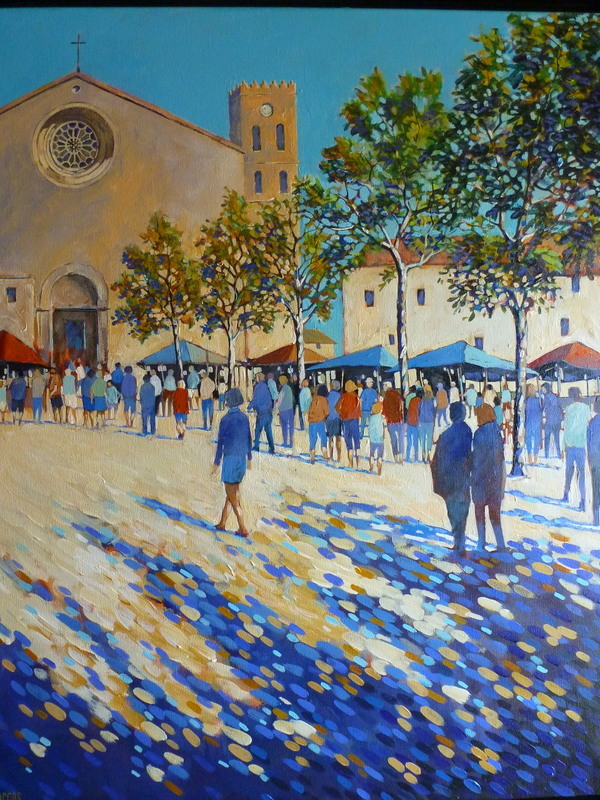 Lea is a fan of using dark tone to good effect in his paintings and the photo above and below show some of his excellent work. The quality of the image is poor because I forgot my camera and had to use the one on my phone, but if you’d like to see better quality images then go to Lea’s website by clicking here Note the excellent use of darks in Lea’s superb artwork. 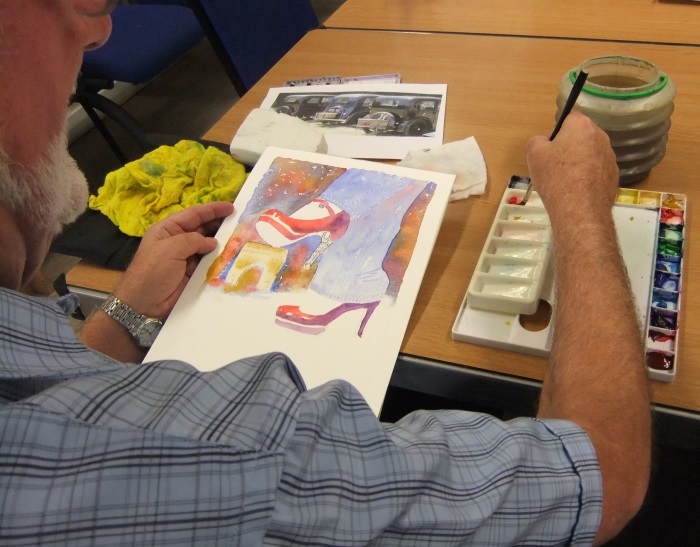 Lea spent lots of time discussing the method and left everyone feeling that painting in his style was definitely achievable. He helped everyone and did what good teachers do….. “de-mystified” the subject for their students so that they felt able to have a go themselves. We look forward to another visit from Lea in the not too distant future. We had a welcome return of Debbie Butterworth. She’s been visiting us since the start of WAG and has always been interesting and entertaining. 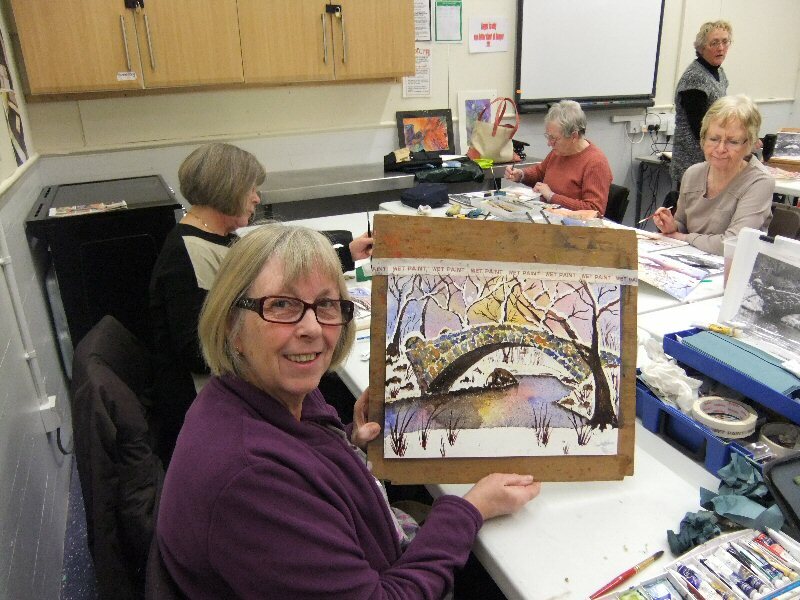 Debbie has talent in every medium that we ask her to do and is another firm favourite of the group. 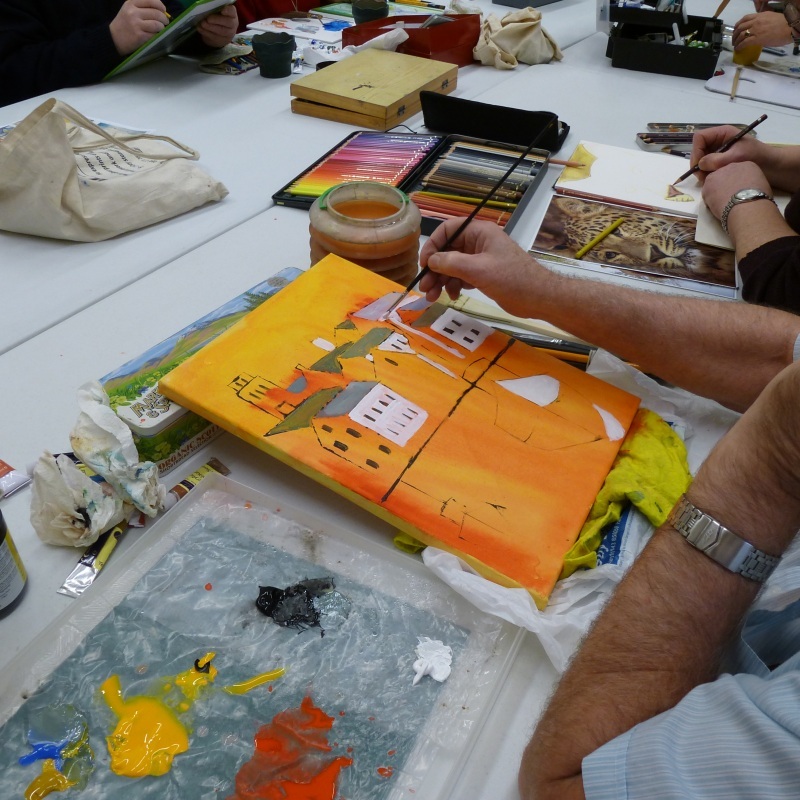 This visit was to be a split session: the first part was an exercise in water mixable oils and the second part we would be an acrylic exercise. 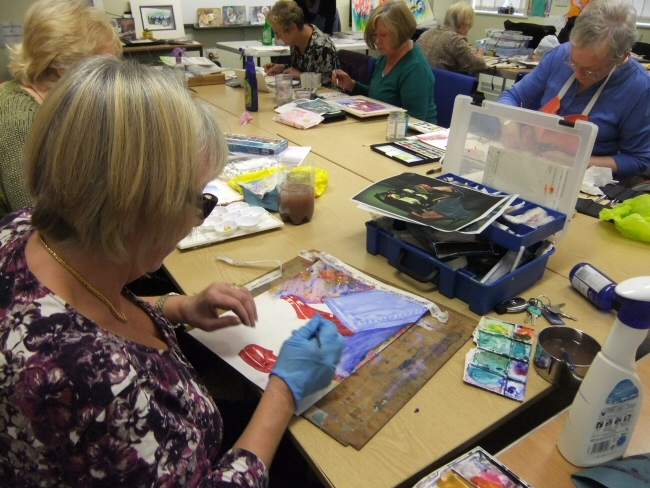 Above we can see that Debbie has started the water mixable oils exercise. 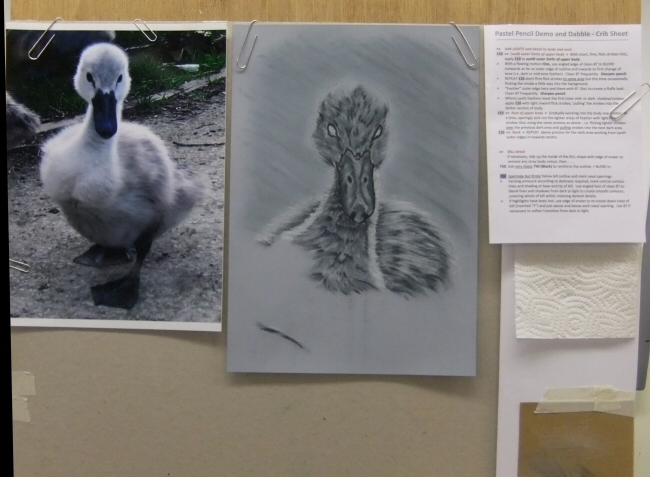 She made the point that if drawing isn’t your strong point then trace it by rubbing pencil over the back of the reference picture in those areas that you will subsequently draw around. She suggested that it may help to hold the image up to a window to aid seeing through it in the same way as one might use a light box……..a very helpful suggestion. 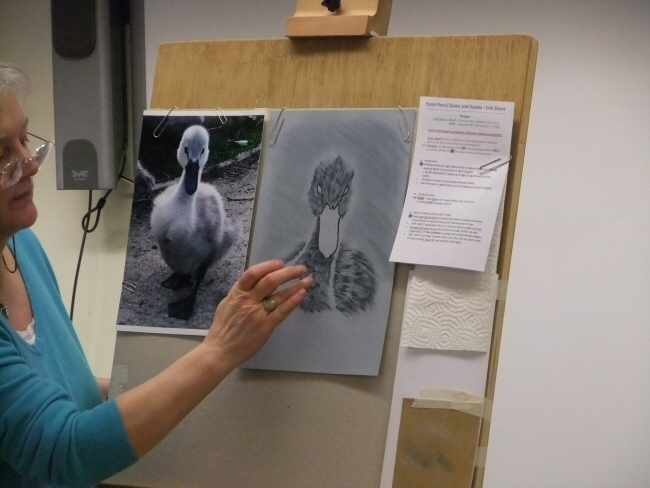 She pointed out that paint should be applied to the surface in the direction of feather growth to give a realistic feel to the painting. 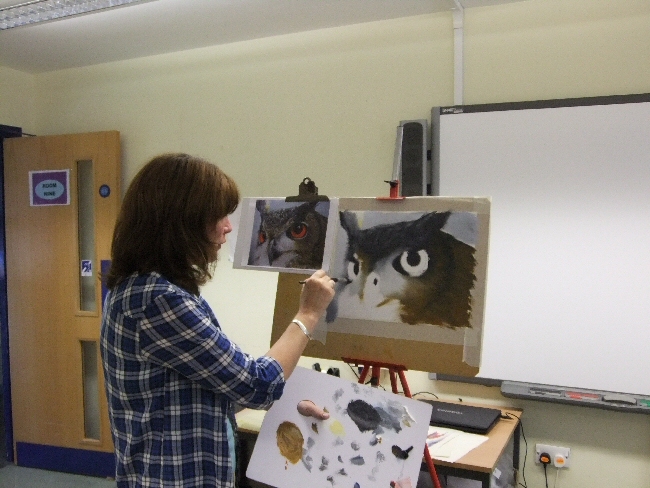 Above we can see her painting progressing with the addition of various colours and shades and we can see the owls beak starting to be defined. 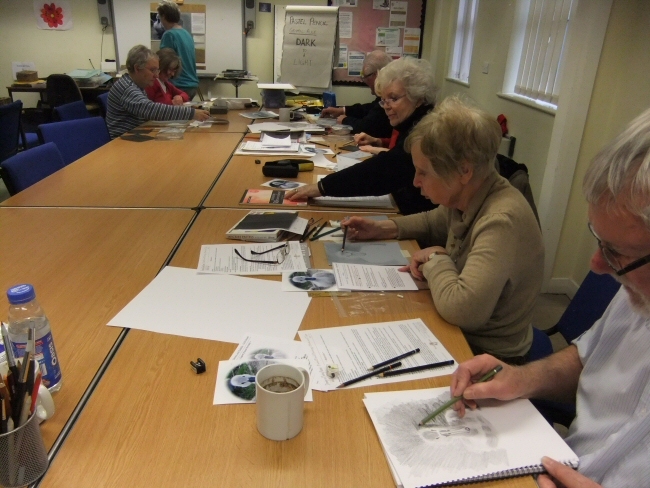 Debbie has always kept the groups interest and takes the time to explain and demonstrate techniques to the group who always watch closely until it’s their turn to have a go …..and these two photos show them doing just that. 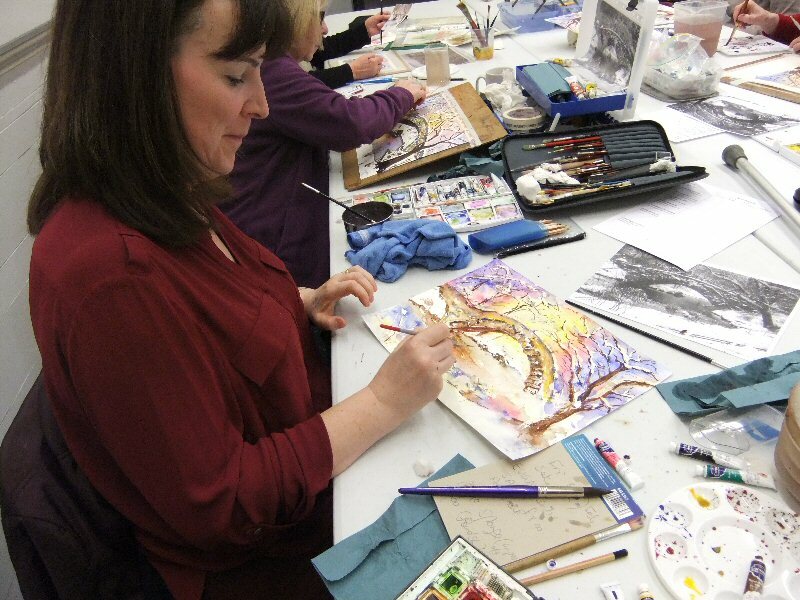 After WAG’s ubiquitous and always generous mid morning break Debbie started her acrylic painting. This was also from the animal kingdom, but this time it was a Cheetah. Again she’d traced the image to aid speed and then set about stippling the almost white acrylic onto a black background. 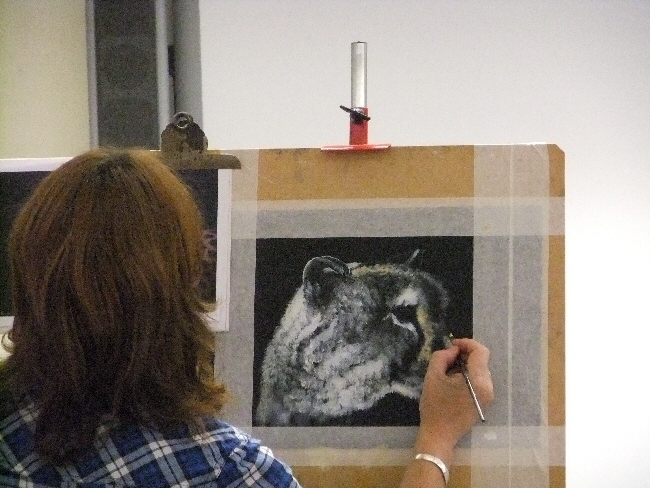 She’d prepared this earlier by painting it with black acrylic paint (although black gesso would have been good too) As you can see, this was a very dramatic picture that seemed to reveal itself quickly on the paper as she continued to stipple and blend. Of course experts seem to make everything look easy (and Debbie is surely an expert) but various members had a go at this subject and at the time of writing Bernard has actually completed his version. 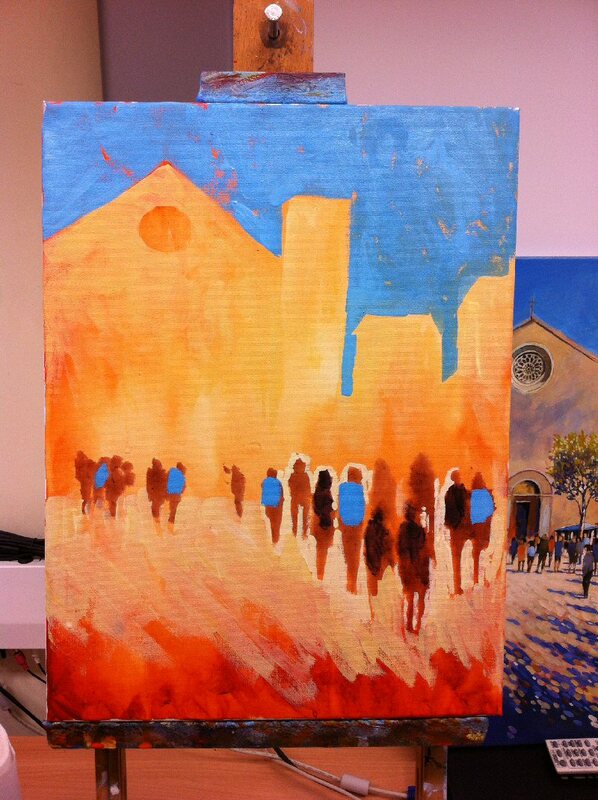 As for the blending brush that Debbie used, I tracked it down as being one of “Rosemary & Co’s” large Series 1582. Badger Softener/Blender costing £16.50 at the time of writing. Above we can see that Debbie’s painting has progressed to a point where only a little more work would see it completed but we’d covered so much ground and time beat us. That’s Debbie though….. always value for money, interesting and educational. 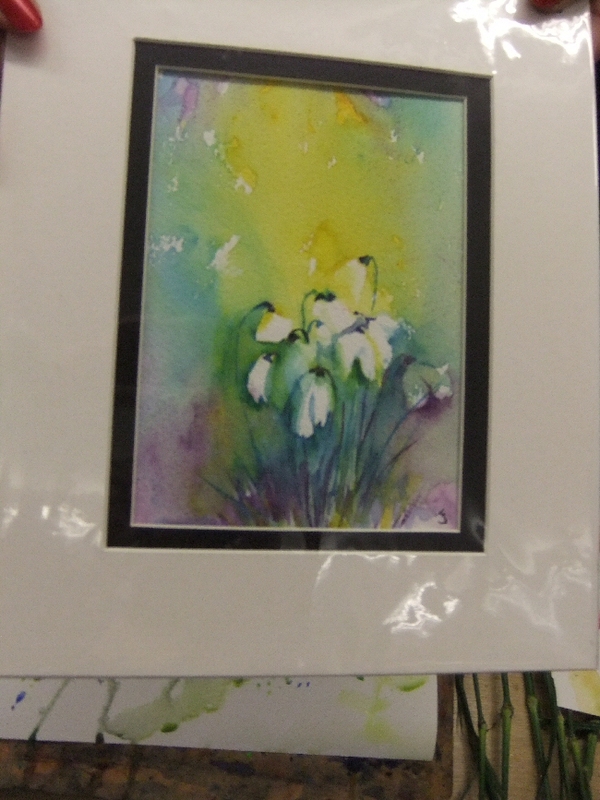 In the meantime here is just one example of this process of painting loose watercolour flowers…….. beautiful snowdrops. 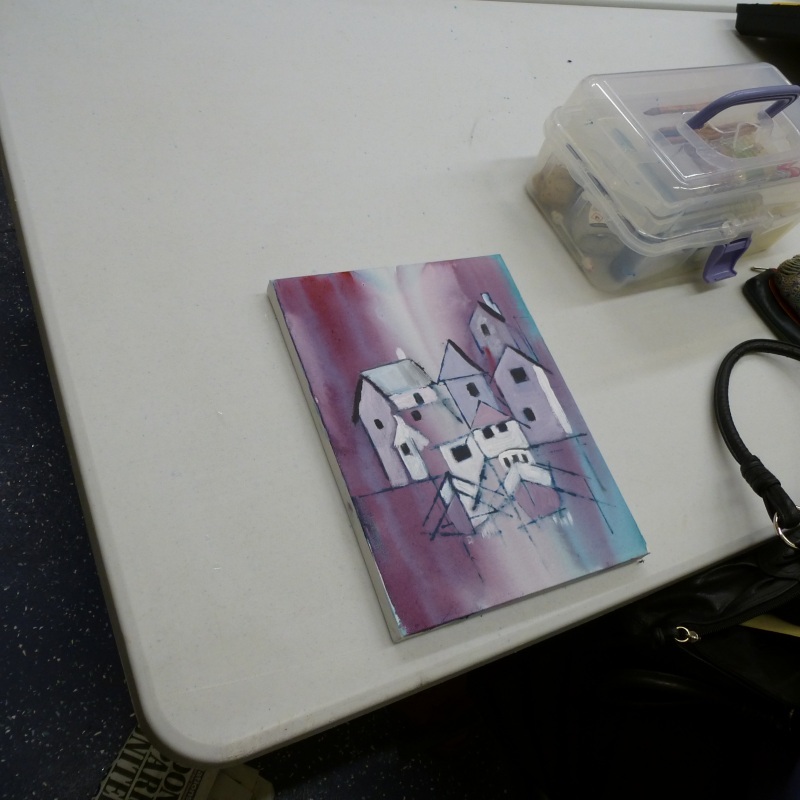 This is just one of the examples of her work that Judith was good enough to bring with her. She inspired the group to have a go…….to me it’s the most important thing that can be demonstrated: that you can do this. It doesn’t matter how good an artist that you are if you cannot get someone to forget their reluctance and have a go then you’ve only done half a job. In my opinion it isn’t the artists job to show the group how good an artist he/she may be…..it’s their job to get the members to feel like they can do it too. Judith does this with deceptive ease (and she’s a dashed good artist too) Below are a few pics of the members putting into action what they’ve been shown…….and enjoying it. 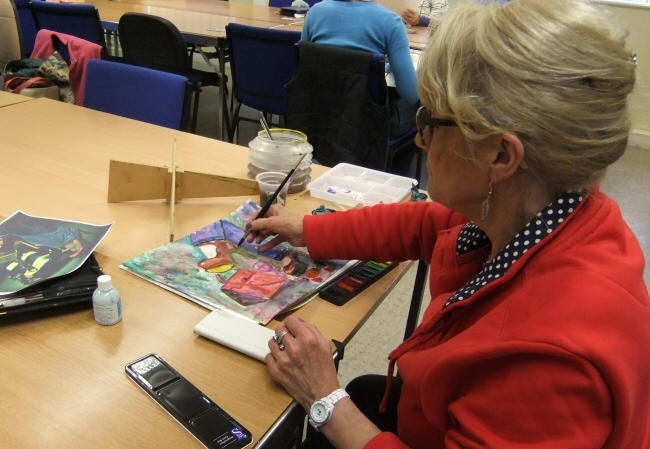 We’re already looking forward to Judith’s next session……..we’ll no doubt have another excellent session. 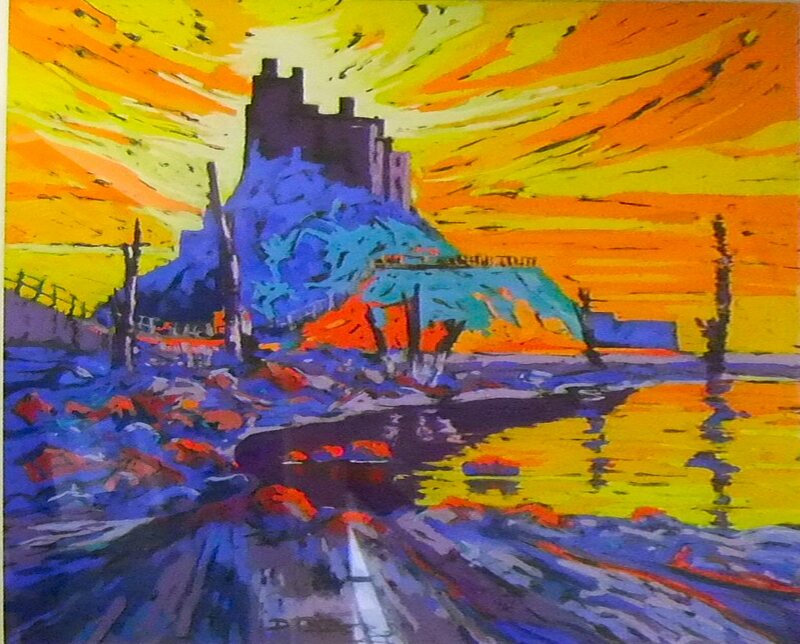 This was another adventure in acrylics from Carl. 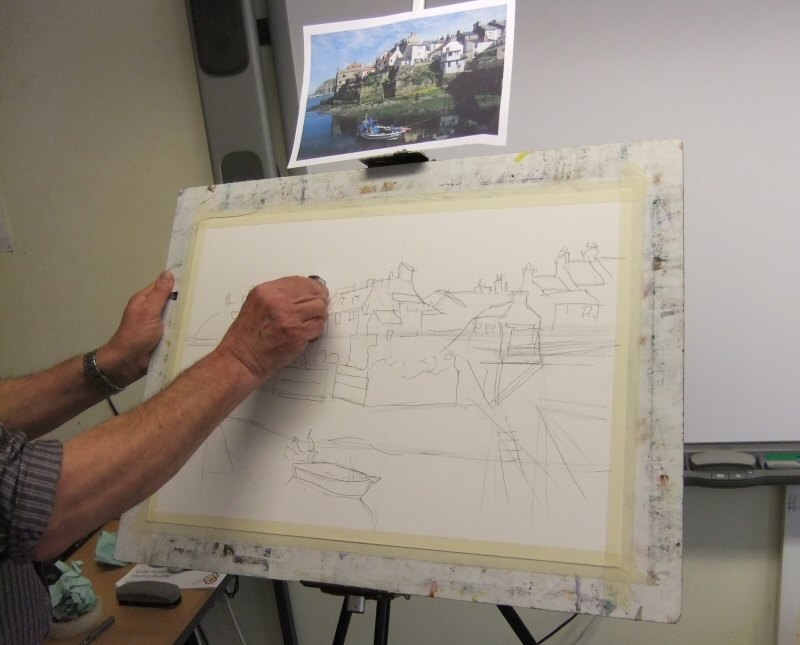 He had led the group in the creation of quite a complex painting of a harbour scene during his visit of the 4th February 2013 (see below for a report on it) and this time he was going to show us a market crowd scene. Carl has such a nice way of teaching and spends a lot of time going around the room advising and helping individual members. Yet again the group did what they do best ie join in with a challenge. However difficult it may seem they’re very keen to have a go. 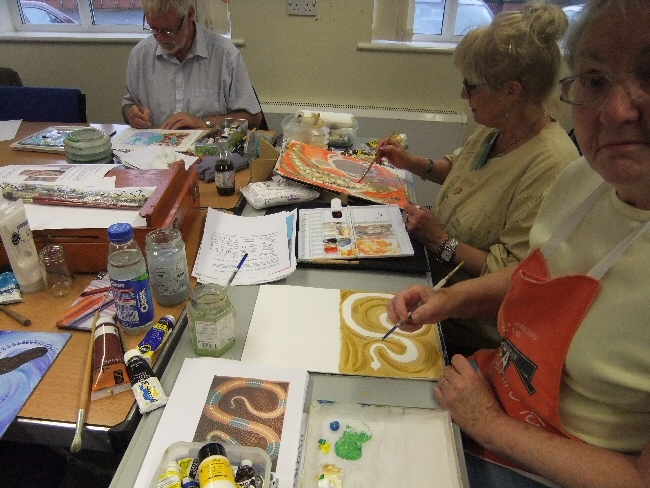 You’ll see from the photos below how Carl progressed his painting in stages and ensured that everyone was comfortable with that stage before he moved on. I should thank Dennis Openshaw for taking the photos as I had forgotten my camera. In any event I was still breaking down the exhibition from the day before so it’s unlikely that I would have had the chance to take any photos……so well done Dennis! In the picture above we can see that Carl has loosely applied a mixture of orange of various kinds and then painted some people like shapes. Note here that the heads are all approx at the same height regardless of their position in the perspective. 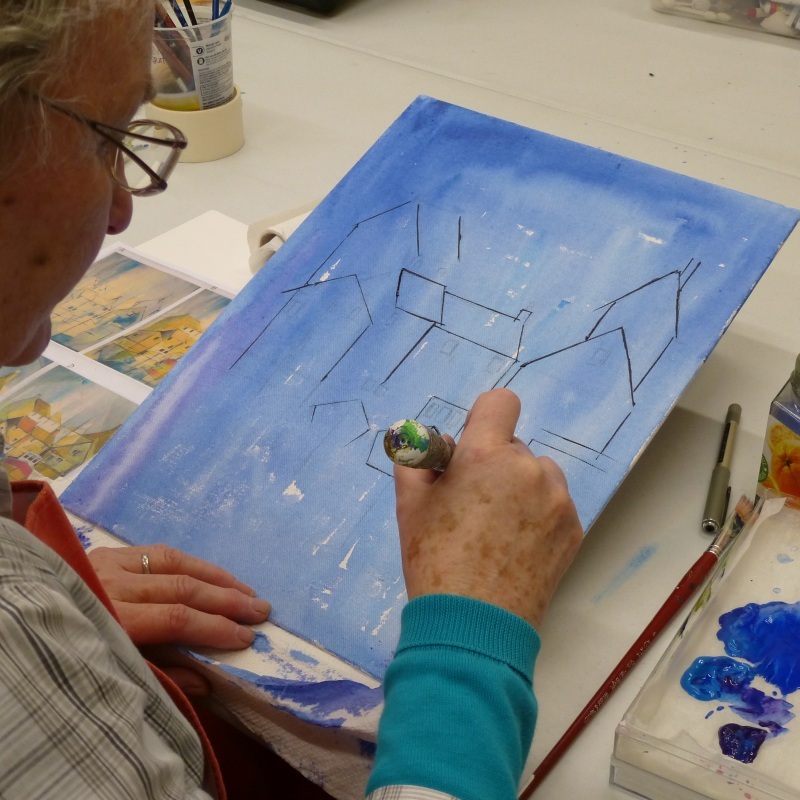 This image shows that Carl is painting the “negative space” around the figure. 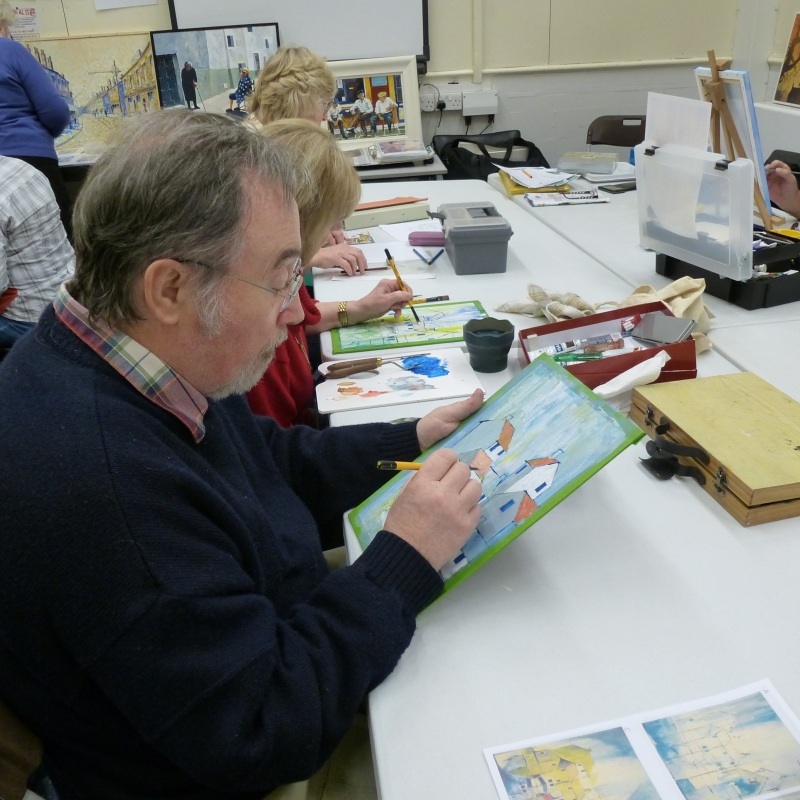 The whole exercise is about painting an impression of the scene and this method allows the artist to adjust the very loosely applied figures added at the first stage. 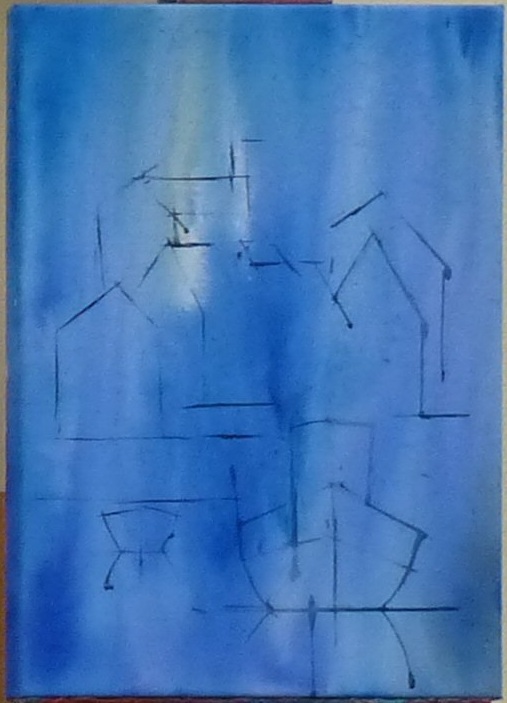 Continuing with the theme of painting negative space we can see that Carl has added a blue sky to leave the shapes of buildings on the skyline. He deliberately leaves slight orange patches showing through in the sky for interest. 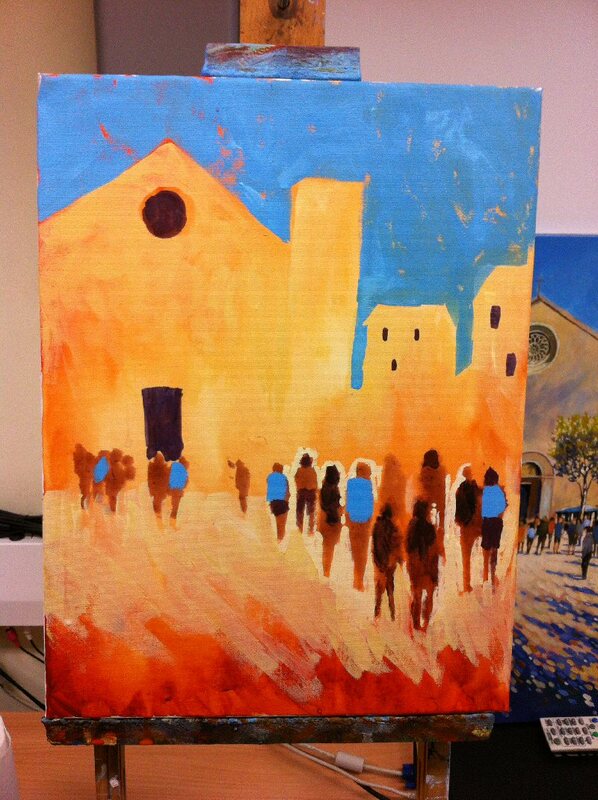 Here he has added more detail to the building and some colour to the figures of people. In the image above Carl has added shallow triangular shapes to indicate market stall umbrellas (note that one side of them shows a darker tone to allow for the direction of light) as well as interesting cobble type marks in the foreground. 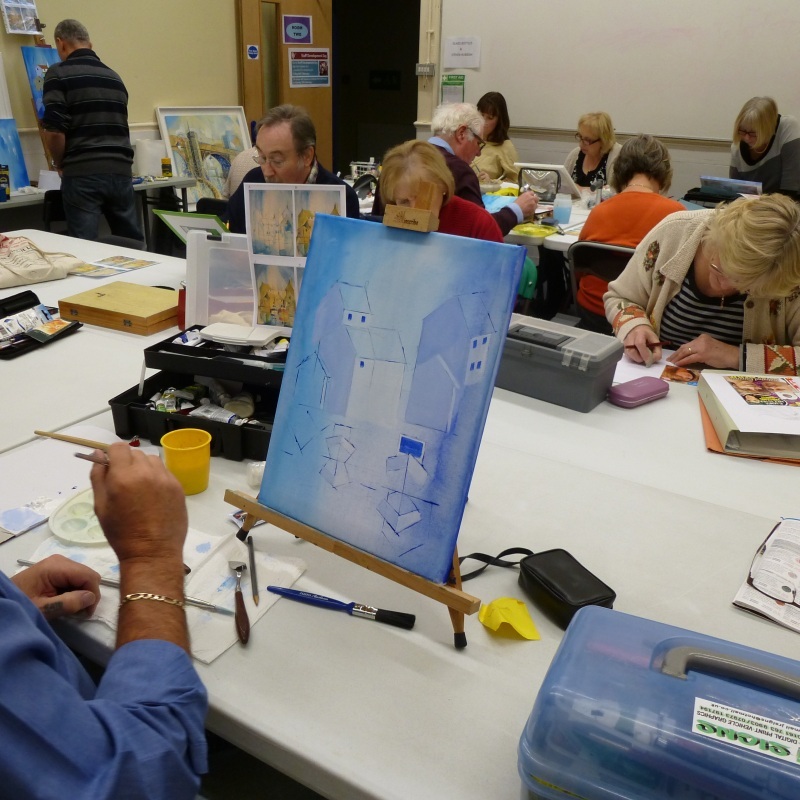 This is where this market place painting is heading but Carl wasn’t able to complete it within the session but ensured that he’d covered the most important techniques so that the WAG members could finish it themselves using this previously finished version as a guide. Yet again Carl led a very interesting and enlightening session and we’re already looking forward to having him back again. 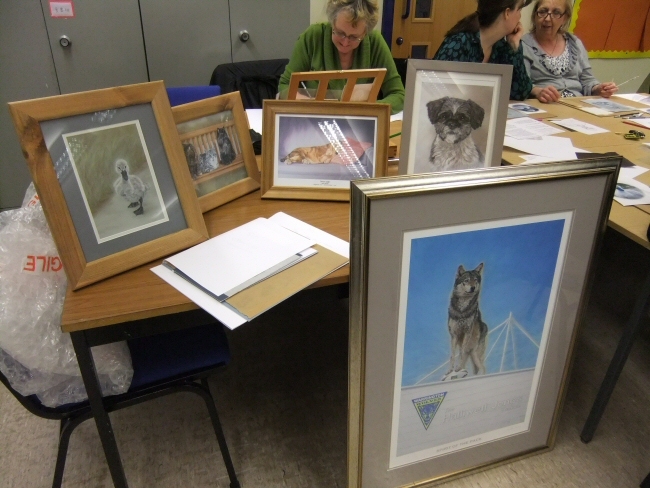 WAG took part in the Fayre by creating another fantastic art exhibition. 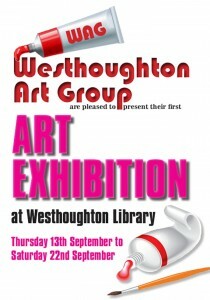 This event has happened in the past under the sole banner of Westhoughton Active Community Organisation (aka WACO) but this event was to include a broader representation of community groups. Of course, the college where WAG is based, is also a very important part of Westhoughton Community and they were also very ably represented. Of course all kinds of people should be thanked for their selfless and enthusiastic support and involvement. The first I would mention is Kevan Prescott who is employed at the College but is the major force in making the It’s a Knockout Funday happen. 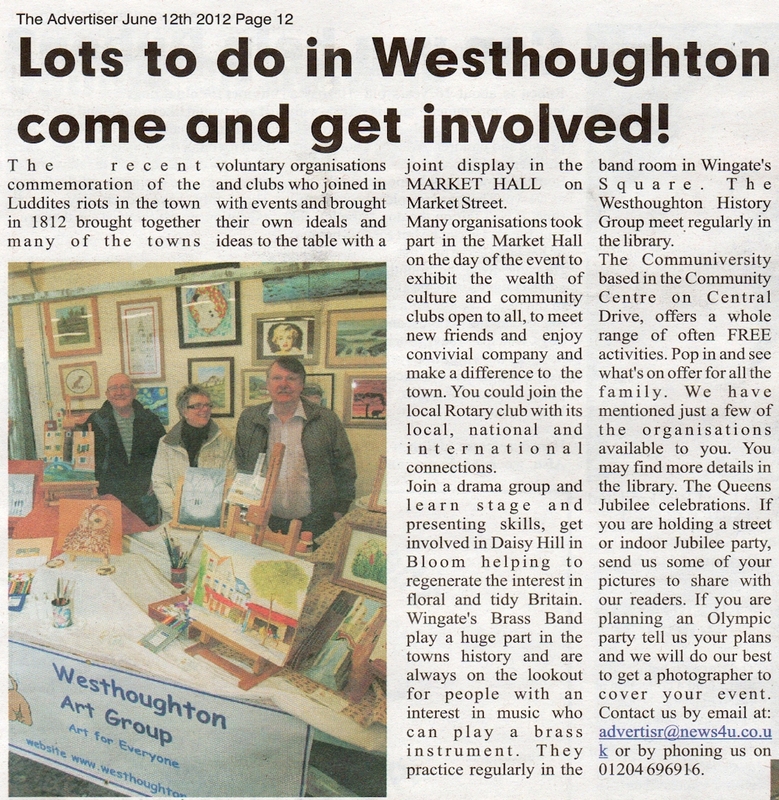 He always has the assistance of his friend Stephen Calderbank…….and these two chaps work tirelessly for the benefit of Westhoughton residents……well done lads. We should make a special mention of Shirley Pinches (co-manager of the College site) as well as her staff for all the practical help and advice ………we would have been stymied without your input. Our contact from WACO was the marvellous Janet Colley (also co-manager of the college and all round wonder woman) Janet was so creative and proactive. She has been involved with the Funday in all its incarnations since the beginning and was full of constructive suggestions for how WCN might engage with the event. 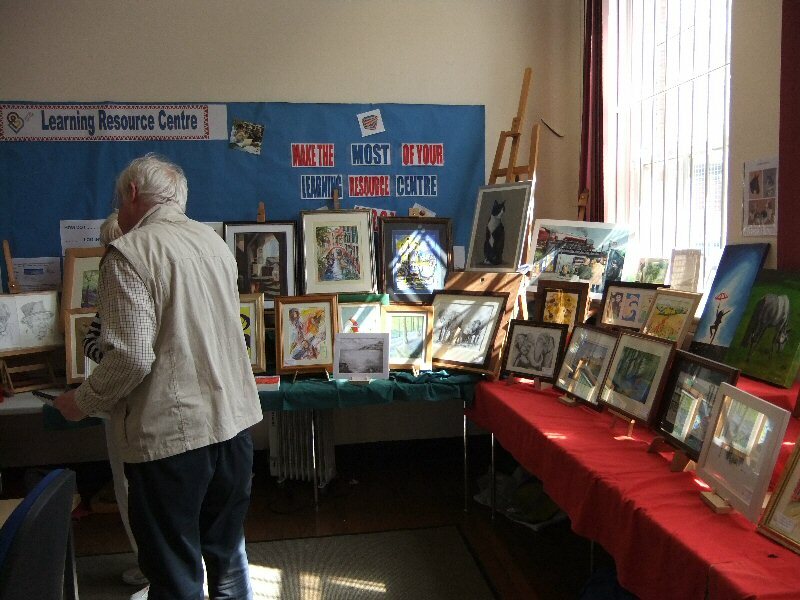 Kevan Prescott also works tirelessly for this group and had previously been the chairman of it prior to stepping back to allow him more time to involve himself in more of the practical side of the event ie fetching, carrying, putting up posters and banners…….and chasing after us in Westhoughton Art Group. ….and finally……here are the very few photos that I took on the day. I really must get this pop art of Clint finished……I mean really, it’s been on the go for 6 months. Some interested viewers including WCN’s Chris Buckley. He and I had been on Bolton FM to publicise the event and were made very welcome by Elaine Taylor and Margaret Corston on their Wednesday evening (7 to 10 pm) Community Corner show. Don’t worry if you cannot receive it on your radio, just search for it online and listen live. My Canadian cousin (a Bolton expat) listens to it to get up to date with her beloved home town. Perhaps the only problem that we had was that we could have filled the whole room at the college but had to (try to) use only half the room. This led to some stacking up of pictures with some being slightly obscured by other paintings. 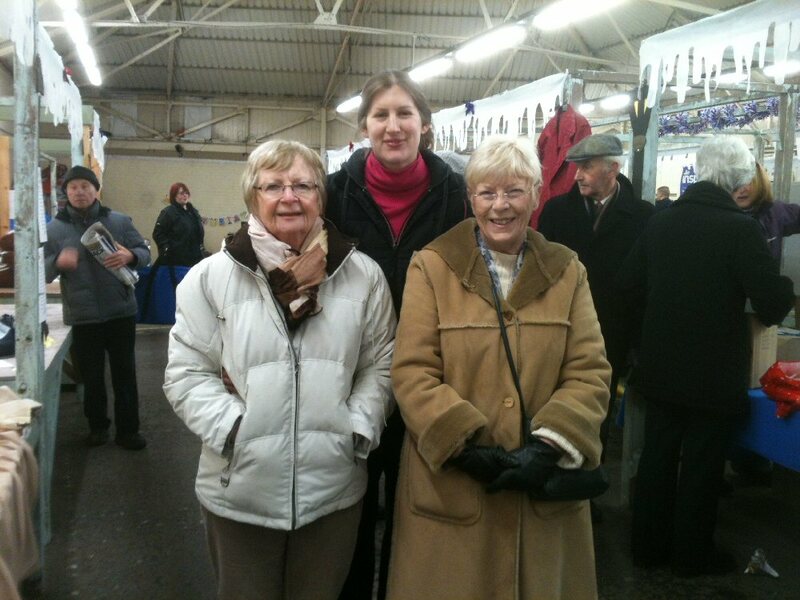 Yet again the WAG members showed their character…..everyone being happy for everyone else. 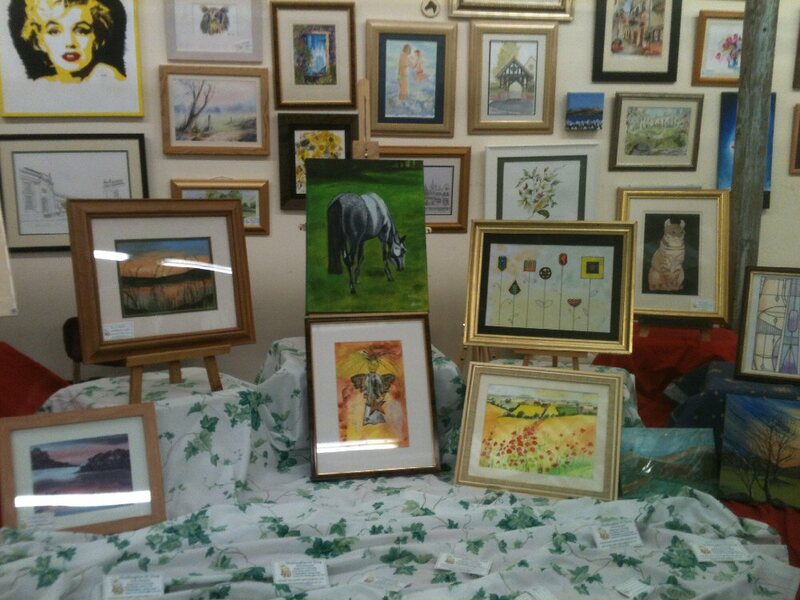 ….no prima donnas or whinging……just happy to have their art displayed alongside their friends work. Thanks and congratulations to all involved. 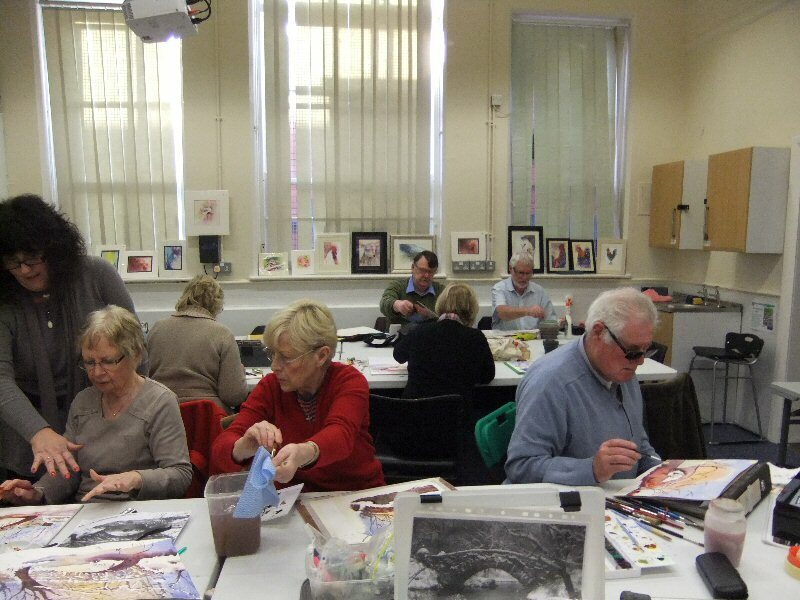 We try to have artists/tutors to teach media of all kinds and Elaine Gaffney’s forte could probably be described as graphite and coloured pencils but her website shows a much broader range of work. Click here to go to Elaine’s website. Elaine focused on 2 main subjects today, an elephant and a lynx, but she also advised on other subjects that the members had chosen for themselves. She had previously briefed me by telephone regarding her session and advised the members to trace the main shapes and outline of their chosen subject. 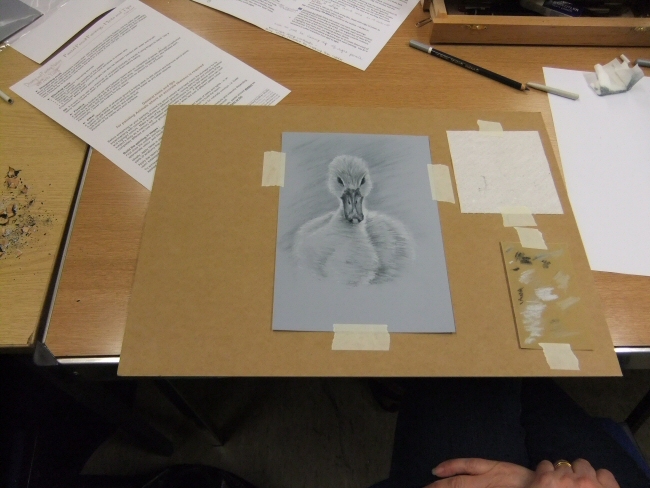 If you listen carefully you can just hear the sharp intake of breath of people who feel that tracing is heresy……..strange then that Leonardo Da Vinci wasn’t told that or he’d have struggled (as would Vermeer and Canaletto) who had all traced a camera obscura projection. 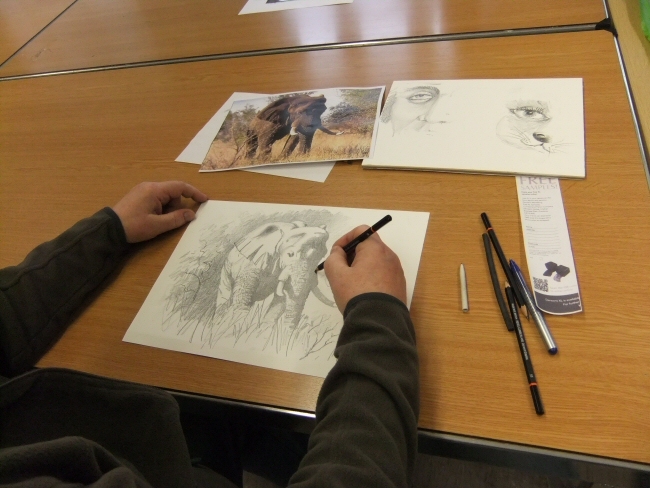 For more info on drawing see the “Drawing Help & Tips” page on this website by clicking here. 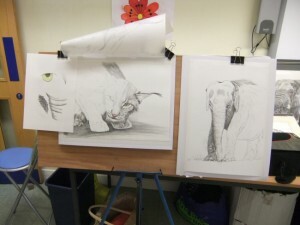 Above we can see Elaine’s start at the two subjects and sketches (on the left) showing the technique required to draw the eye of the lynx and the skin of the elephant. 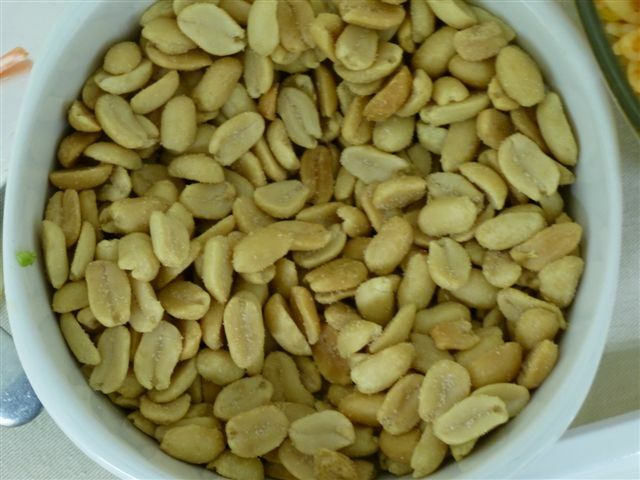 Below are copies of the original source images. 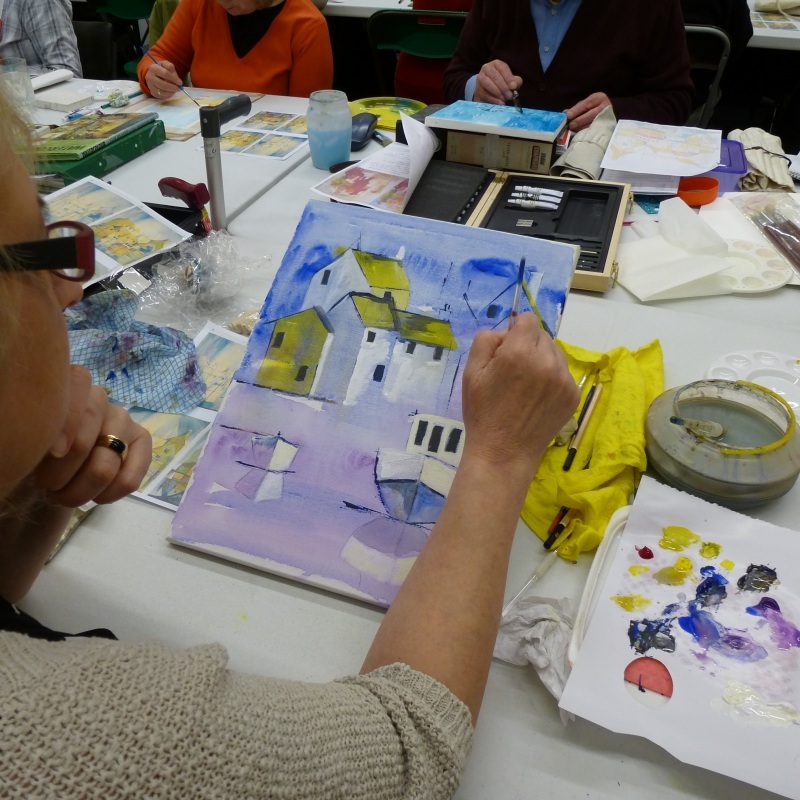 Elaine showed the different marks that could be made using these blocks as well as using “Aqua Brushes” (ie water filled tubes ending in a brush costing approx £4.50 at the time of writing) to lift colour from a block and then to apply it to a painting. 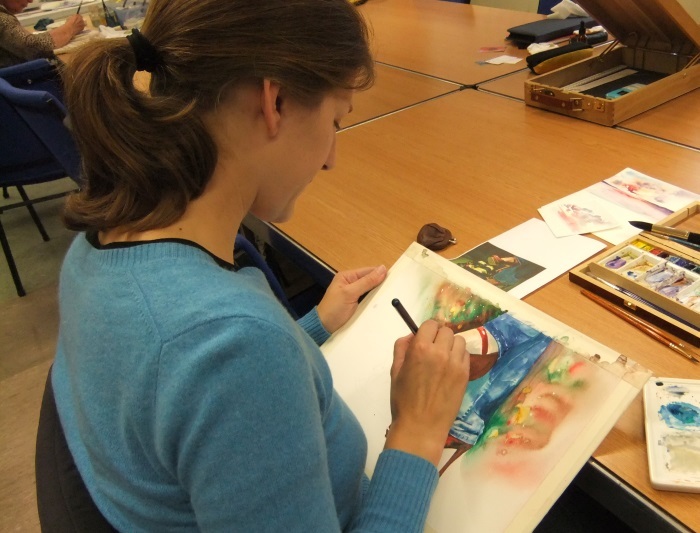 Using a combination of drawing and painting of the graphite would therefore enable a wider range of techniques and effects to be employed. 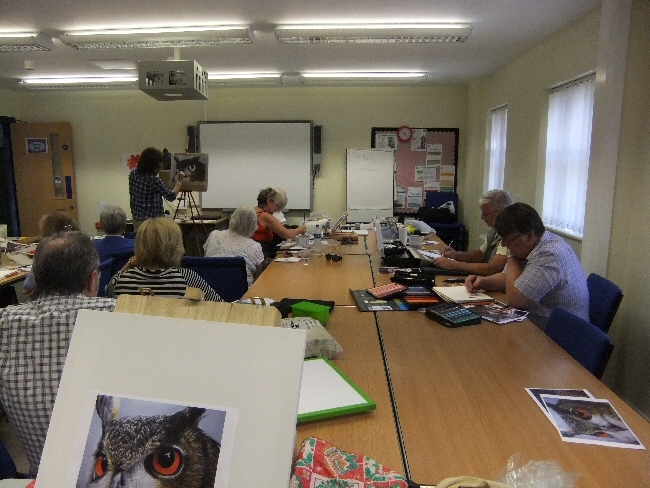 Below we can see members of the group deeply engrossed in their art. 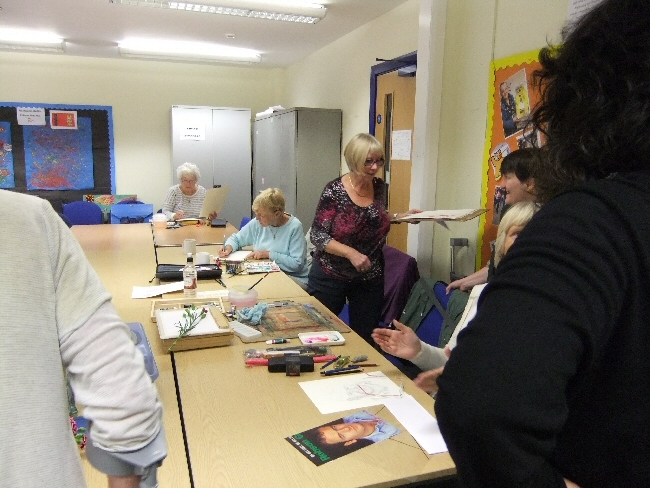 This first image is of Eileen Halliwell part of the way through an exercise that Elaine had created and handed out. 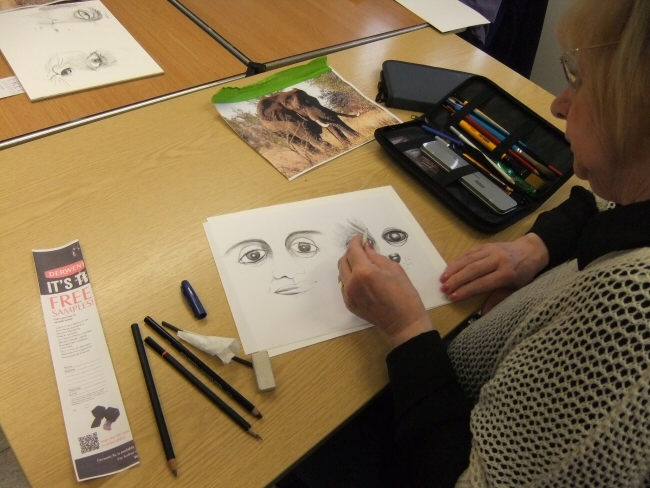 The task was to complete a graphite sketch that Elaine had started ie one half of a human face and an animals face had been drawn and the members had to copy that to create the other (mirror image) side. 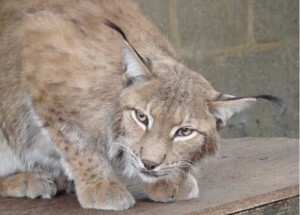 Below is Dennis Openshaw’s version of the Lynx. 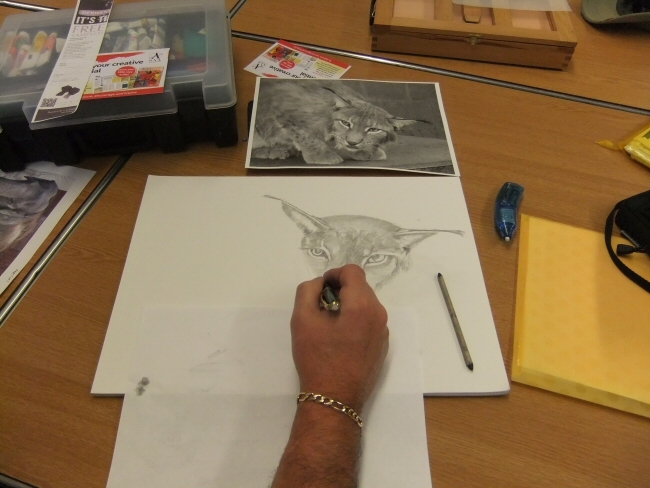 As you can see Dennis has made a superb start at capturing this scary animal. 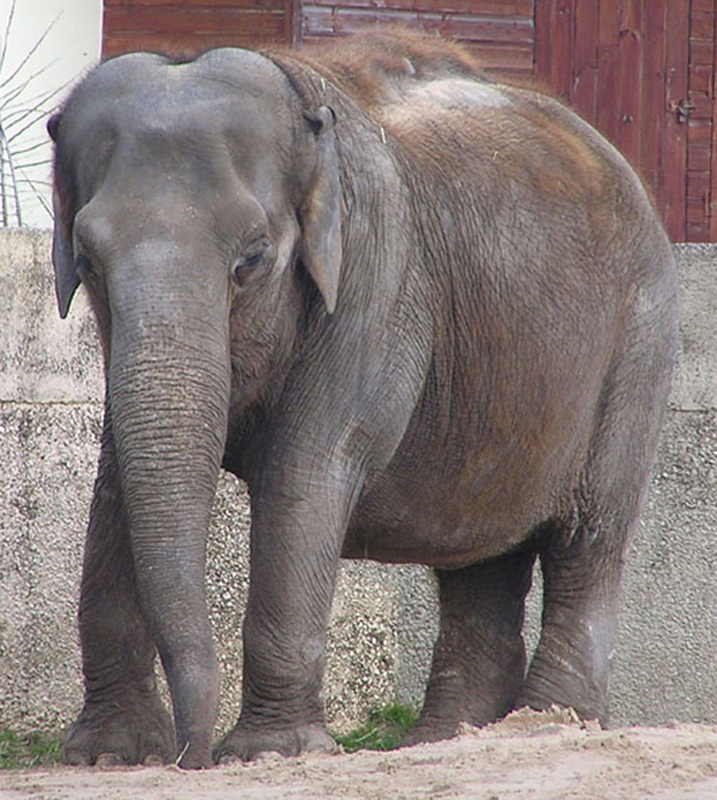 and below is an elephant that David Halliwell had almost completed. 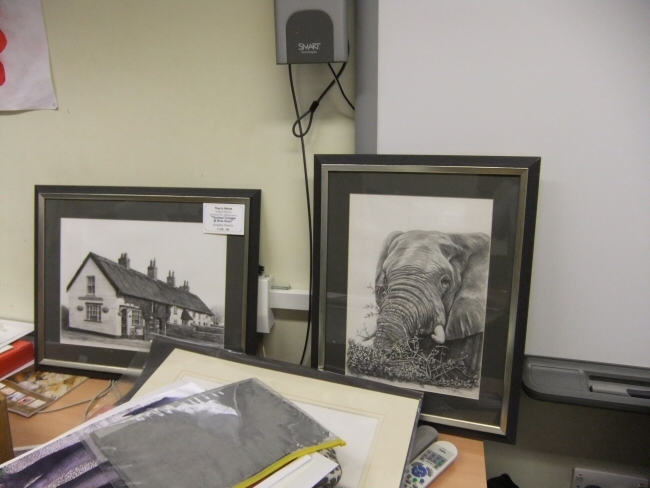 This wasn’t the elephant from the image that Elaine had provided but rather one that David has sourced himself……and a cracking job he’s done too. 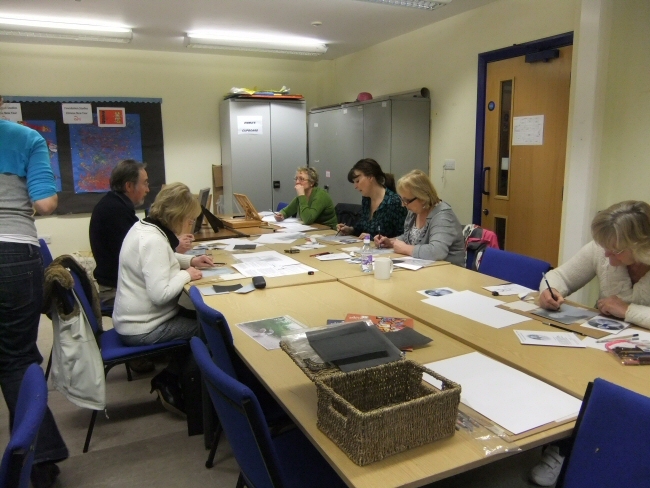 Below are various photos of members busy with drawing and blending along with a few images of some of Elaine’s work. 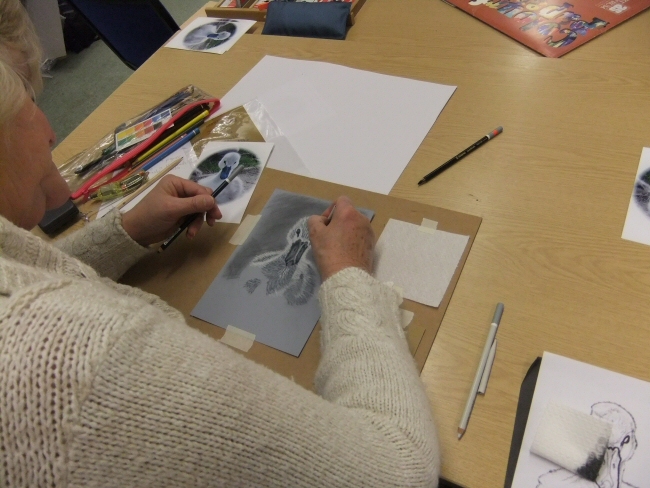 All in all it was an interesting session which encouraged those members who might not naturally take to drawing of graphite/pastel work; as well as providing points of interest and advice for those who are more familiar with the medium. I had heard of Tony Barrow from a number of sources, including our friend Alan Owen, and decided that I’d go and see what he was about. 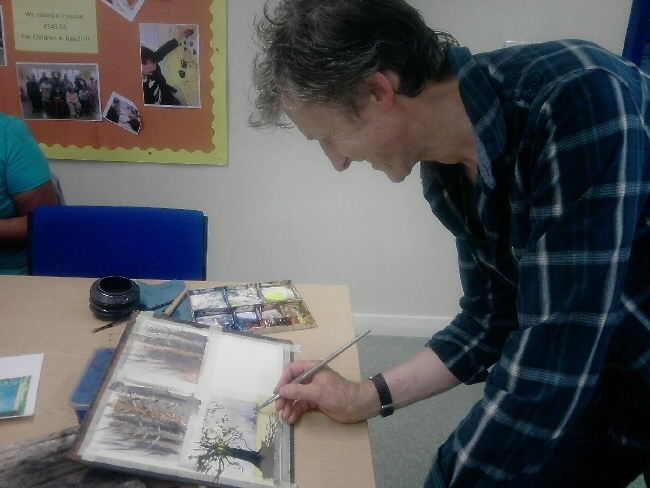 I discovered that he runs a watercolour class at Aspull Library on Thursday…….so I beetled off (about 5 months before this session) to meet him and see what he does. 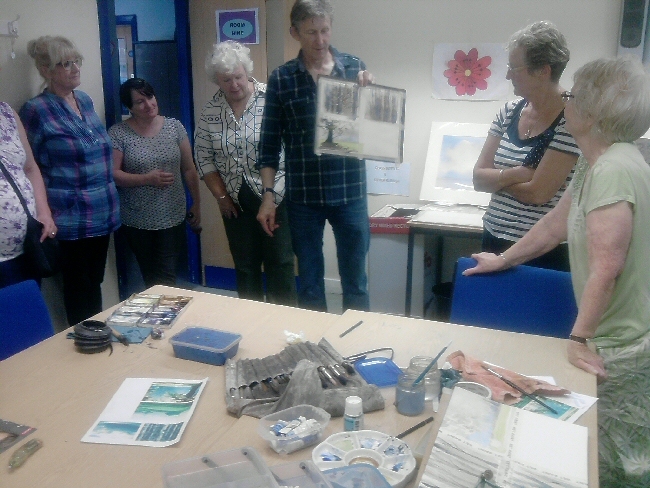 I was very impressed with the group at Aspull …….a lovely lot they were, and Tony took them through a watercolour of Staithes. It wasn’t the same view as he did with WAG but the process was similar. Watching Tony paint is highly entertaining and illuminating. He sprays the painting with a mist of clean water, sometimes to give a speckled effect, sometimes to keep the paint wet and workable. 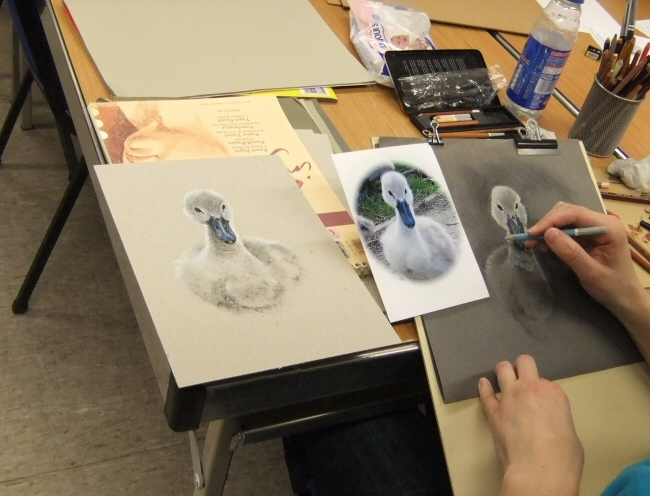 The pictures below are a sort of time lapse of his painting process. The first image is of the reference image that he used. Tony discussed the photo making note of where the light was coming from and where the darks and shadows lay. He “edited” the image as he drew it with the explanation that we were not necessarily trying to create a painting that the local planning officer would accept as a true and proper record of the size, position, or even existence; of every building in the view. We were to create a painting that was an impression of this view, that had the “feel” of it. 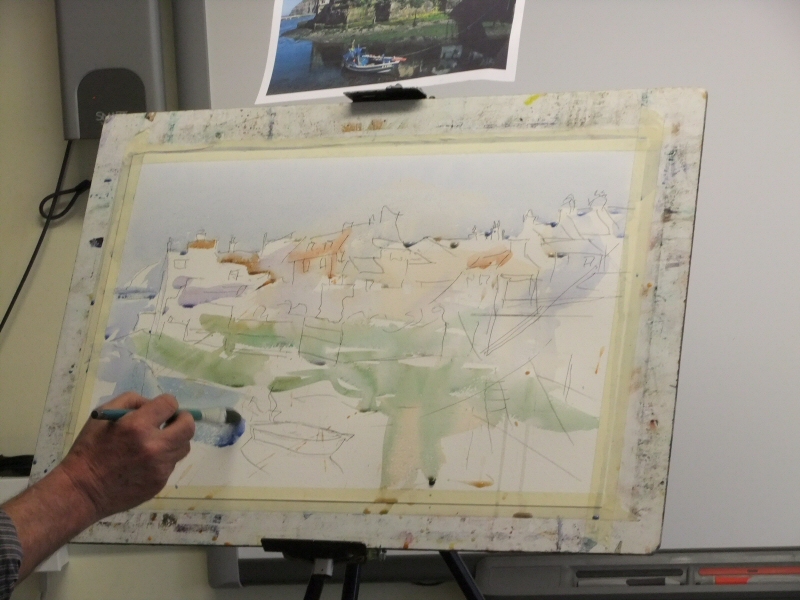 The drawing process was interesting and contained some good advice, the most unusual being that he turned his reference photo and painting surface upside down and drew the “negative space” of the sky as it meets the building tops. This is a very valuable lesson as we are all tempted, for example when we are asked to draw a house, to set off drawing a house as we may have it in our imagination rather than faithfully copy the one that is in front of us on the ref photo. This is a tip that I have heard of before but it is worth noting its value when attempting to recreate an image from a reference photo. 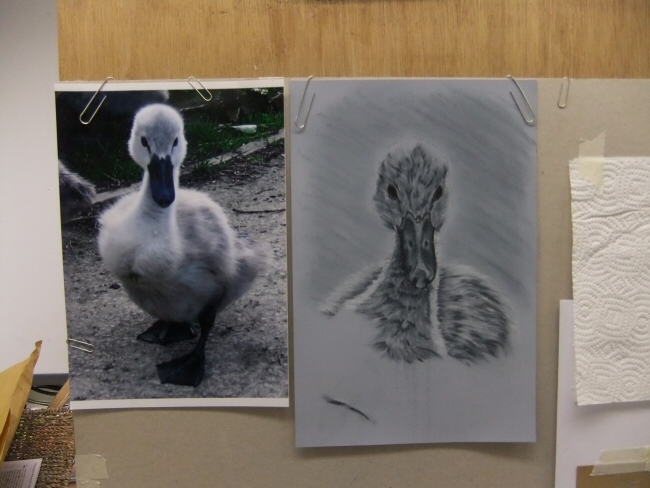 In the image above Tony has created the pencil sketch and has subsequently gone over the adjusted outline in pen. 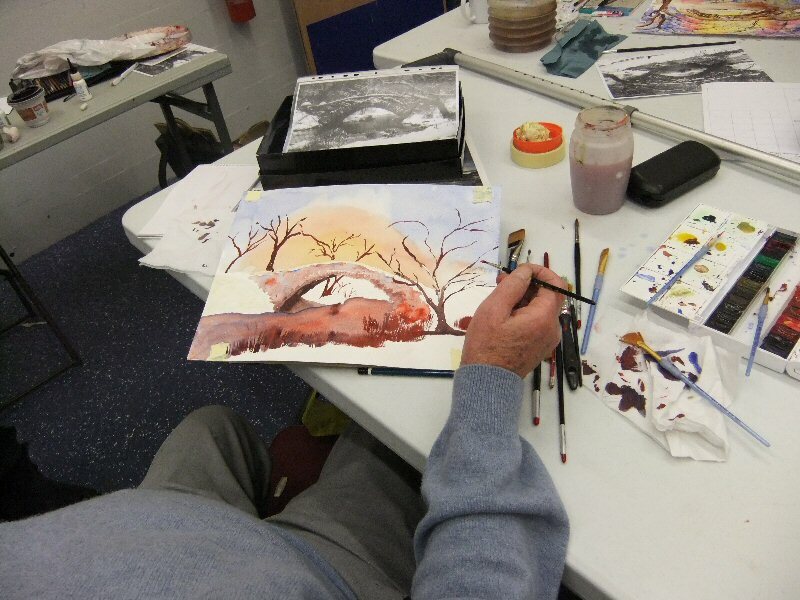 We see Tony erasing his original pencil sketch to leave his surface ready for painting. It would be advisable to use a pen containing waterproof ink although I can’t say for certain what Tony uses. 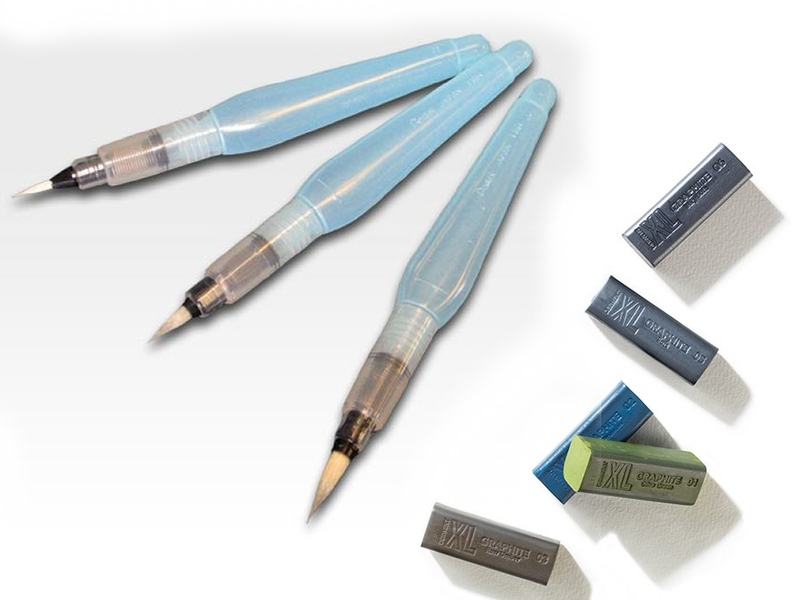 I have used pens by “Edding” that come in a range of thicknesses – 0,1 0,3 0,5 and 0,7 and, at the time of writing, cost approx £2.95. Click here to go to Ken Bromleys page for this product but it should be noted that Amazon sell these in bulk (ie packs of 10) that can work out cheaper. The photo above shows Tony lathering on lots of wet paint. You can see it running down the paper and he cares not a jot…….in fact that was the plan all along. 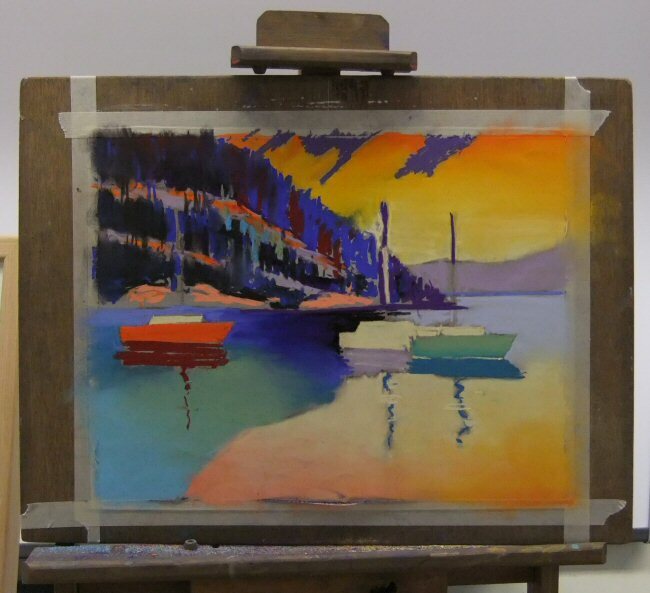 This is his “under-painting”, Tony suggested that he wouldn’t normally give a painting more than 3 layers paint, although this was most likely a general guide. His thoughts were that to do more would be to risk the clean look of the colours. Perhaps the most important lesson of the day was noted at this point and it was that we should take care of “the bead”. This is one of the most important observations to make when painting in watercolour because taking care of the bead will be the difference between a successfully executed painting and one full of dry edges. These “dry edges” conspire with “cauliflowers” to throw a spanner into the efforts of watercolour devotees and lead to much wailing and gnashing of teeth along with brushes slung down in disgust. So…..”the bead”……it’s that leading edge of wet paint that resembles a miniature tide of paint. 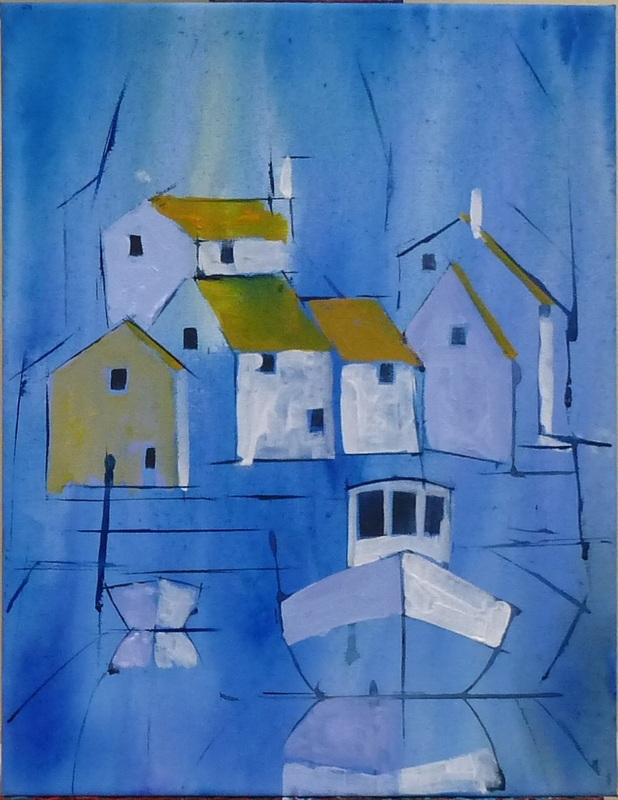 As long as you keep the bead wet until you get to a natural edge eg a mountain in your landscape, or, as in this painting, the roofs, then it wont dry in the middle of the sky leaving a hard edge where a hard edge shouldn’t live. This bead is created by using sufficient paint but that will quickly reveal whether or not your brushes are fit for purpose because a poor brush just wont hold enough paint. See the page “Just Staring to Paint?” for further help. The picture above shows the painting after the application of another coat of paint. We can see shadows and some dark features. 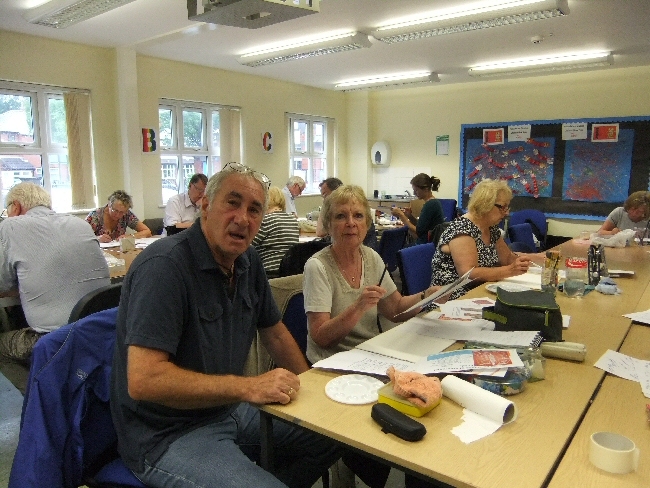 Tony explained that windows should not be painted with lots of detail, or, as he said “Don’t bother showing flower pots in the windows…..just add a suggestion of a window” We can see a spray bottle in his hand which was used to good effect in keeping the paint wet and workable. Above we can see the painting at an almost finished point complete with some very brave darks. It’s these darks that make the lights sparkle out. How many of us would have the courage? 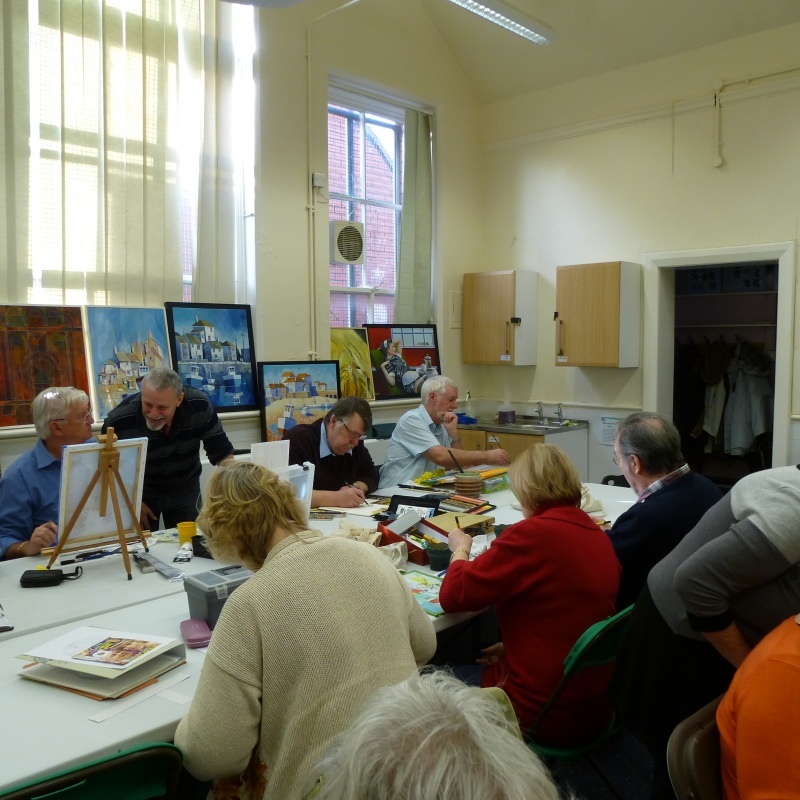 Above is the completed painting that can be seen on Tony’s website ……..and below are a couple of photos of the members having a bash at keeping up with Tony. He sets a vigorous pace and some chose to just watch and make notes. Either way it was an impressive and educational experience. 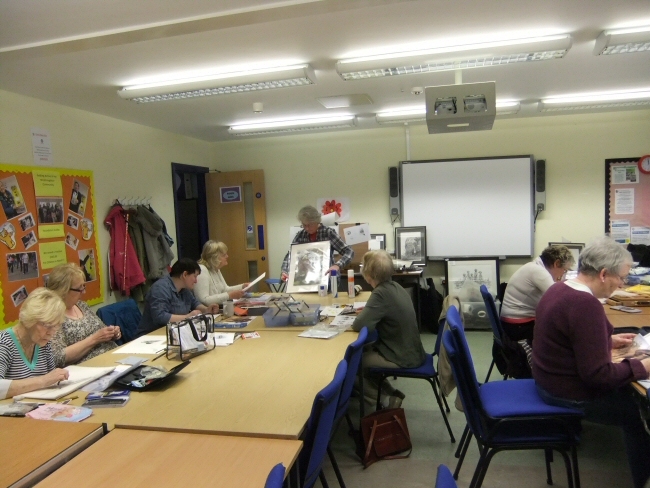 We can see 2 new people to the group, Kath and Maggie on the left in the foreground in the photo above, as well as Sue Falla who had surprised us with an impromptu and very welcome visit. 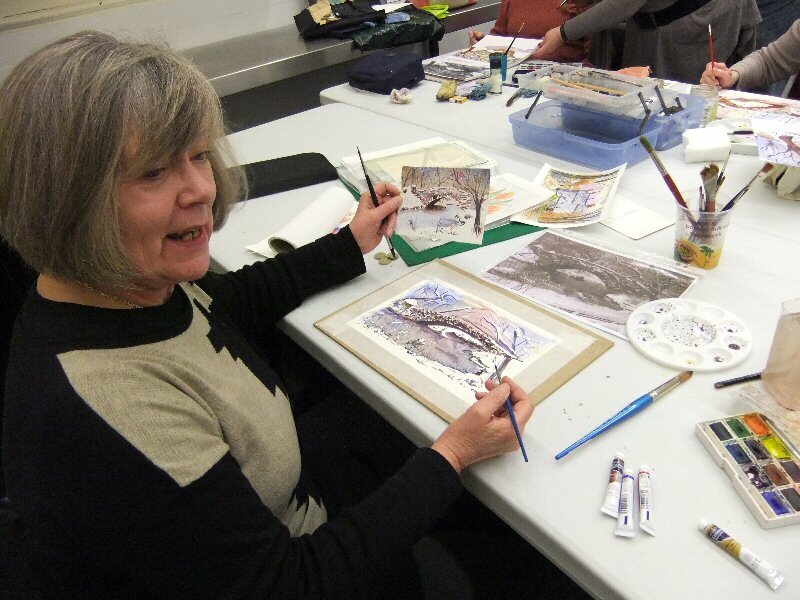 I have been looking for new artists to visit WAG for some time and Anita is just one of the fantastic artists/tutors that I have been lucky enough to find. 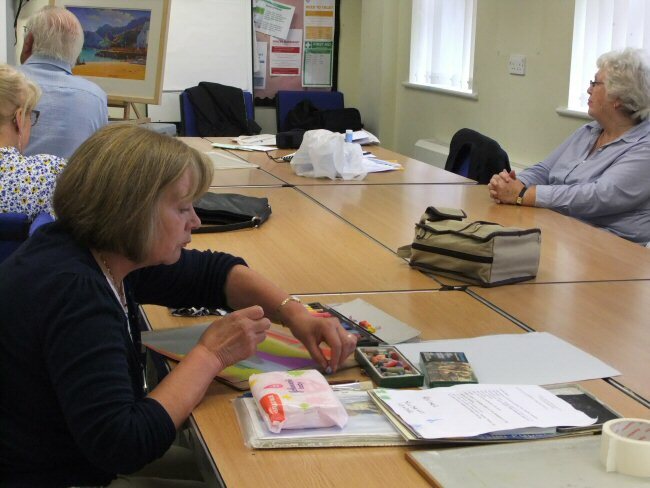 She was really well organised and we had taken the optional extra of a “Demo & Dabble Pack” – a set of equipment purpose made to suit Anita’s planned session. 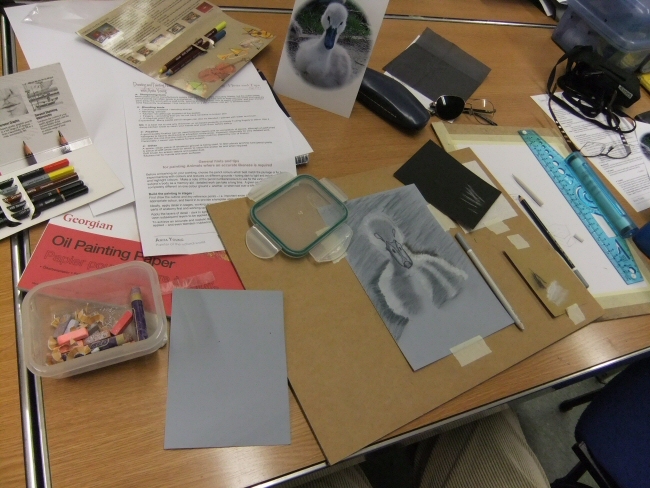 These packs contained a really comprehensive step-by-step guidance to our subject of the day……..a Cygnet called “Sid”, so Anita told us. The pack also contained pencils, 2 pieces of “ground” (ie Art Spectrum Colourfix Blue Haze pastel paper), eraser, blenders etc……so off we went. 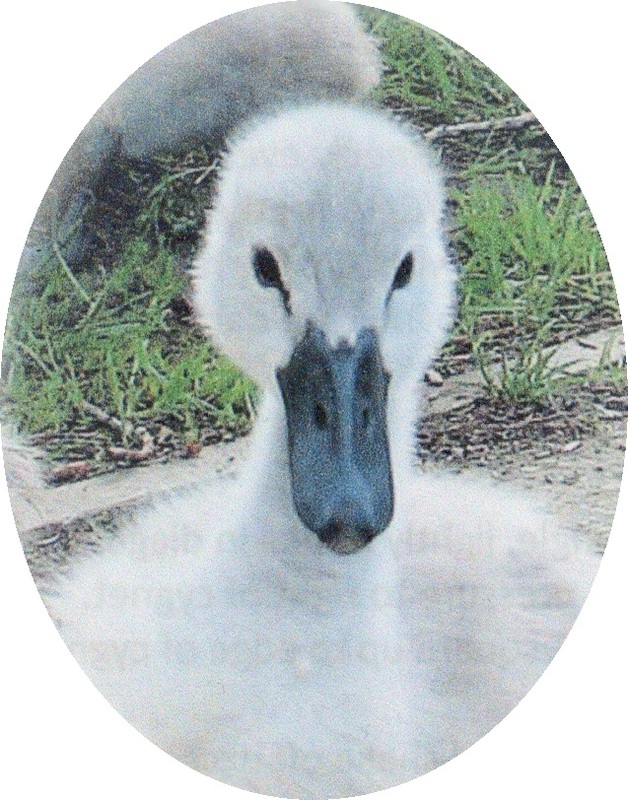 Sid the Cygnet – our subject for Anita Young’s session with us. 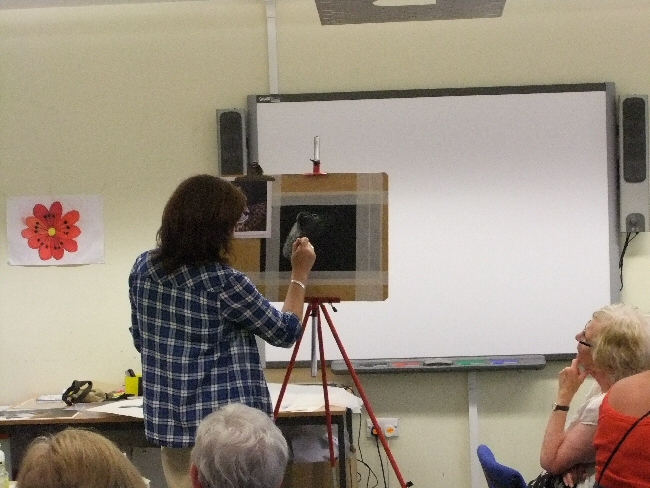 Anita (shown at the easel here) demonstrated a range of techniques and tips as she developed the picture of “Sid” as shown in the next few images. The group did what they always do….ie they approached this challenge with gusto and positivity. 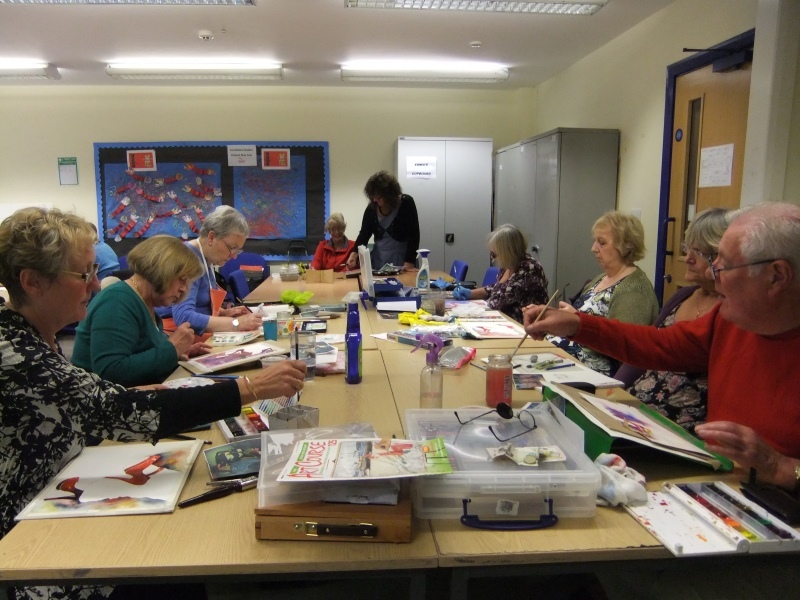 There are a number of members who would choose to use this medium and a subject of this kind…..the rest just relished the chance to have a go. 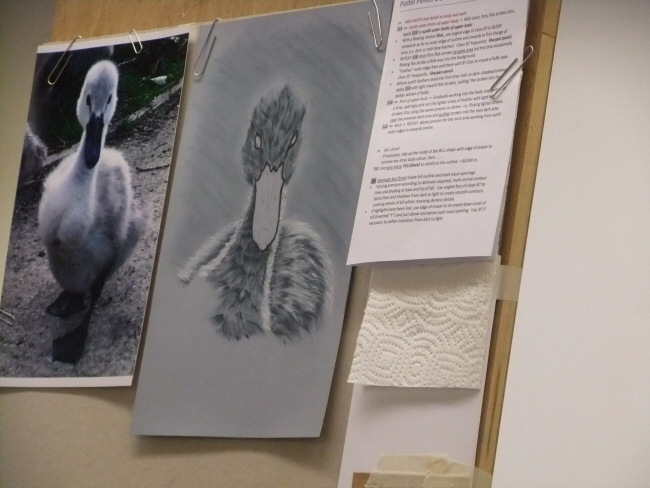 Michaels version above is at an early stage but he’s clearly got the hang of blending to create the fluffy feathers of this subject, while Julie’s more advanced version below shows that her earlier concern about her ability to create “Sid” were unfounded. Elise was in her element and, I believe, created two different versions of the subject. The one shown above looks tremendous. 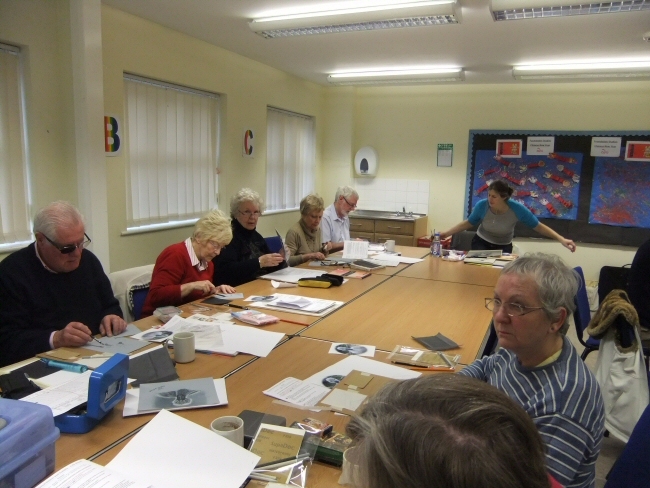 Below shows some of the group engrossed in their efforts. 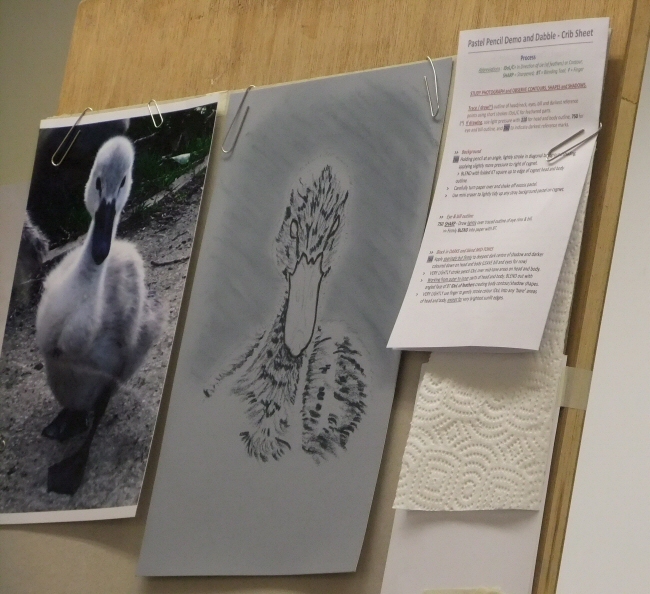 Below we can see Sally, who is a fan of drawing, enjoying the medium and creating an excellent portrait of the cygnet. Below is a version created by Gwen caught at an early stage. 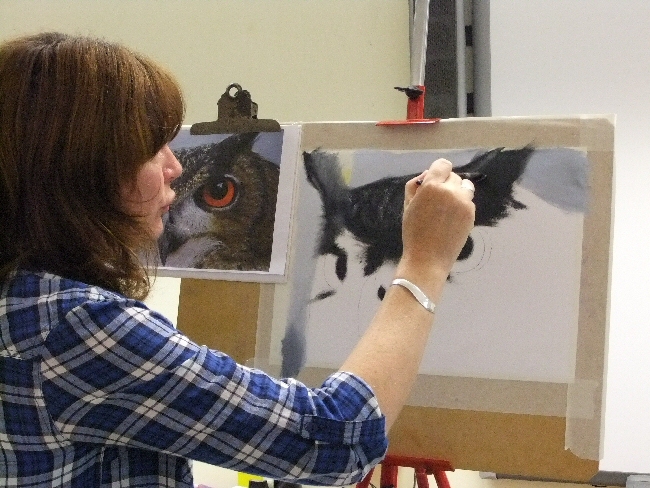 We can see her busily blending the feathers to give an almost fur like texture. Very effective. 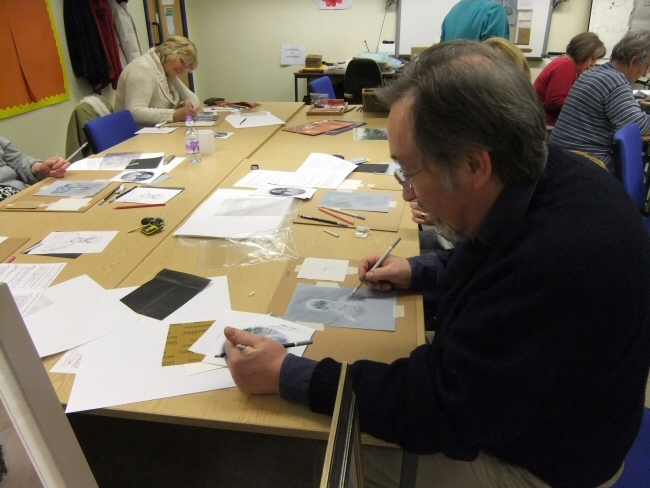 Below is David Halliwell, no stranger to detailed work, engrossed in this drawing session. 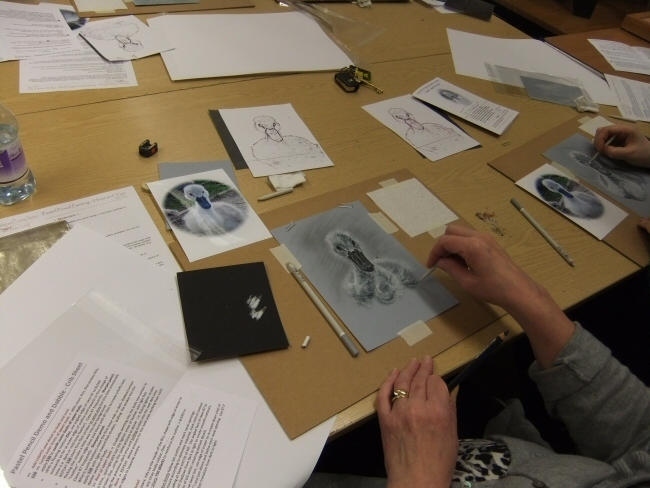 Above and below are photos of the group busily drawing and blending, each one of them produced a very credible reproduction of the photo of “Sid” Well done everyone. ……and finally ……. 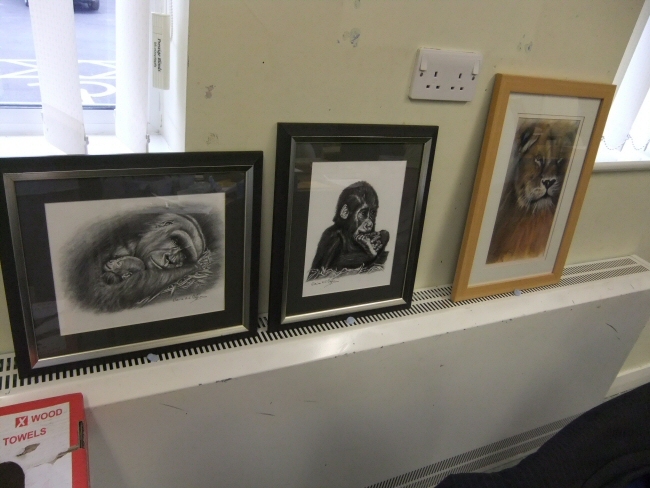 a photo showing some of Anita’s art. Visit here website here to see her art and find more information. Thank you Anita for a very different and interesting session. One of the things that I attempt to do is to give the group the widest spread of artists as I’m able to within the constraints of cost and availability. 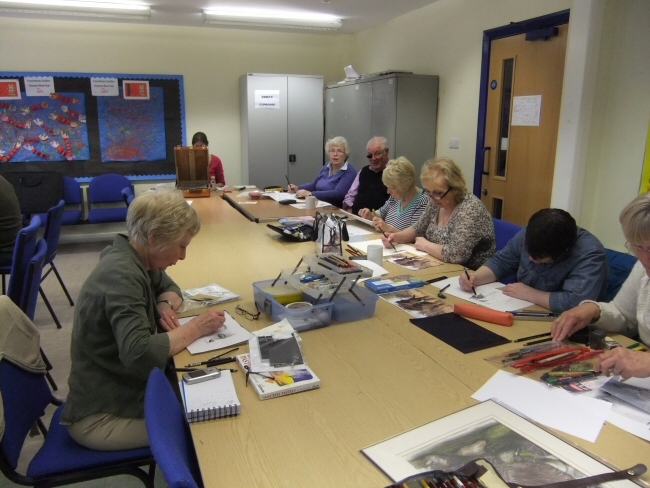 Prior to this point we have had some fantastic artists visiting us but I wanted some new experiences for the group. You get into that dichotomy of wanted to play safe and use the excellent people we have previously, versus trying new tutors and possibly being disappointed. I need not have worried as our first “New Tutor”, Judith Farnworth, is everything we could have asked for and more. 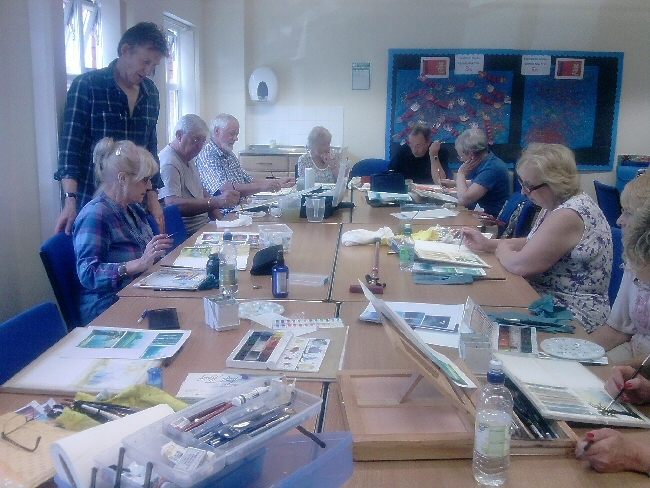 Carl Jacob is our second new tutor……..and he also turned out to be an excellent choice…… his acrylic session was brilliant. 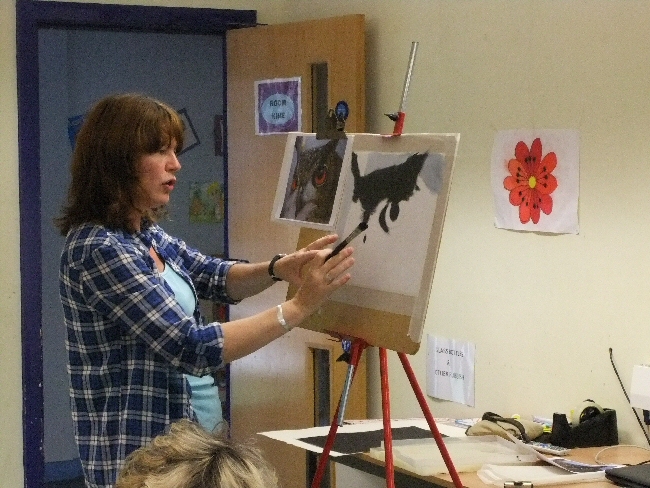 He introduced the group to using a palette knife to “draw” the picture using dark paint and the WAG’s did what they usually do….. they jumped in and had a bash……. 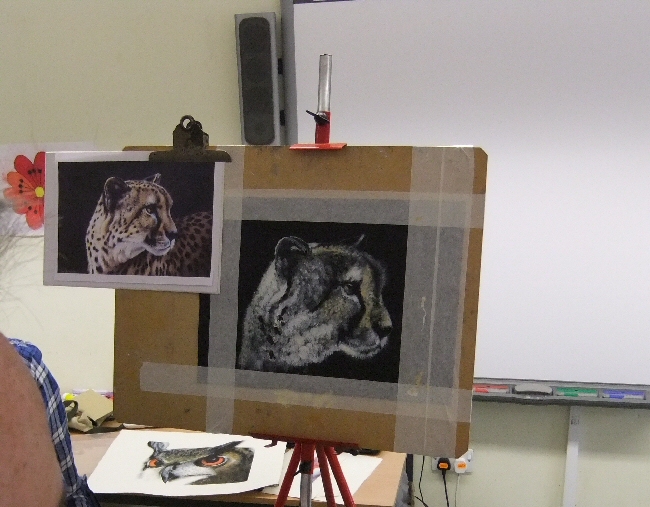 with fabulous results as you will see below (even if most of them were not finished at the time they were photographed you can see how good they are) Above we can see Kathleen Carrodus making progress drawing with her palette knife at the start of her painting and below is Vivian’s much more complete version. You can see her finished painting here It’s worth noting that Viv didn’t have a palette knife available so instead she used an old credit card. I think she did a cracking job. 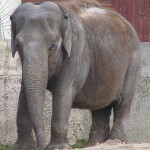 Above is one of those rarest of animals…. a painting by Dennis Openshaw (almost as rare as mine) I don’t know why he hasn’t shown us more of his work because as you can see from this painting even in its early stages; Dennis can do some good work. 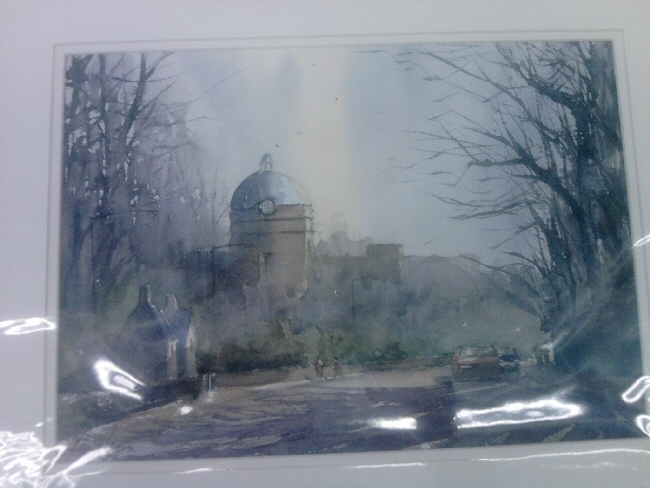 Below is a fantastic piece of work by Bernard. He wasn’t as pleased with it apparently but I love the fact that he has very much gone off in his own way and used a bright orange base. I think it works really well in its own right. Below is Eileen Halliwells work in progress….it’s going to look really good when it’s completed and has all the tape removed. Will she let me have a copy of it to put on a page for her?……I hope so. ……and below is David Halliwell‘s version. 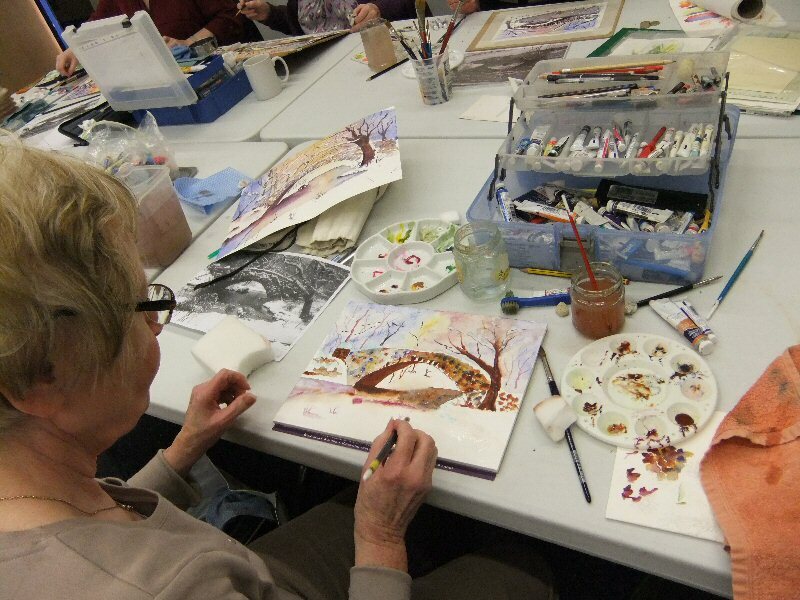 David does a lot of very detailed and fantastic Gouache paintings and has written a Gouache for Beginners based on his experience. 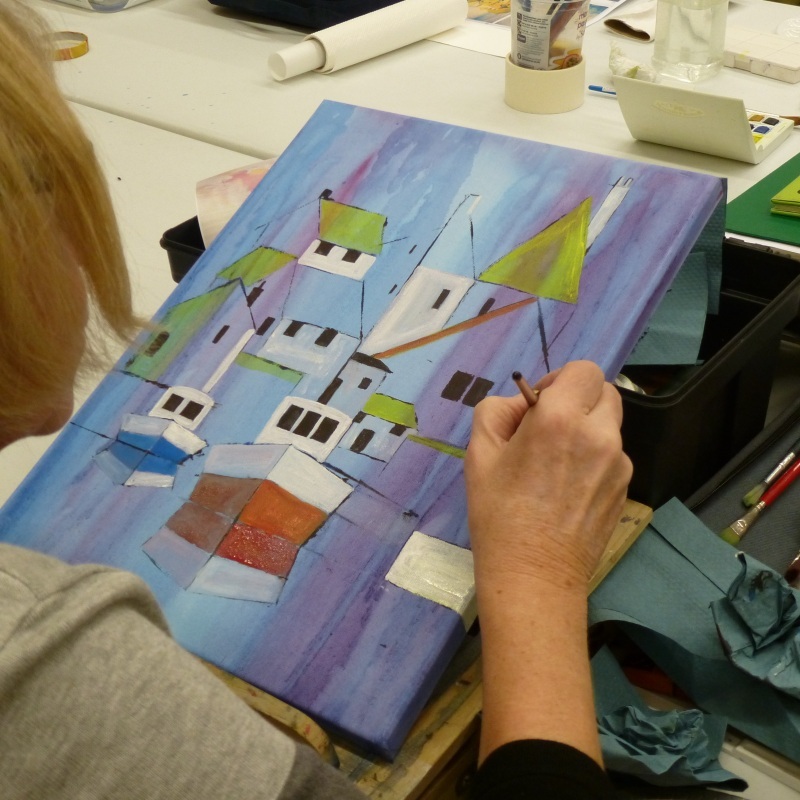 Below is Barbara Hill deep in concentration at the earliest stage of creating her version of this harbour scene. She is, like most of the group, very keen to have a go at new media, techniques and subjects. We can see below Gwen‘s version of the painting. She’s a bit of a dark horse if you ask me. One moment she was telling us that she couldn’t paint very well the next minute she produces the most fantastic flower paintings. She’s doing a cracking job of this too. 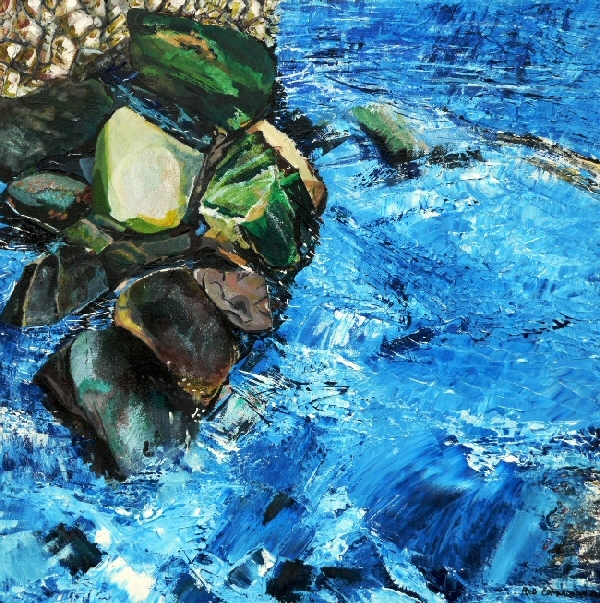 Below is Bernadette’s painting. It looked really good and very different (the photo doesn’t do it justice) her painting had a texture of brush-strokes about it that made for extra interest. 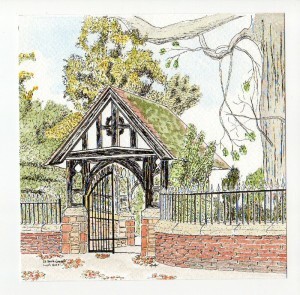 Anne has used some superb colours in her version below. 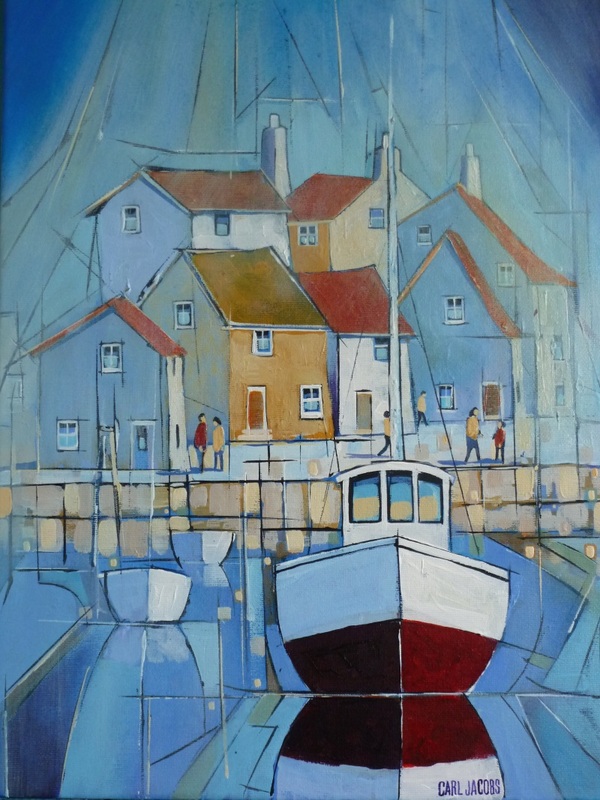 It was a real pleasure to see her wade into this painting, washing on loads of colour for the background before setting about drawing the boats etc. She certainly seemed to enjoy the process and I think it shows in the final product. Below are a few photos showing Carl going around the group assisting and advising. 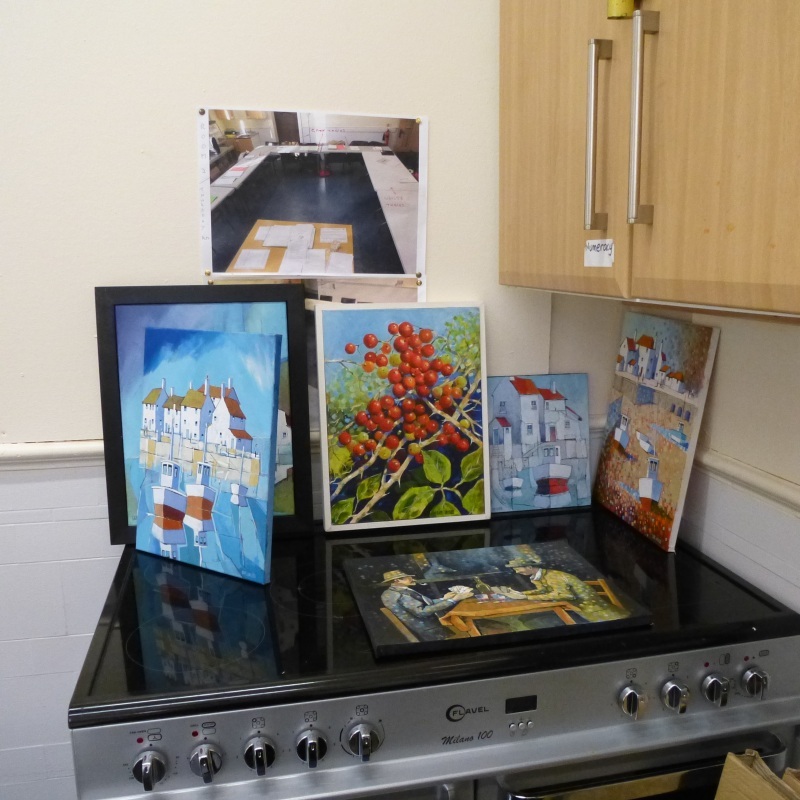 There are also some general photographs showing the group and some of Carl’s paintings. They really are very interesting and inspiring. Here Carl is advising Bernadette with Gwen looking on and below we can see him talking to Dennis. Above we can see Viv looking at Veronica’s work with Michael and Barbara in the background, and below are two photos of some of Carl’s work. 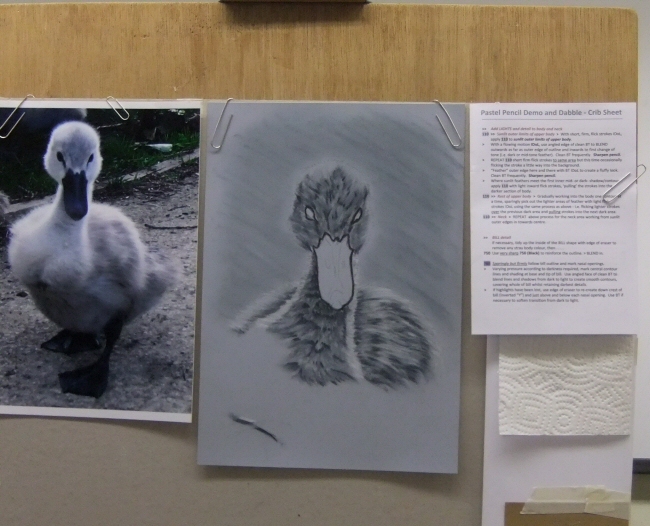 ….and finally a sort of time laps sequence of photos showing Carl’s version of this painting taking shape. There isn’t a finalised version but he tells me that he’ll send one when he finishes it. 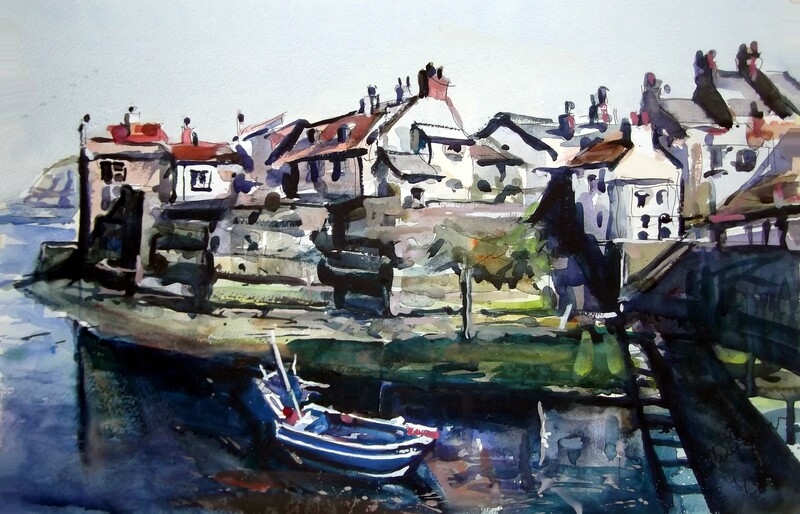 He stared by painting very wet acrylic onto his stretched canvas (not too diluted just enough to allow the paint to spread and run if required) Then he drew the profiles of boats etc using a dark paint mix applied using a broad palette knife. 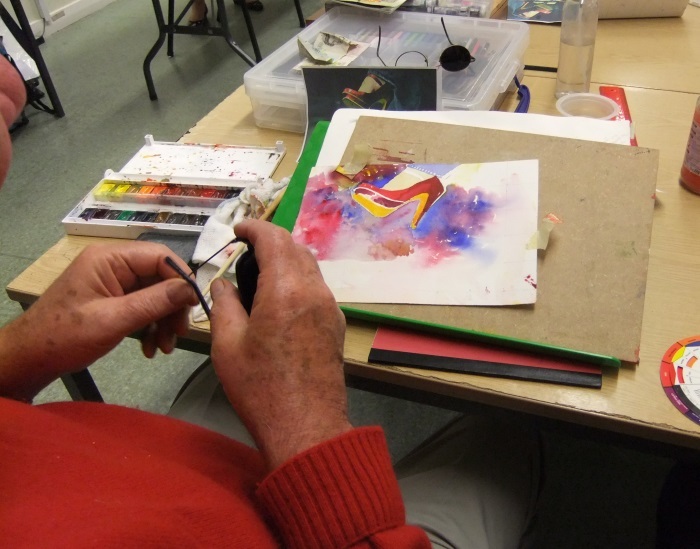 He then started to apply some paint without getting “to precious about it” – just whack it on in a very relaxed manner. 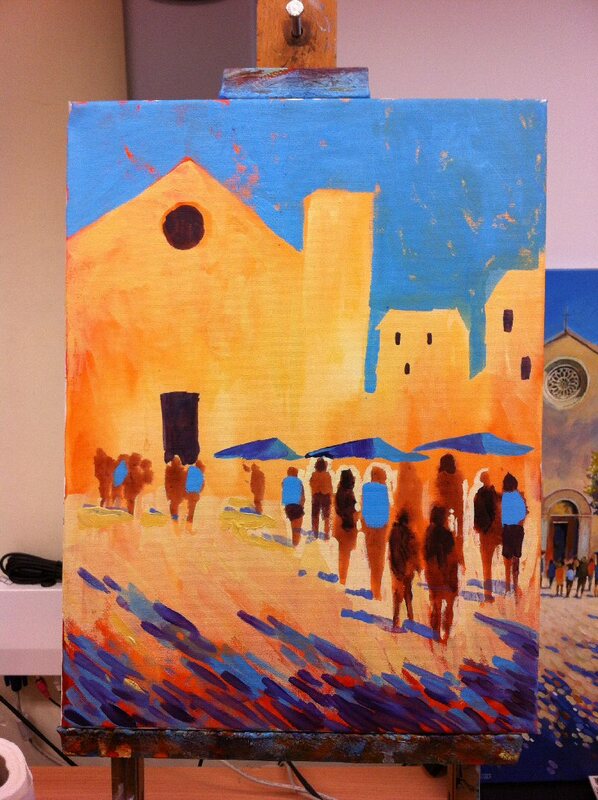 He added more colour and drew yet more dark lines with the palette knife. 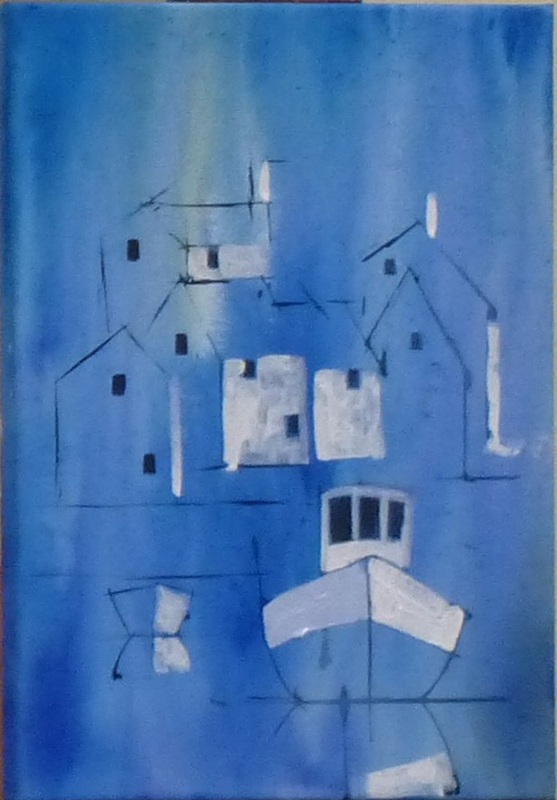 Some of these had no real purpose (eg the lines parallel to the boats) they were just for the “look” of the painting. This painting was to be as much abstract as figurative. 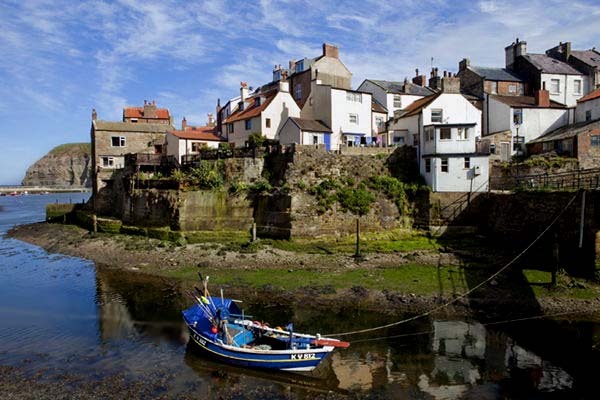 More work on the boats and houses although he would revisit the cottage roof to change its colour. This was quite interesting as it demonstrates two things. One was how easy it is to change your mind when using acrylic and the other was that Carl stepped back from the painting and declared that he thought that he’d change it. He’d allowed himself the chance to try a colour but later was quite relaxed about changing it. He added some of the change colour to adjacent roofs without making them the same. 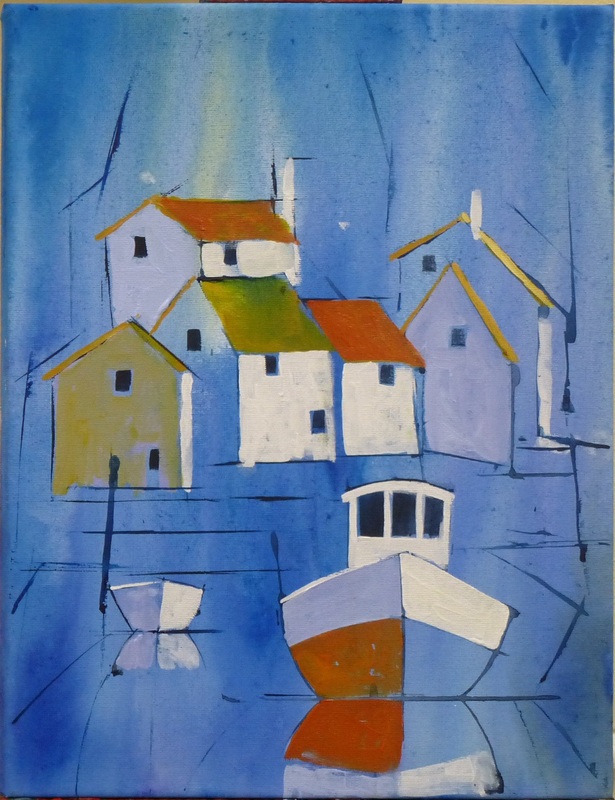 This use of the same colour meant that there was a harmony within his painting. 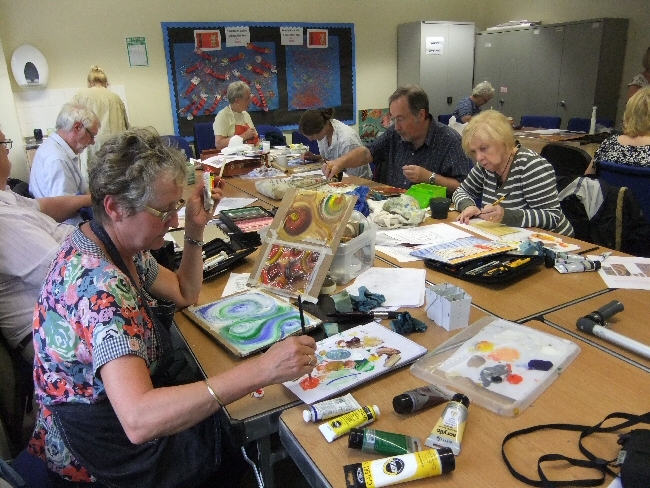 This final version in the session shows extra work and the addition of a few people into the painting. The addition of figures is a very useful ploy to help in giving a painting a sense of scale, but Carl emphasised the need to be careful that the people are sized such that they would be able to enter the doorways that they are near. It’s an easy mistake to make and only realise later when you see that a person is twice the height of a doorway. 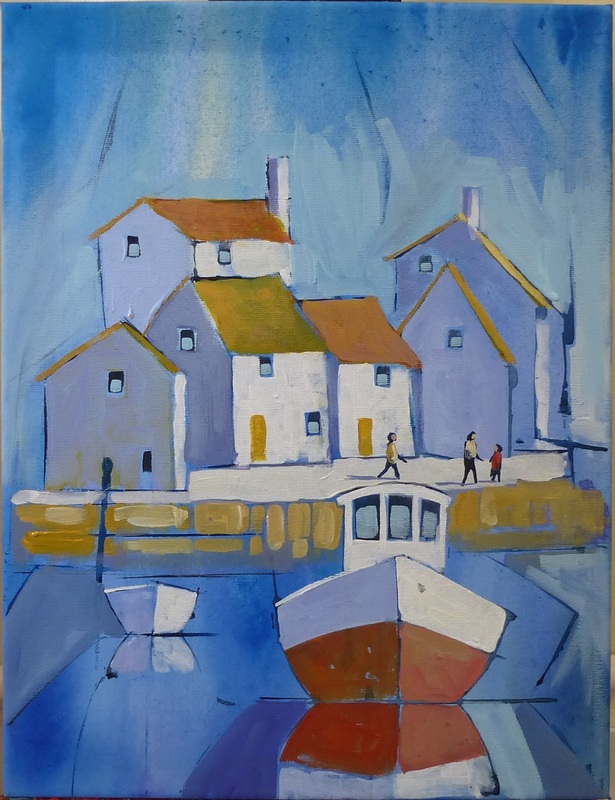 Carl has since supplied the finalised version of his Harbour Scene above and it’d be a good exercise to print the last two pictures and play “spot the difference”…. there’s a few. So thanks Carl and he will no doubt be back with us sooner rather than later……a very good session by all reports. On this day our subject was to be, what was at first look, a very unpromising subject. Our reference picture was a rather gloomy photo of a bridge. Well….. fair play, it was a very well composed photo but this was going to be an object lesson on how to start with the inspiration of a rather unpromising reference picture and end up with something quite vibrant and exciting. Judith was going to be our guide on this journey…….and as you’ll see from the images below, she did a fab job……as usual. 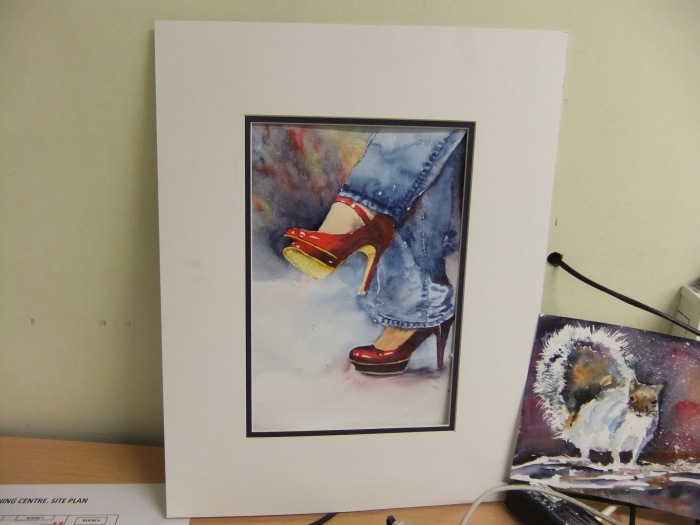 Shown above is Julie Roberts uncompleted version with the ref picture in the background and below is Barbara Hill‘s work in progress. 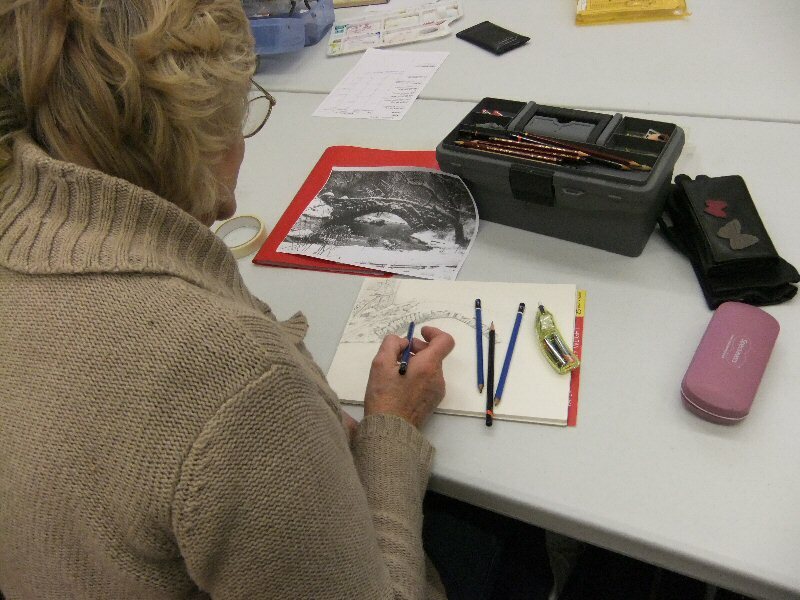 Sitting next to Julie is Sally who is a great fan of drawing and here we see her pencil drawn version……. a lovely exercise in tone. 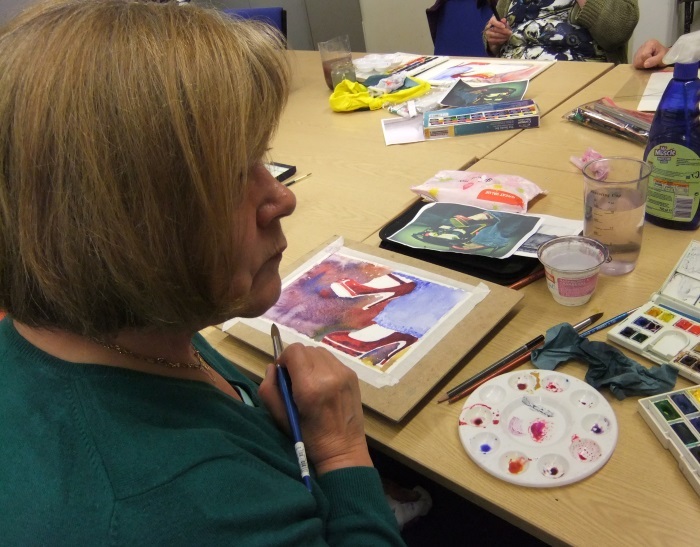 It’s fantastic to see the variation from one painting to another as each artist creates their own interpretation of the painting. All superb but each one containing something of the painters personality. There’ll be a collection of them together at the end but take note as we look through the individual ones. Above we have Bernadette’s version in the making (with Vivian behind her) and below we can see Vivian herself proudly showing her version. 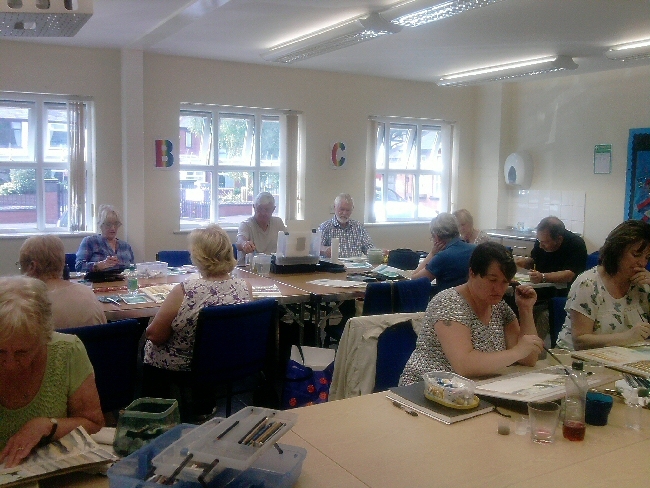 Behind Viv (on the left of the photo) sits Veronica who is a fairly new member. 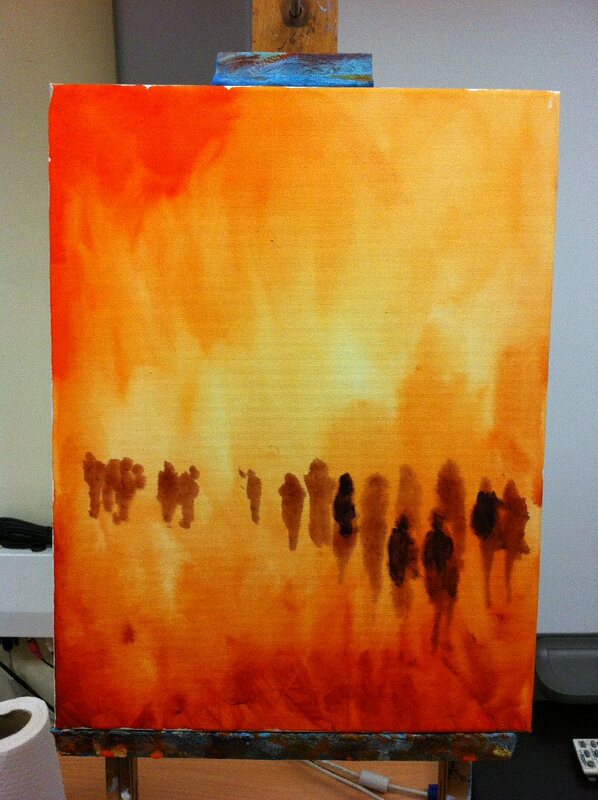 She (as a lot of people are sadly) is quite hard on herself for what she sees as less than stellar effort at painting. I’m sure that everyone can see from the photo below that she really has no need to worry …….she’s done a super job. 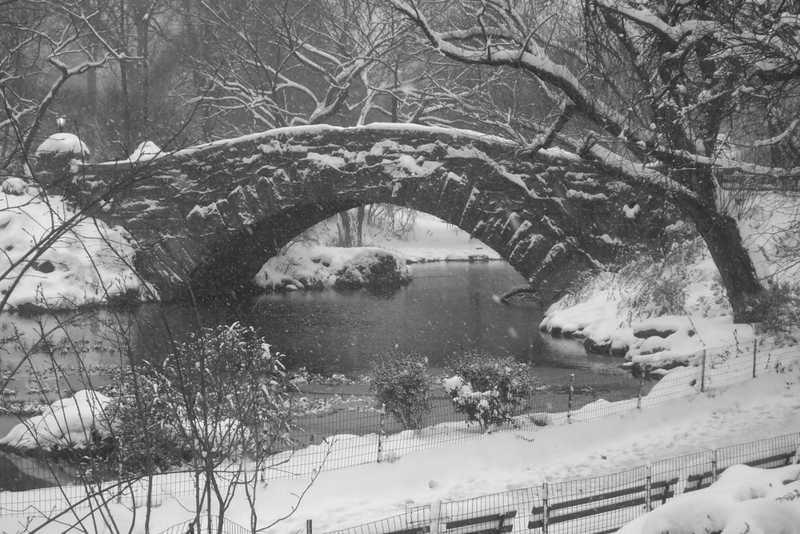 The next photo is of Michaels version of the bridge. 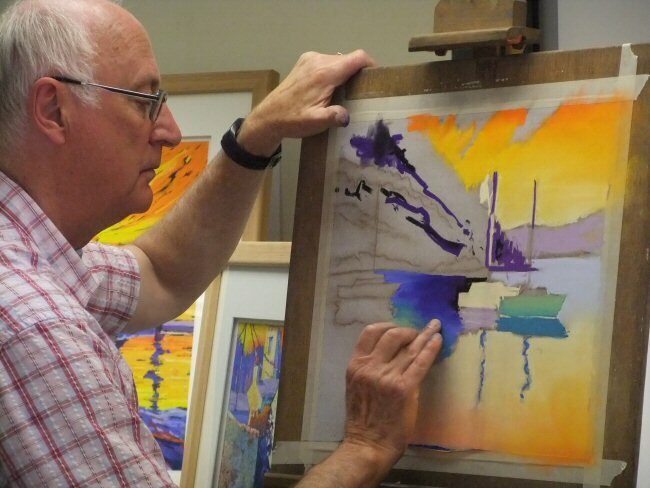 He is a fairly new member and came to us with a self professed lack of exposure to art but also a fantastic attitude to trying new things and as you can see , his painting-in-progress is looking very good. 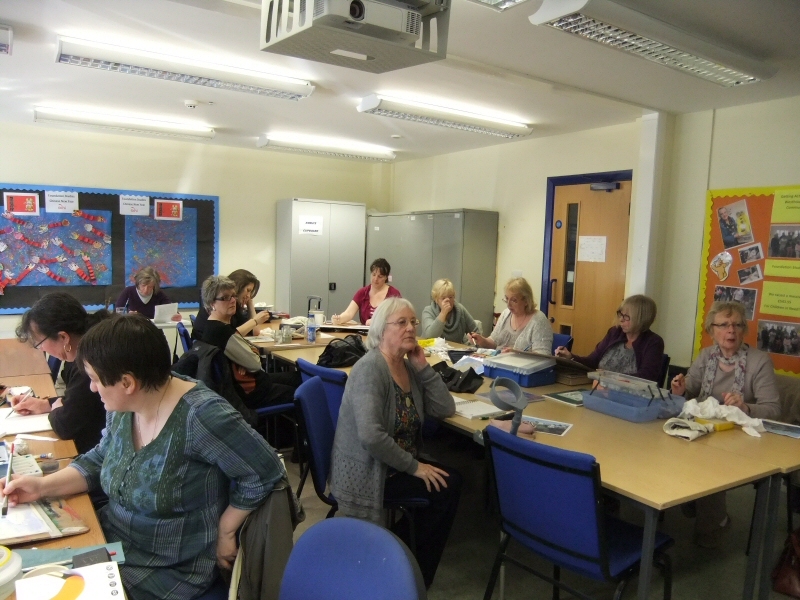 Below are are three group photos showing Judith (Stood on the left talking to Barbara) going around the group chatting and advising the members. In the background we can just see a collection of art brought in by Judith. 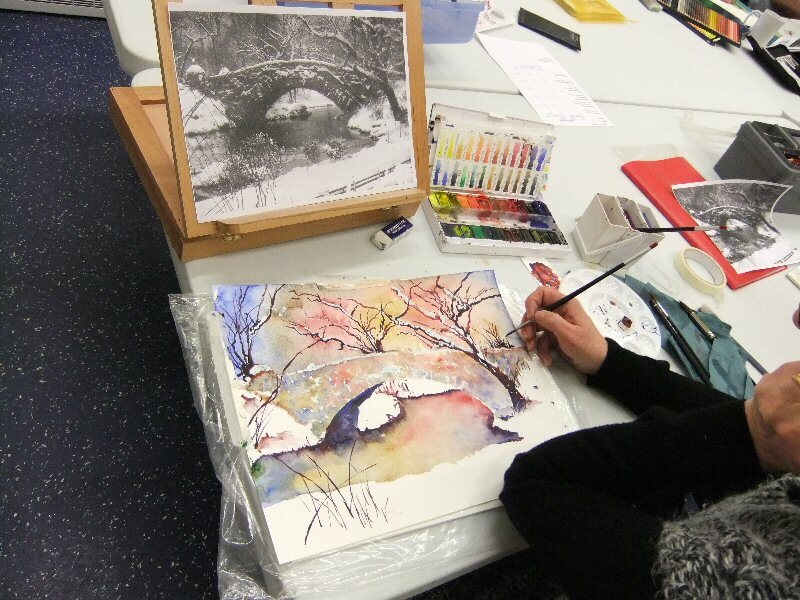 Her work is inspirational…… go to her blog here to see more of her work. …we can see collections of our work together. 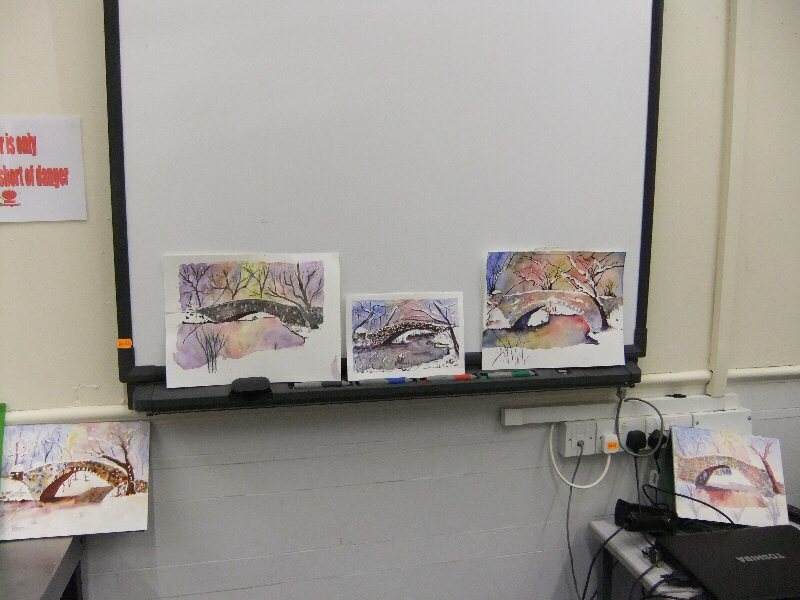 We wanted to see the different ways that the group had created their paintings and so we propped them up against the wall and stood back to admire. What a brilliant display….and yet another cracking session from Judith. We look forward to another visit from her soon. 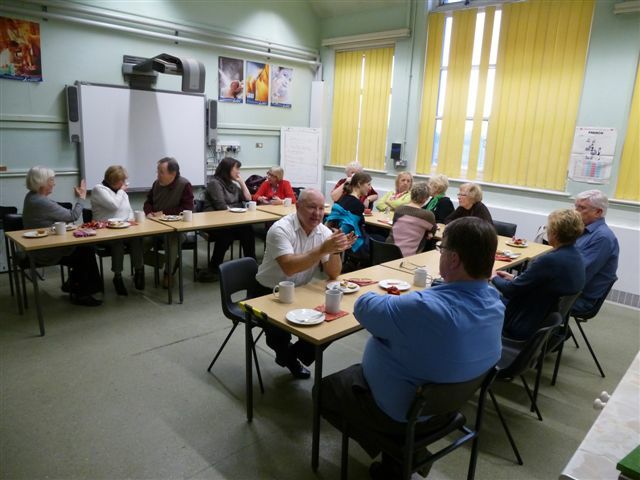 Each year we have had a little celebration on the last group session before Christmas (……There has only been 2 Christmases before this as WAG started in September 2010) On previous occasions we have each brought in a little bit eg pies, mince tarts, sausage rolls etc, and it’s been very gratifying that everyone joined in with a will. The only downsides to creating this “Jacobs Feast”have been the need to shop for and bring in, the items as well as tidying up after ourselves; along with the slight problem that a few people might bring in, for example, mince tarts. 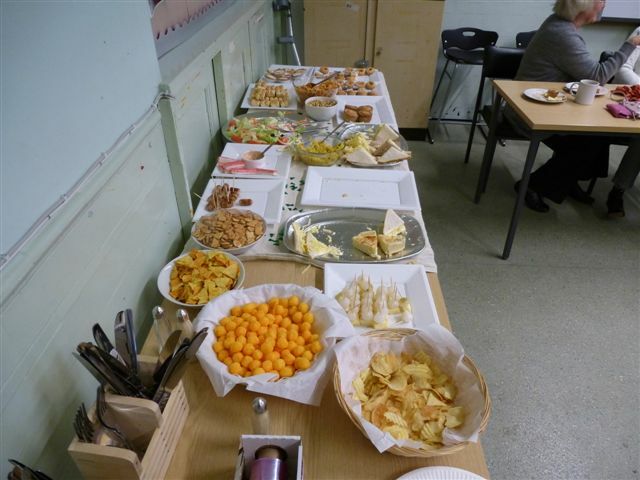 This year we decided to indulge ourselves a little and ask for the cafe staff, Debbie and Sheila, to create and supply a buffet for us. They did a tremendous job at a really good price and cleared everything away too ! !…..thanks ladies. Our very own WAG photographer Michael supplied the photos below….thank you Michael. 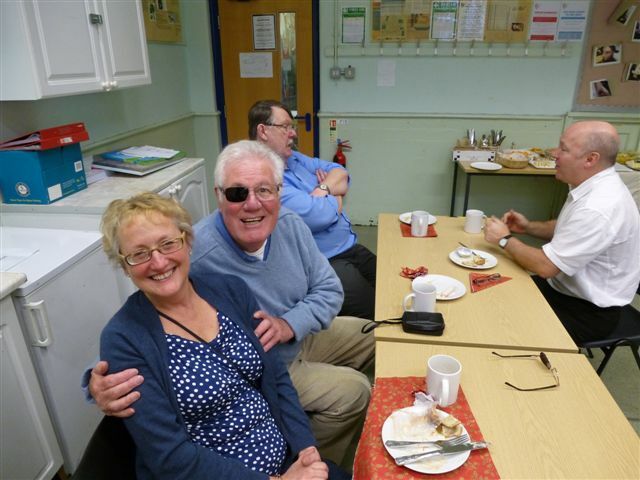 Here’s Michael and Julie full of the joys of Christmas (and good food)….in the background is that Scallwag Dave Hendry (on the right) and Geoff on the left. The gang is all here (well nearly all…… except Bernard, Veronica and Michael who was taking the photo) We also had the great pleasure of welcoming Sue Falla to the event. She had “emigrated” to Cheshire some time earlier in the year but is much missed so it was smashing to see her. 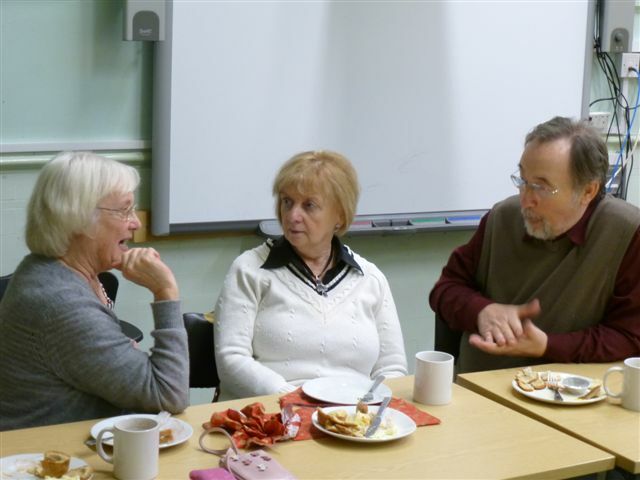 Here we have Valerie (on the left) in deep conversation with Eileen and David Halliwell. It is said that you are what you eat so this was a bit of a worry……. It all went very well indeed……. good food, good company, good friends…… and no cleaning up to do either !! 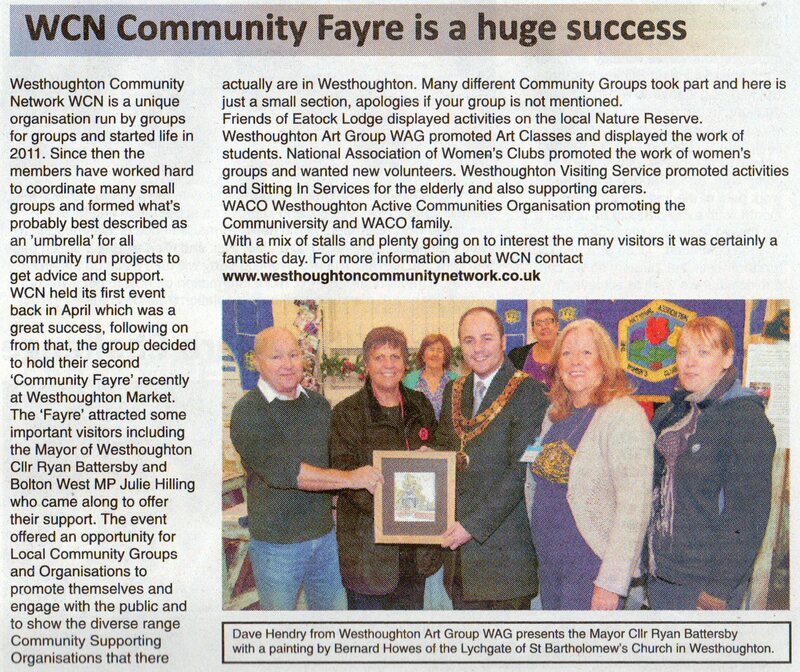 This was an event put together by Westhoughton Community Network, (WCN) an organisation that WAG is part of. 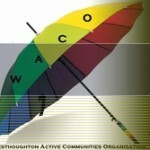 I attend meetings on behalf of WAG and I was heavily involved, via a sub-committee, in the preparation of this event. We had originally been lined up for one stall and then, because some stalls had not been taken, we were asked to take one and a half stalls. On the day itself it became clear that the organisation that we were sharing one of our stalls with could, after all, have a stall of their own. We therefore spread out across two adjacent stalls. 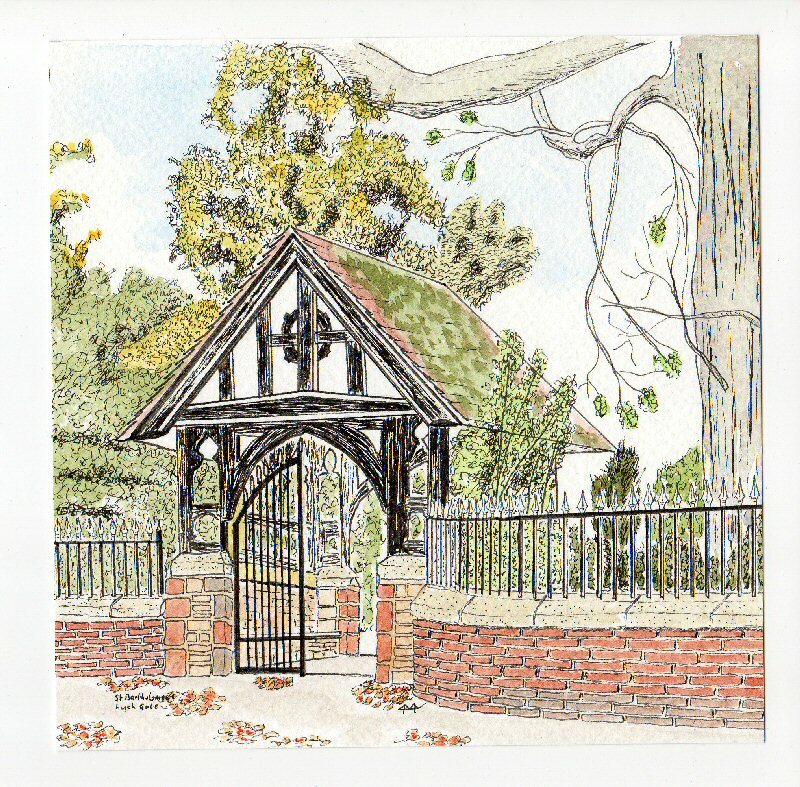 We were visited by the Town Mayor, Councillor Ryan Battersby, and I was able to present him with a painting of the Lychgate of St Bartholomew’s Church in Westhoughton. It was painted by our own Bernard and I presented it to the Mayor as Bernard was nowhere to be found when the photographer was around. 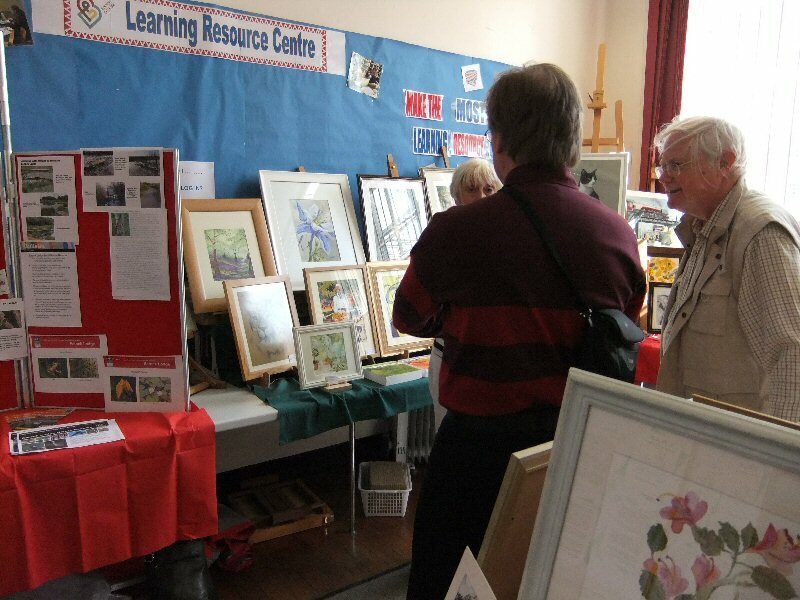 Just one of the photos that showed a stall full of the group members art. We can just see Gwen hiding behind a picture. Above is the photo taken by our friends, Vic & Denise at “Living inBL” at the event. They are always very supportive of us, as well as being lovely people. Also shown (between myself and the Town Mayor) is Julie Hilling, the MP for Bolton West. She is a great supporter of these events and takes the time to speak to as many people as possible during the running of them. 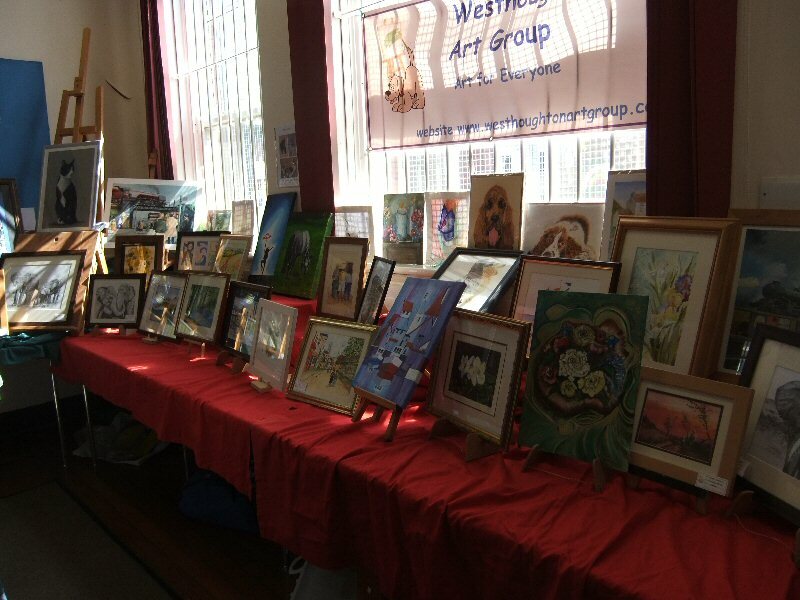 I’d also like to mention the support given to WAG by Elaine & Margaret from “Community Corner” on Wednesdays on Bolton FM and, if I get permission, I’ll put a clip of their mention of this event. 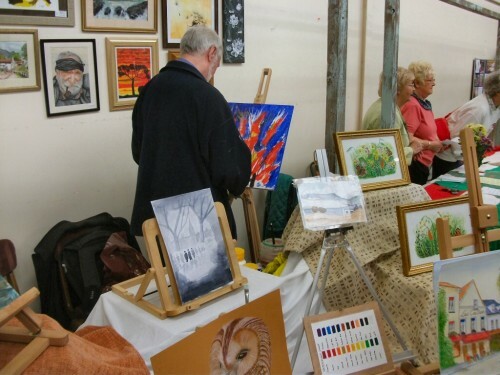 WAG held its first ever independent exhibition in September 2012. It ran from Tuesday 11th September to Saturday 22nd September inclusive and was accessible to the public on library opening days. I’d had a stab at creating a publicity poster for the event and asked for help and comments from the members. David Halliwell had a try at creating a poster and came up with the one shown here…… which was hugely better than my efforts, so that’s the one we went with. 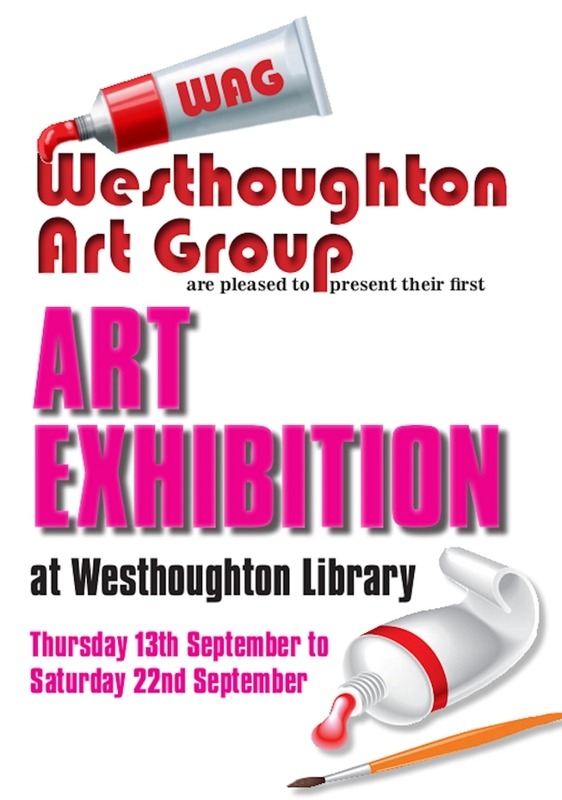 The more observant among you will notice that the poster says the exhibition runs between the 13th and the 22nd September while the title of this bit says from the 11th September. That’s because the banner was to advertise it to the public and the first public viewing was the 13th September as the 11th was the official opening complete with wine and nibbles. 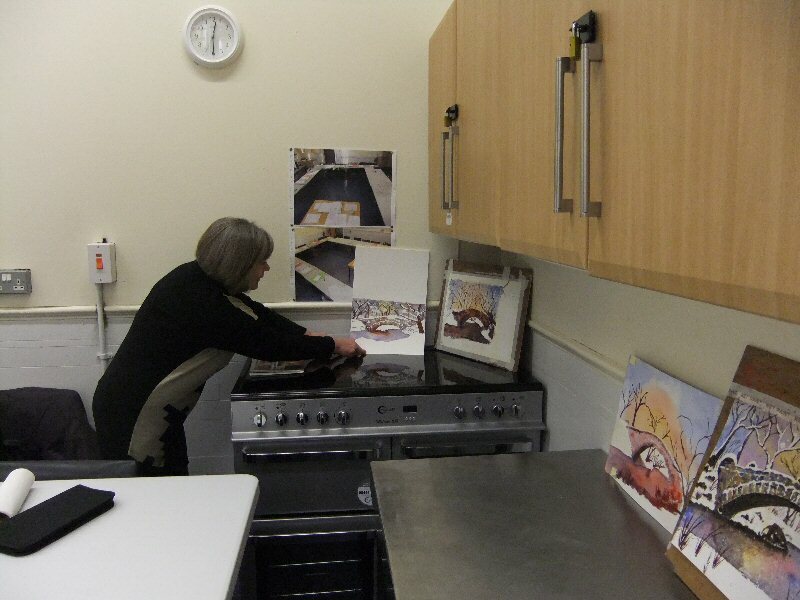 As you can see, we managed to get someone much more photogenic in the photo above, as the lower photo is of Elise with her beautiful pastel artwork “Osmaston Village Derbyshire”, which won the public’s favourite picture award by polling the most votes on the opening evening. 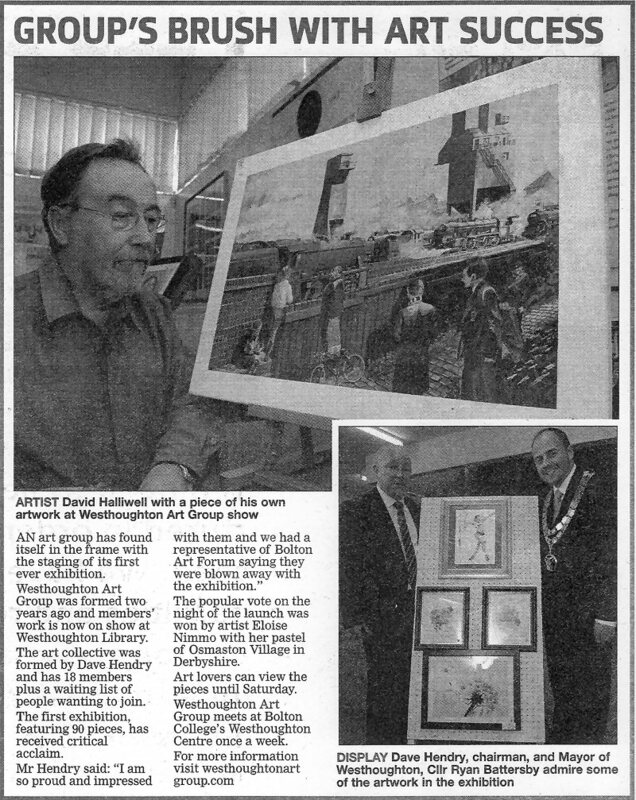 It was a close run thing though because David Hallwell was just pipped at the post with his Gouache masterpiece “Over the Fence” shown here in a black and white cutting from the Bolton News. The whole event was, in my opinion, a success full of terrific moments for me. Perhaps one of the best was to look over the room to see a lady of some maturity with the biggest smile on her face as she saw her own art on display. Her pleasure was fully justified as her art is excellent and getting better as her confidence grows. People ask me why I do all the stuff for WAG that I do and I tell them about that moment….payment in abundance. I have represented WAG at the meetings and was pleased to be part of this event. Having said that I wasn’t available to actually take part as I was on holiday but the members put on a superb show to the extent that quite a few people went out of their way to compliment us on it. I wasn’t surprised but it was gratifying to hear it non the less. 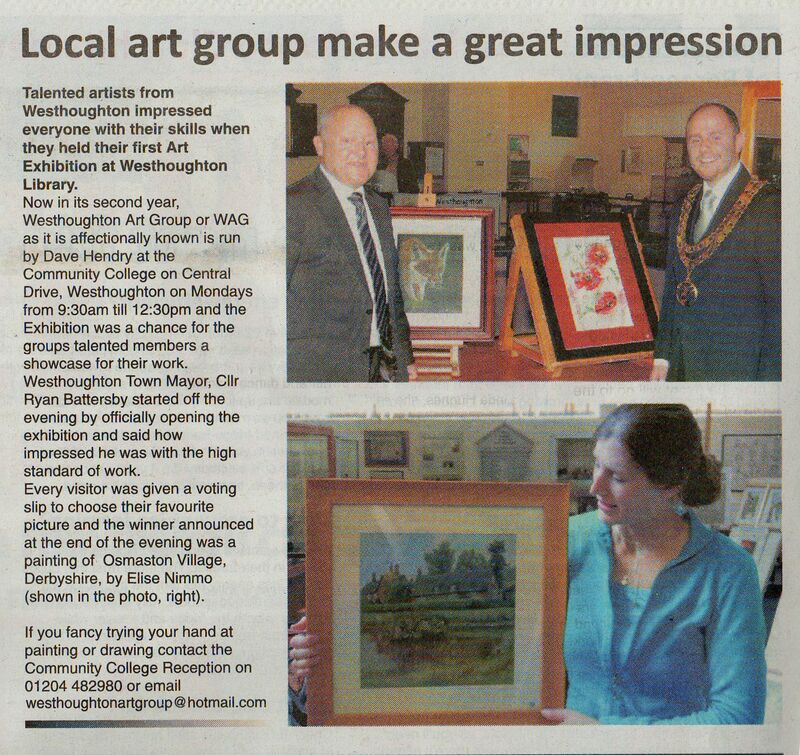 Above you can see (from left to right) David Bradley, Sue Falla and Geoff Fielding in a photo courtesy of the Horwich & Westhoughton Advertiser. 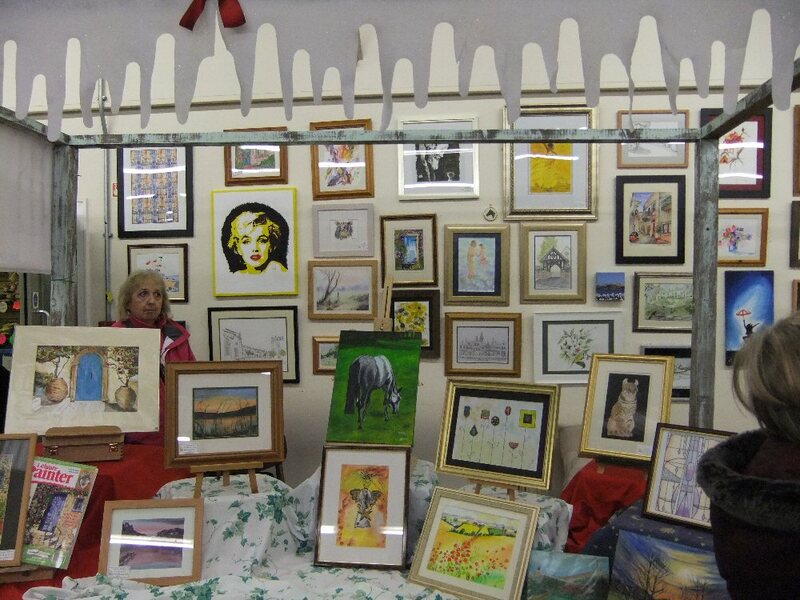 The photo above is a rare glimpse of Bernard in the wild…… painting while on the stall. 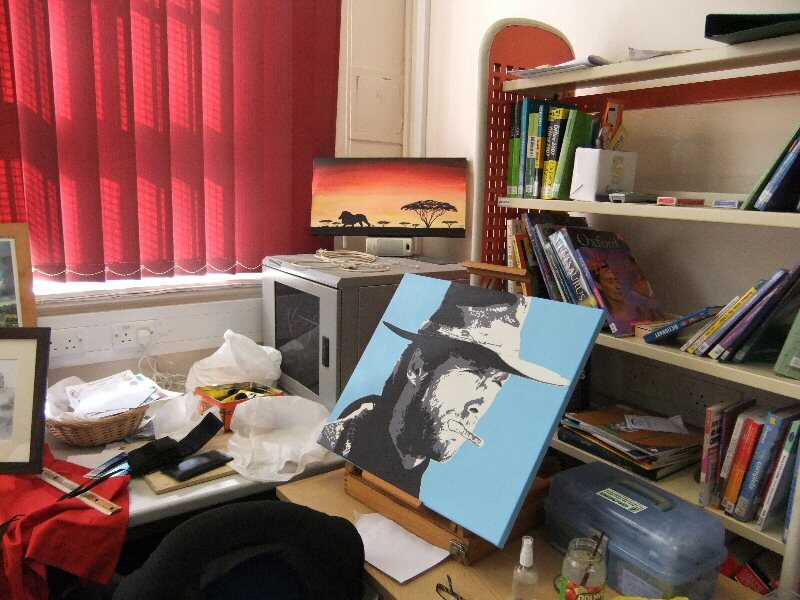 I thought that it was such a good idea that I copied it for the November 2012 Fayre and worked on an acrylic pop art of Clint Eastwood. 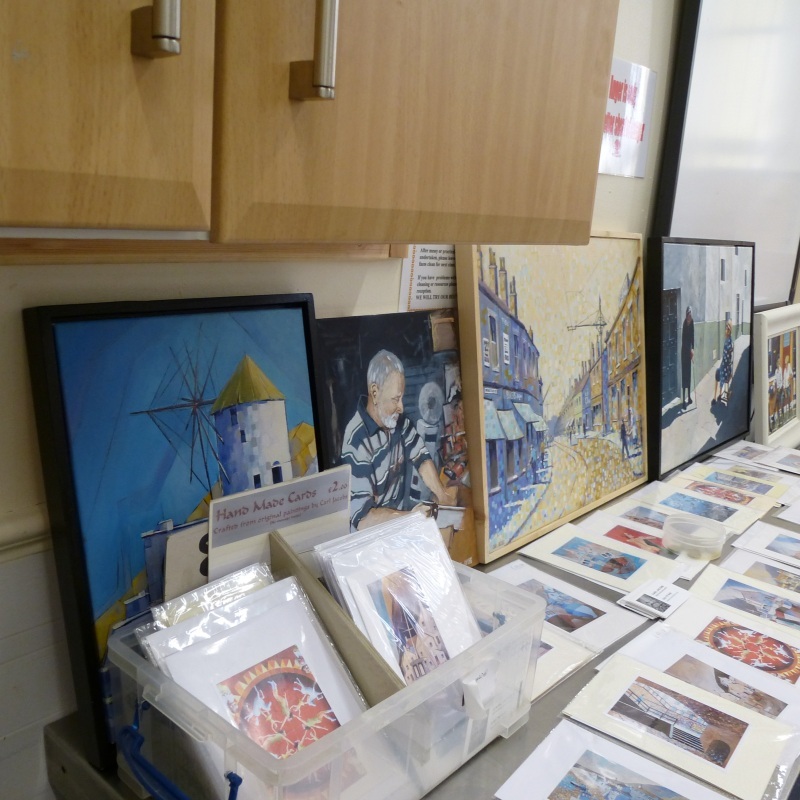 Just a glimpse of some of the art on display that day as well as showing what a tremendous job was made of the display itself. These things take quite a bit of preparation, imagination and work and it all paid off beautifully.